My trip from Baghdad to Basra, taking in the many millennia of history at the National Museum of Iraq, wandering through the historic Souk al-Safafeer in downtown Baghdad, climbing to the top of the Malwiya Minaret in Samarra, exploring the looted shell of one of Saddam's former Palaces, joining the throngs of Shi'ite pilgrims at Imam Husayn Shrine in Karbala, visiting the tomb of the biblical prophet Ezekiel in Al Kifl, enjoying some Iraqi 'Janoff' brand vodka on New Years Eve in Najaf, walking up the steps of the 21st century BC Ziggurat of Ur, taking a boat ride through the lush Mesopotamian Marshes and cruising past the wreck of Saddam's Presidential Superyacht on the Shatt al-Arab in Basra. 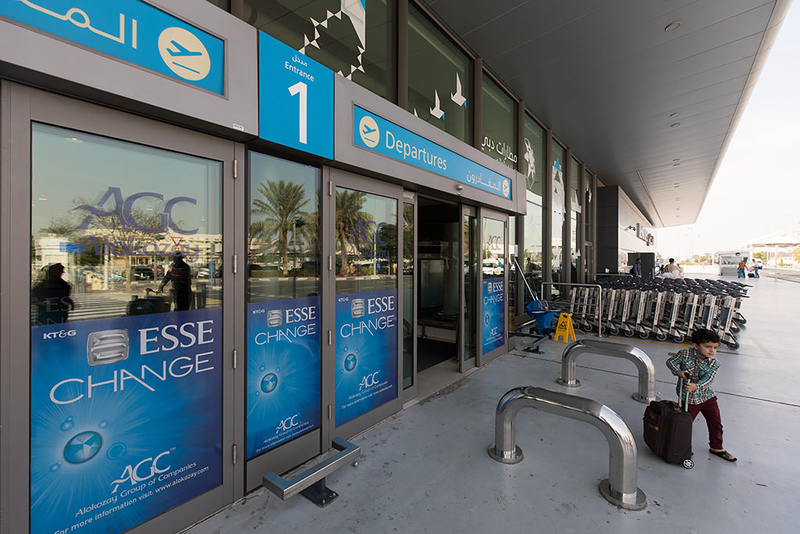 Outside Terminal 2 at Dubai International Airport to catch my flight to Baghdad. 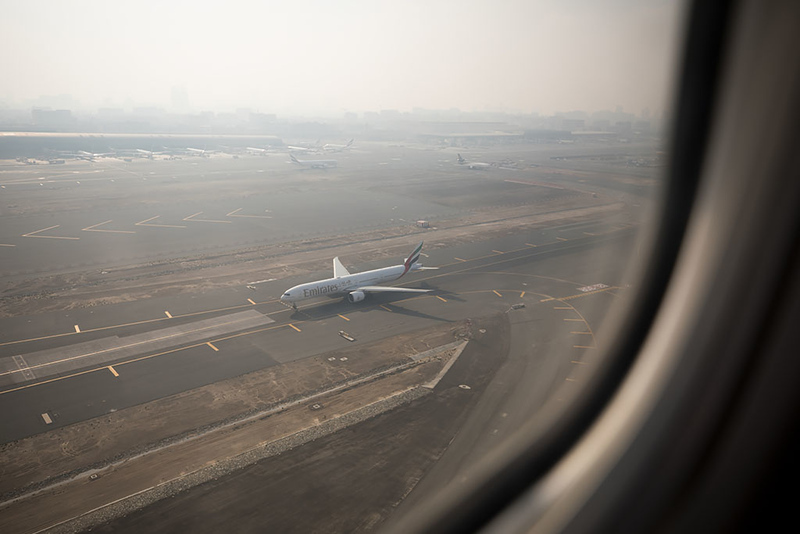 It was my first visit in 11 months to this part of DXB since my trip to Bangladesh the previous February. 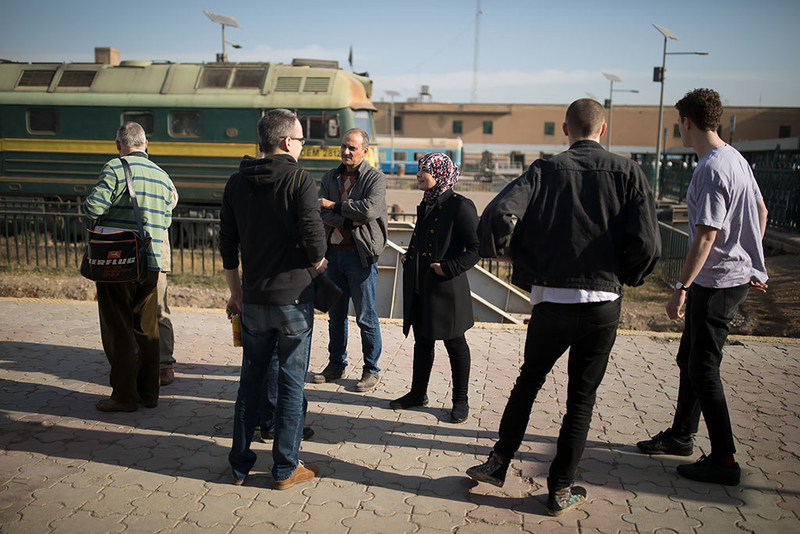 I had initially looked at visiting Iraq back in 2014, but with the rise of ISIS and resulting instability, I instead had to opt for only visiting the more stable northern part of the country of Iraqi Kurdistan instead. In 2017 I spotted a trip being organised on a travel forum I belong to. 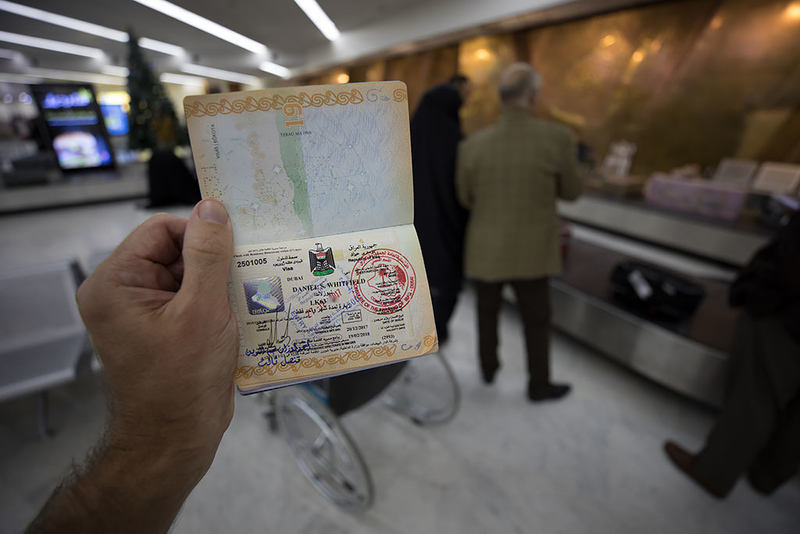 After exchanging a few emails, I wired through my deposit to confirm my place on a 7 day trip from Baghdad to Basra. 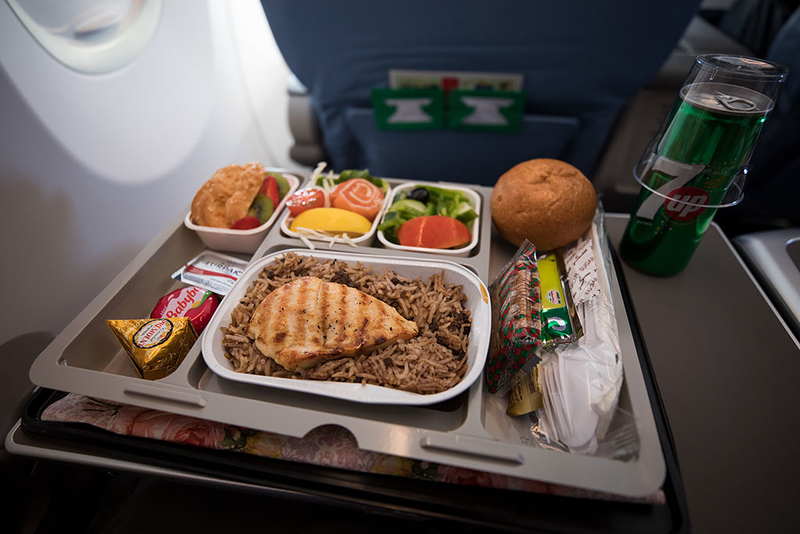 For my flight from Dubai to Baghdad I opted to fly on Iraqi Airways (IA), booked directly on their website. While economy was $190 one-way, business class (although marketed as 'First') was only $290 so I decided to opt to fly in the front of the plane. 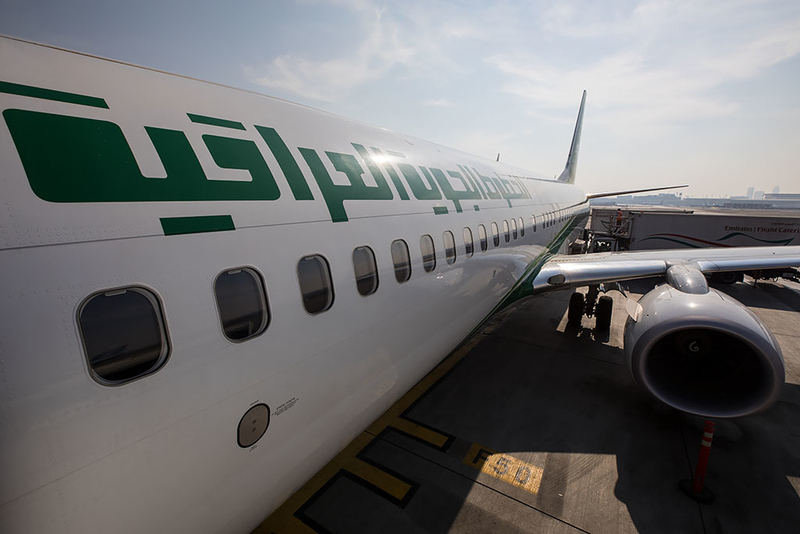 For the return flight from Basra to Dubai, Iraqi Airways (IA) unfortunately only flies three times a week and not on the day I needed. Both Emirates (EK) and Flydubai (FZ) also fly this route, but the prices were quite high for a less than 2 hour flight in economy ($700 on EK and $380 on FZ). Royal Jordanian (RJ) had flights from Basra to Amman and onto Dubai for a reasonable $290 so I opted for this despite the longer travel time. After waiting for my bag at security, I looked over the shoulder of the guard reviewing the monitor at the X-ray machine and saw my bag on the screen, except with what looked like a large revolver inside it! The security guard quickly pressed a button and the 'revolver' quickly flashed and then disappeared. I figured it was some kind of test to make sure that security personnel were vigilantly reviewing the X-ray machine monitor. 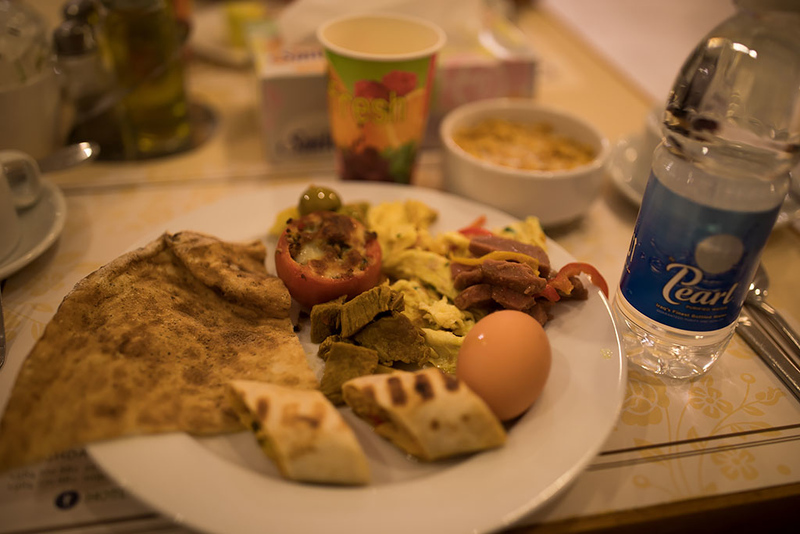 I then headed to the Marhaba lounge for a quick bite to eat. 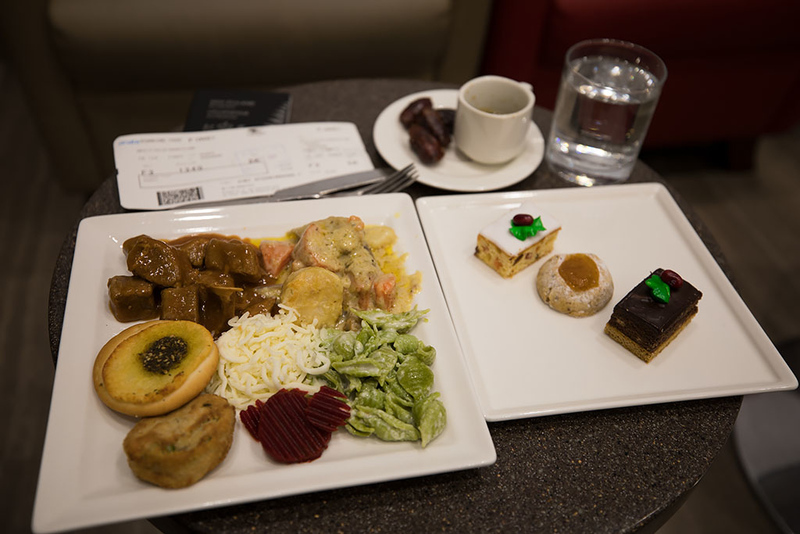 Although I normally have access through my HSBC credit card but was in the lounge today as part of my Iraqi Airways First class booking. Waiting for the boarding call for the flight to Baghdad. 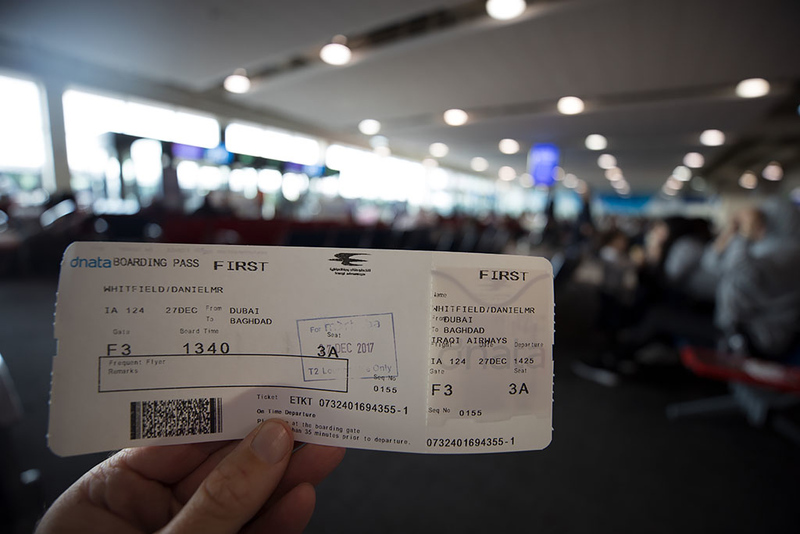 It felt a little ironic with a 'First class' boarding pass in the budget Terminal 2 at Dubai Airport. Boarding the IA 737-800 after a short bus ride from Terminal 2. The plane (YI-ASW) had been delivered the previous August and was only 4.5 months old. 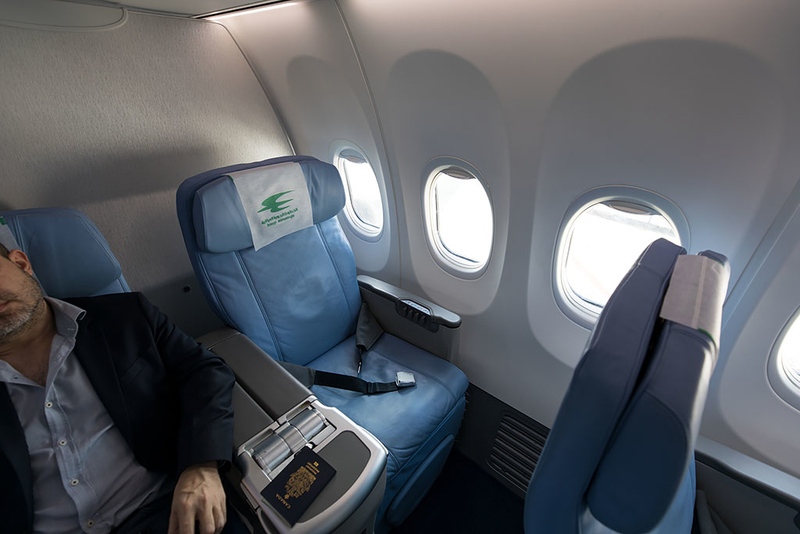 And window seat, 3A. 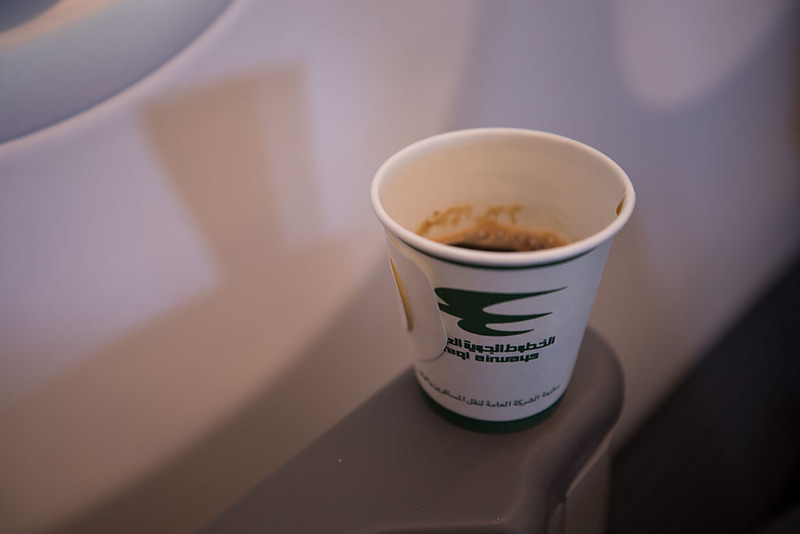 My seatmate was an Iraqi-Canadian living in Dubai and travelling to Baghdad for business. 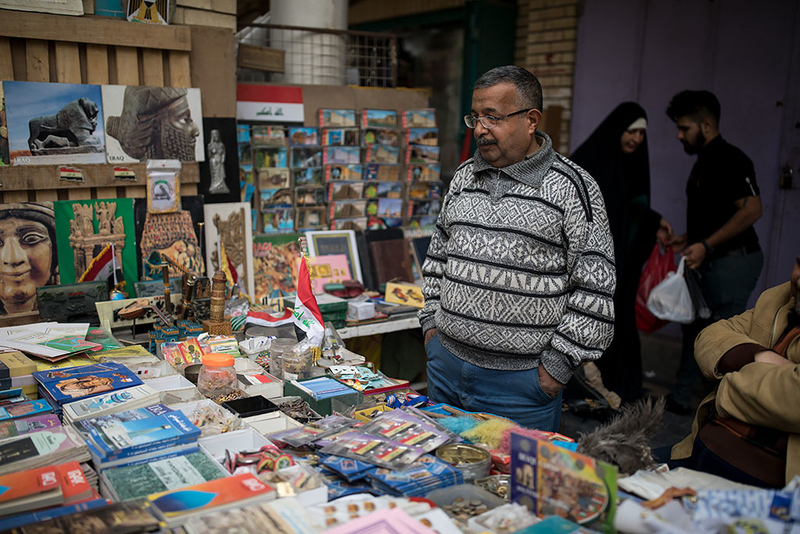 He was very intrigued when I told him that I was going to Iraq as a tourist. 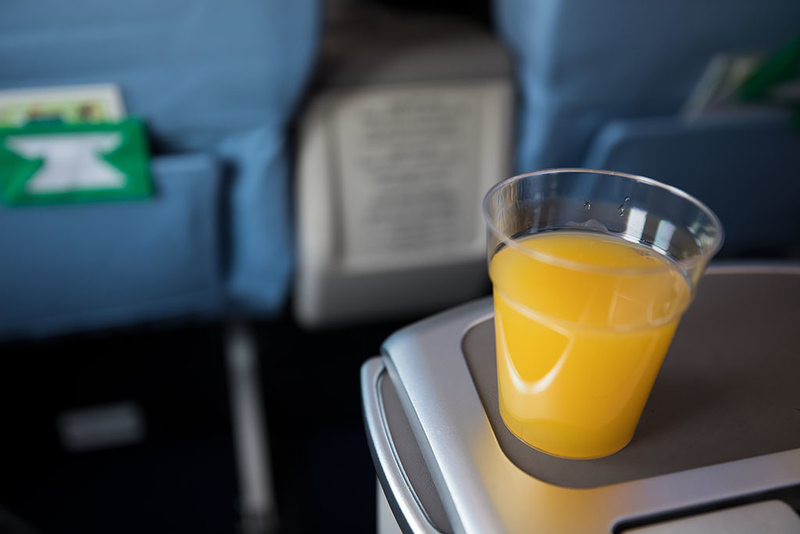 A pre-departure beverage of orange juice that was served soon after I was seated. 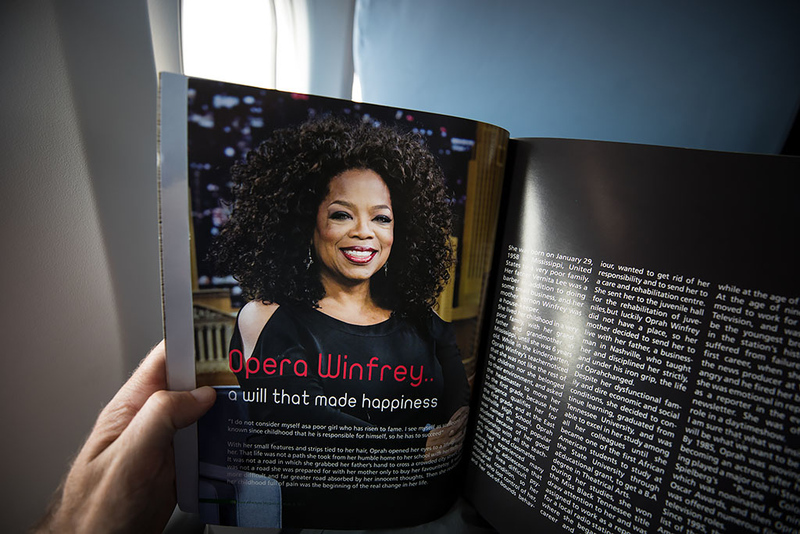 Reading an article on 'Opera' Winfrey in the Iraqi Airways inflight magazine. 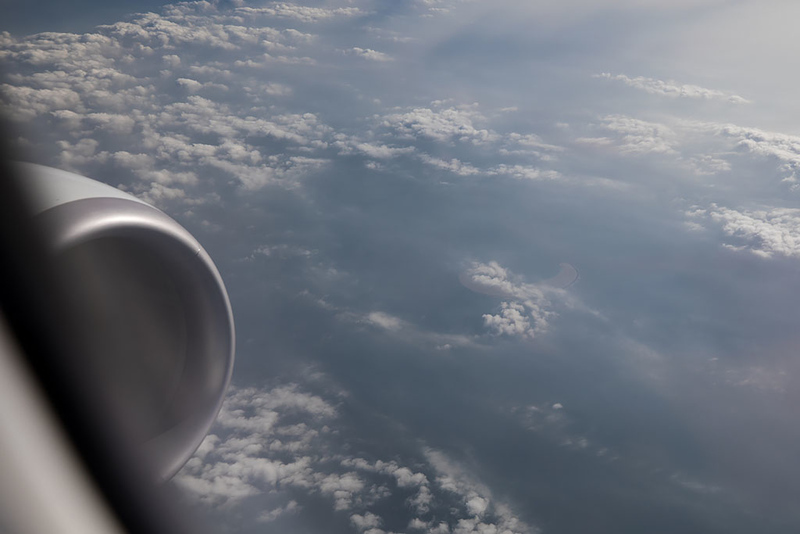 Looking down on an EK777 as we take-off ontime on runway 30L. The uninhabited and man-made Moon Island below about 50 kilometres off the coast of Dubai. Tasty chicken and rice served for a late lunch. And some black coffee to finish. Watching the heist comedy film, Logan Lucky, on the foldout IFE. 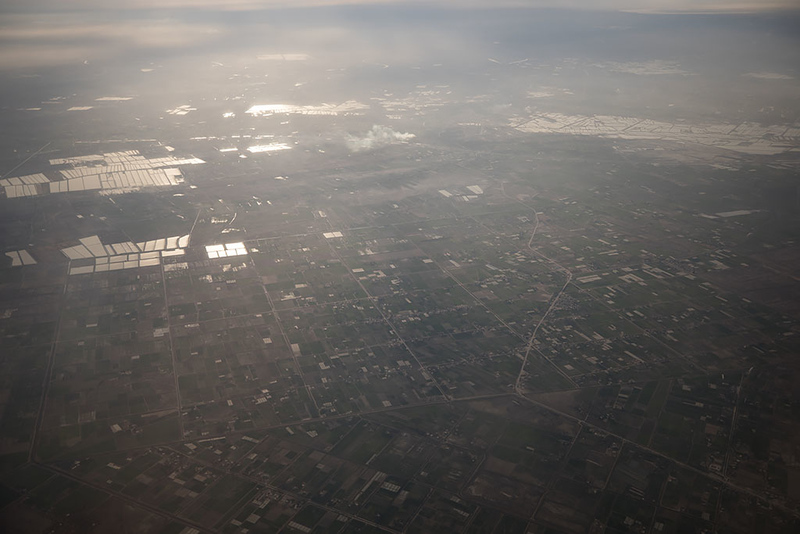 Looking down on irrigated farms as we approach Baghdad. 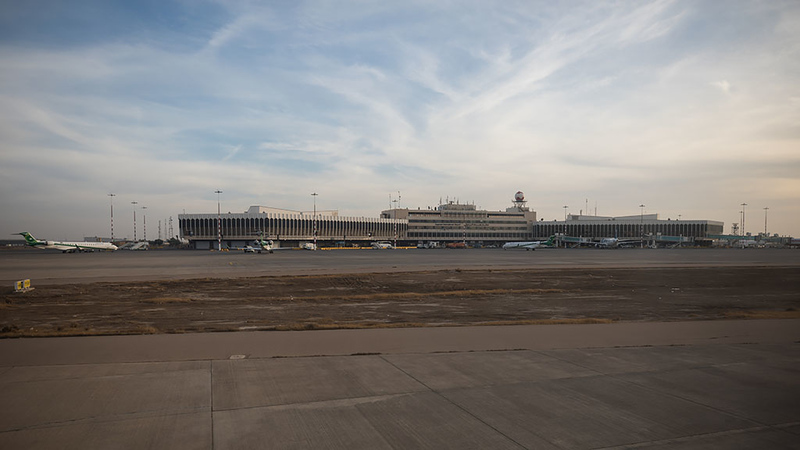 Taxiing to the terminal after a safe and conventional landing at Baghdad International Airport (BGW), renamed from Saddam International (SDA) after the American-led invasion in 2003. 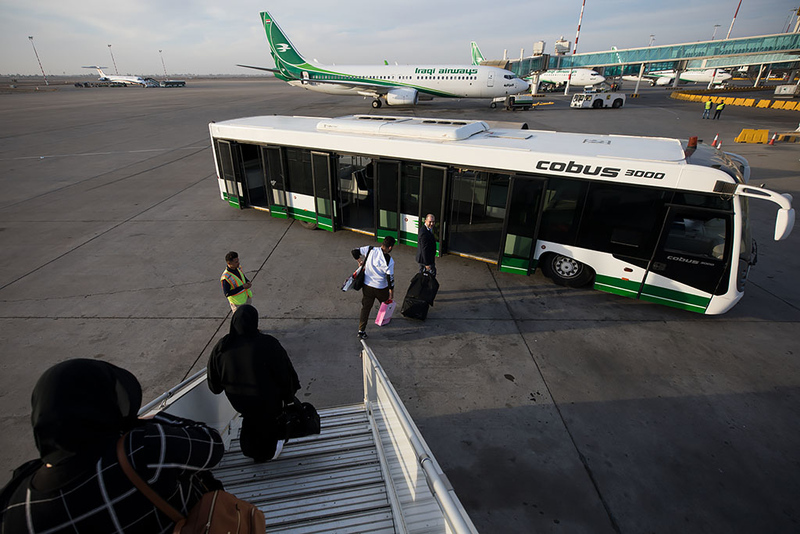 Our jetbridge was non-operable so we had to catch a bus for the short ride to arrivals. And with my passport stamped after a short queue at immigration. Waiting by the luggage belt with one of the many Christmas trees that were about. While waiting for my bag to come through I spotted Charlie, who was also here to join the Baghdad to Basra trip. He had also been on the flight from Dubai but had opted for a seat in the back. 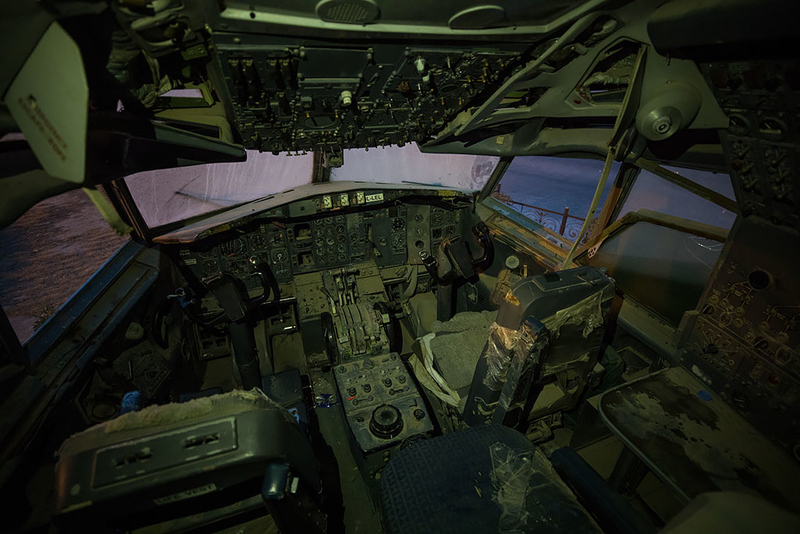 A self-confessed aviation geek, as well as running an independent music label in London, he had a side job as a tour guide to North Korea and had been there 20 times! 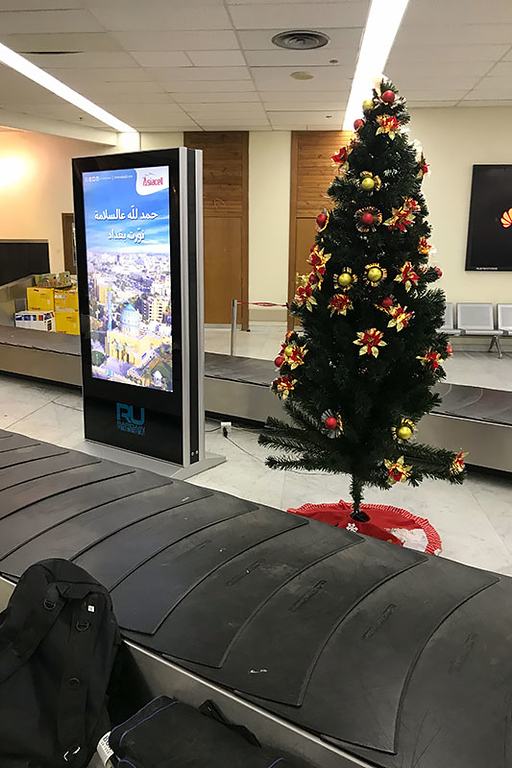 After collecting our bags we headed through to catch up with the rest of the guys on the trip, who had arrived earlier on a Turkish Airlines flight from Istanbul. I finally got to meet Julian for the first time, the organiser of the trip and whom I had been conversing via email quite a bit to get my Iraqi visa sorted. Also on the trip was his sons Alastair and Harry, Danny from Austria and Andreas from Germany. 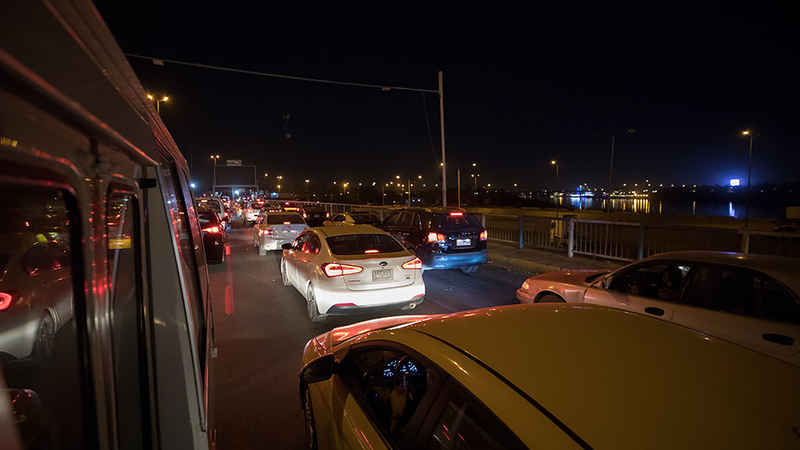 We then piled into a black Chevy Suburban with all our luggage to ride the ~5 kilometres to the airport carpark. 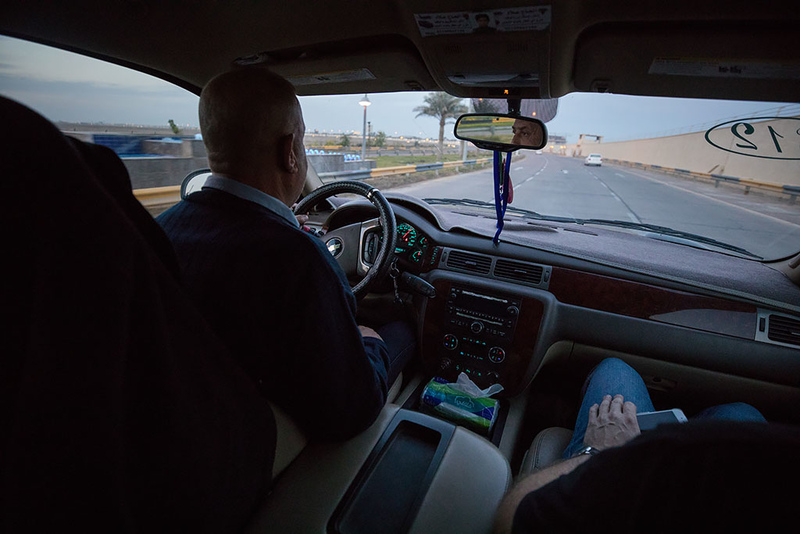 Similar to when I had arrived at Erbil Airport in the north, it was not possible to drive private vehicles to/from the airport terminal and you had to catch an approved taxi instead. 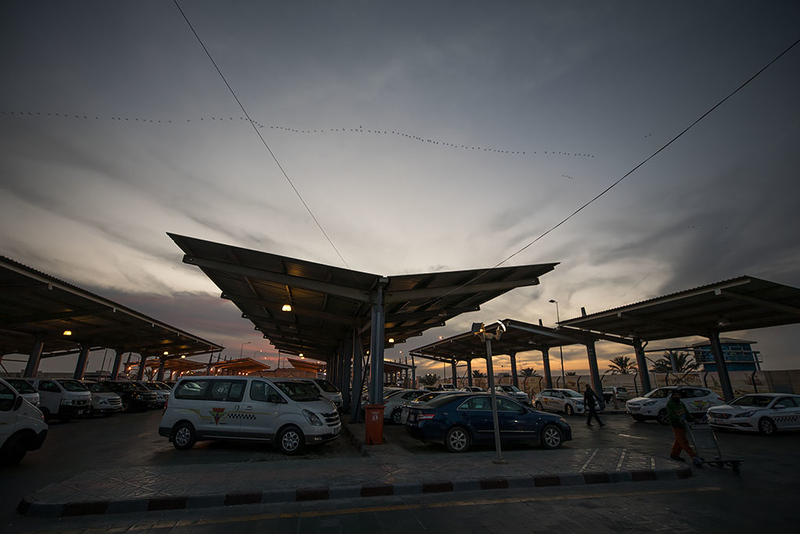 At the airport carpark with a long stream of migrating birds flying across the sky just above. 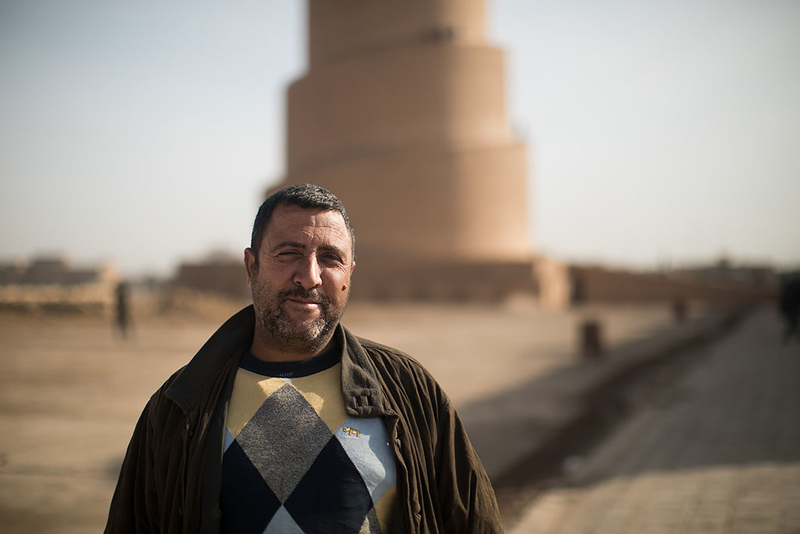 Raad, our local fixer/guide and Amad, our driver, was waiting for us and warmly welcomed us to Iraq. 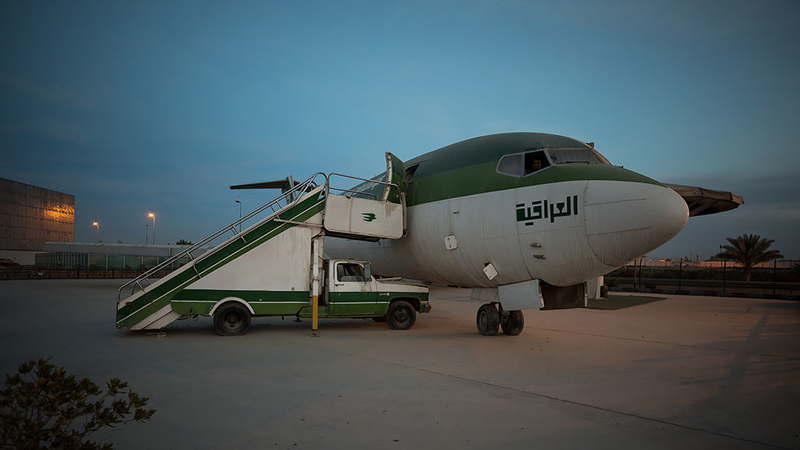 Before setting off into the city, Julian and Charlie asked if we could check out the old Iraqi Airways 727 that was next to the airport carpark. 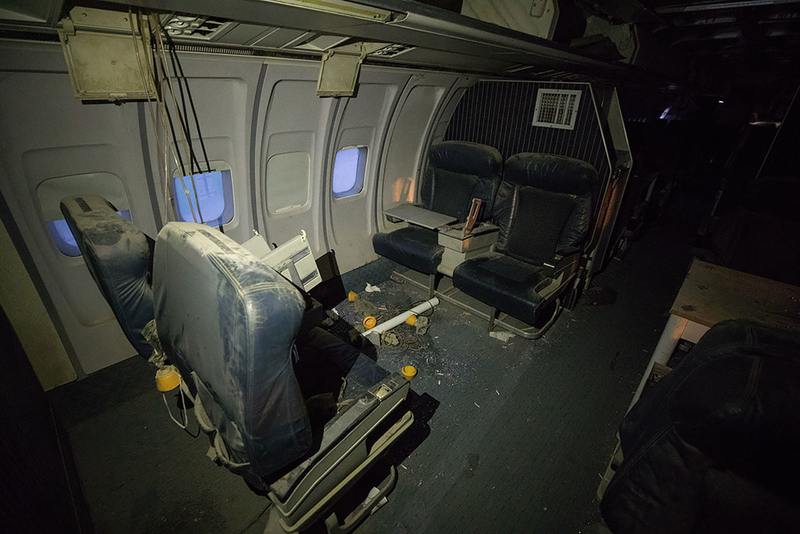 Raad said that it used to be a restaurant, complete with tables placed between the original airplane seats. Walking out onto the wing after squeezing through the emergency exit. 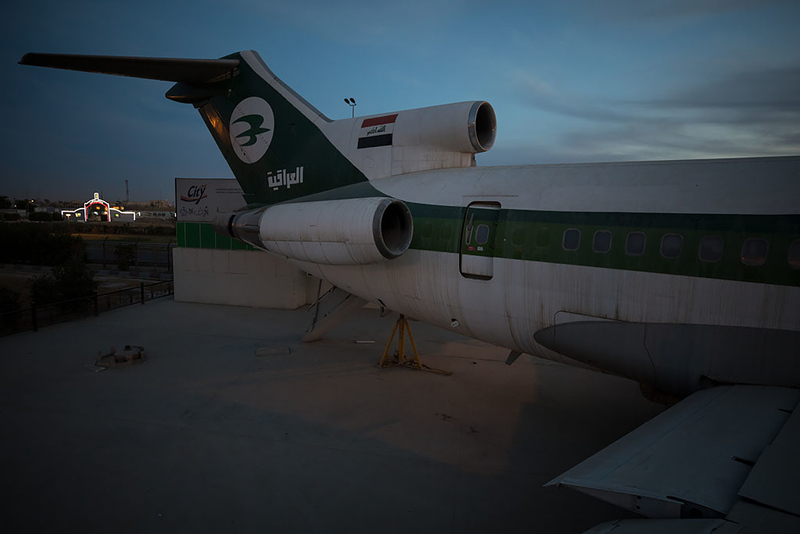 After the Iraqi Invasion of Kuwait in 1990, Iraqi Airways was grounded by the United Nations' sanctions against the country. After the war domestic flights were also a rarity due to the No-Fly Zone imposed by the United States and United Kingdom over Iraqi skies. 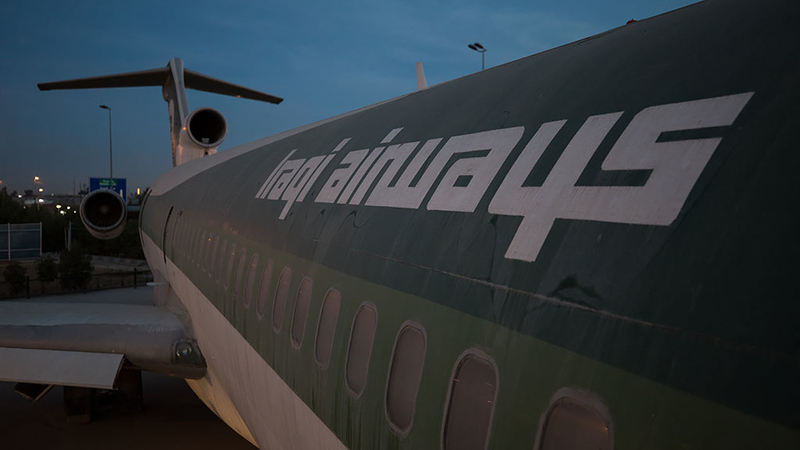 In June 2005, Iraqi Airways resumed domestic flights for the first time since the fall of Saddam with a Boeing 727-200 flying from Baghdad to Basra. Checking out the cockpit. 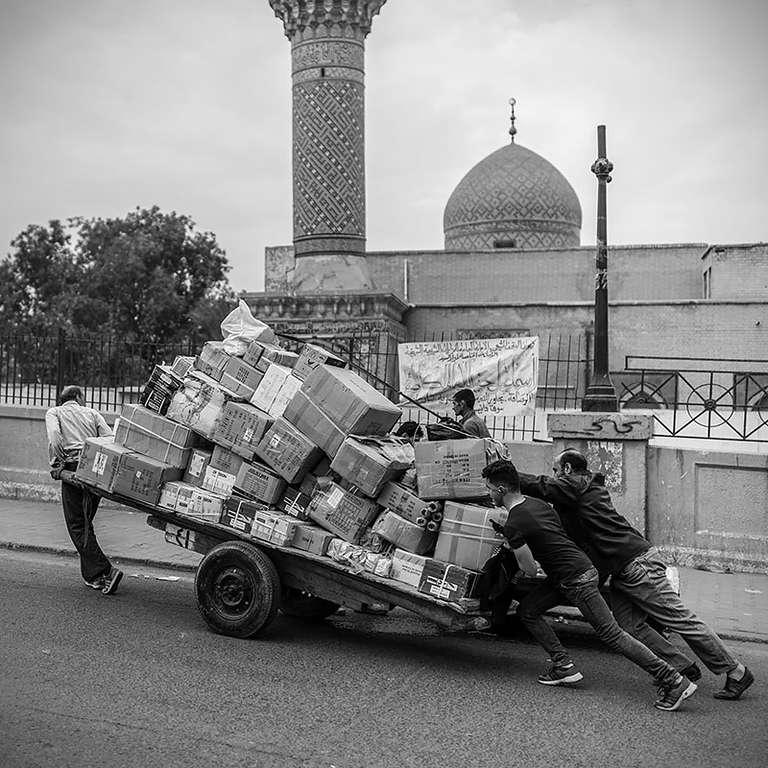 International flights resumed soon after, and Charlie said that the planes overnighted outside the country, with the morning flights flying out of Tehran, Beirut, Amman, Dubai etc, did the spiral dive into Baghdad and then flying out again in the afternoon back to safety outside of the country. We then drove into the city. On the way I spotted a Burger Fuel restaurant, a New Zealand burger chain. 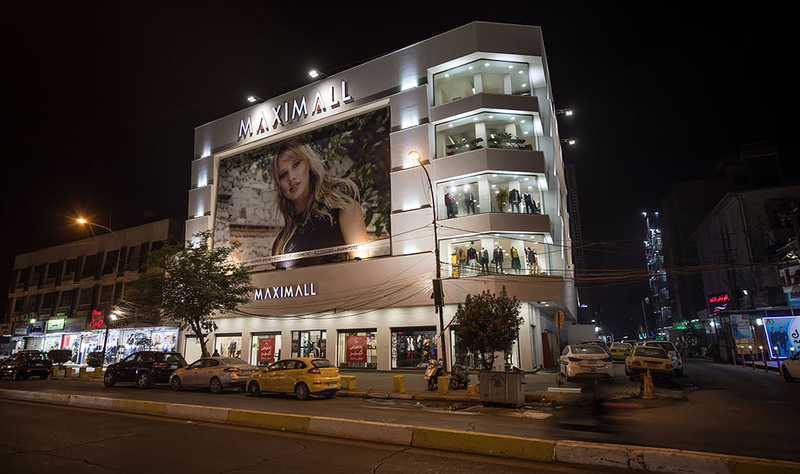 Apparently they had to close in 2014 with the rise of ISIS but reopened last year as stability in the capital had improved. 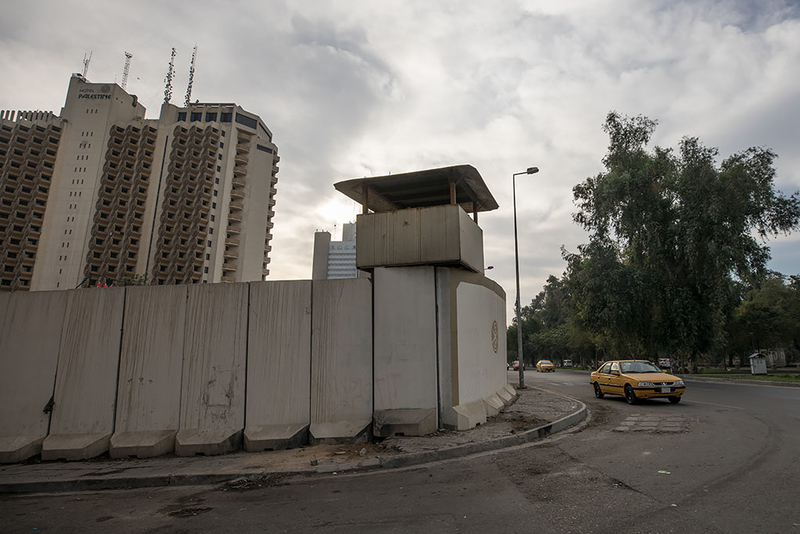 Outside the Baghdad Hotel where we would be staying for our time in the city. 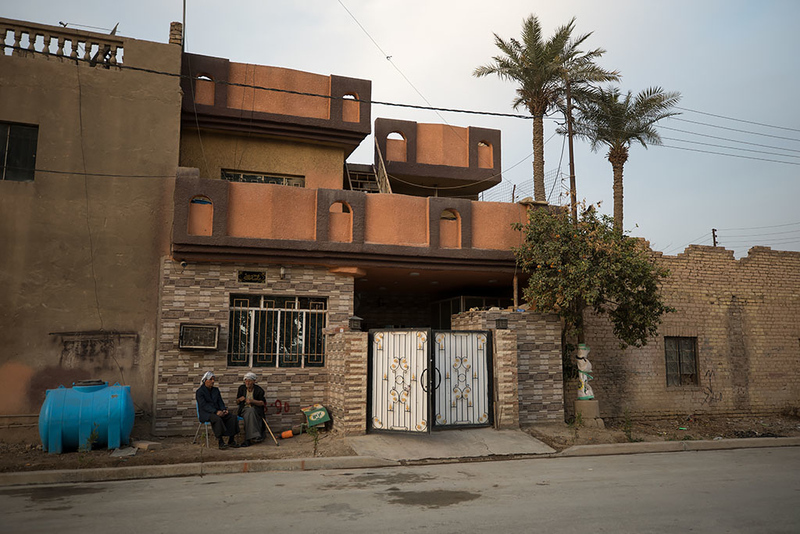 Western journalists, workers, and members of the Iraqi Governing Council frequently stayed at the hotel after the 2003 invasion. 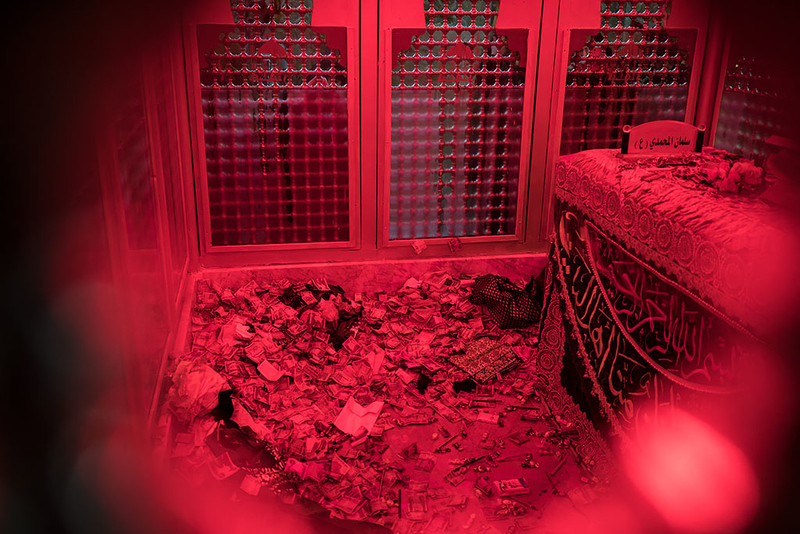 There was subsequently a suicide bombing outside the hotel in October 2003. 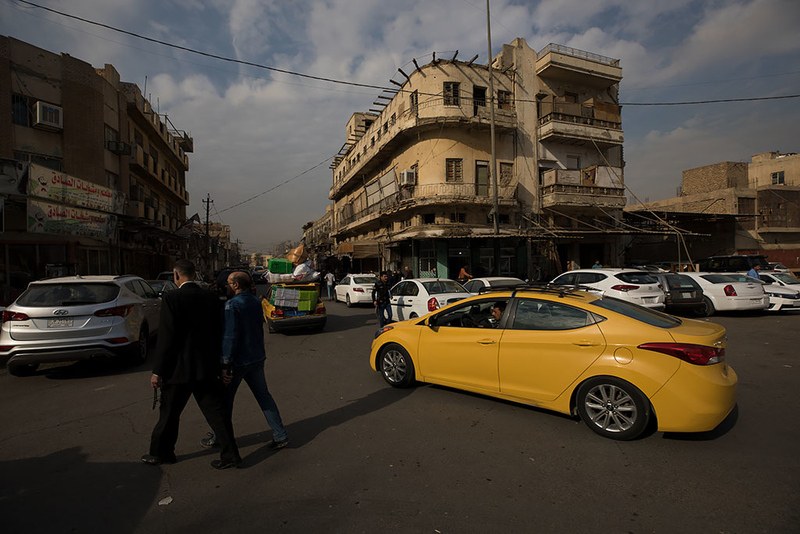 Although the surrounding hotel blast walls were not breached, six Iraqis were killed along with with thirty-two others wounded including three U.S. soldiers. 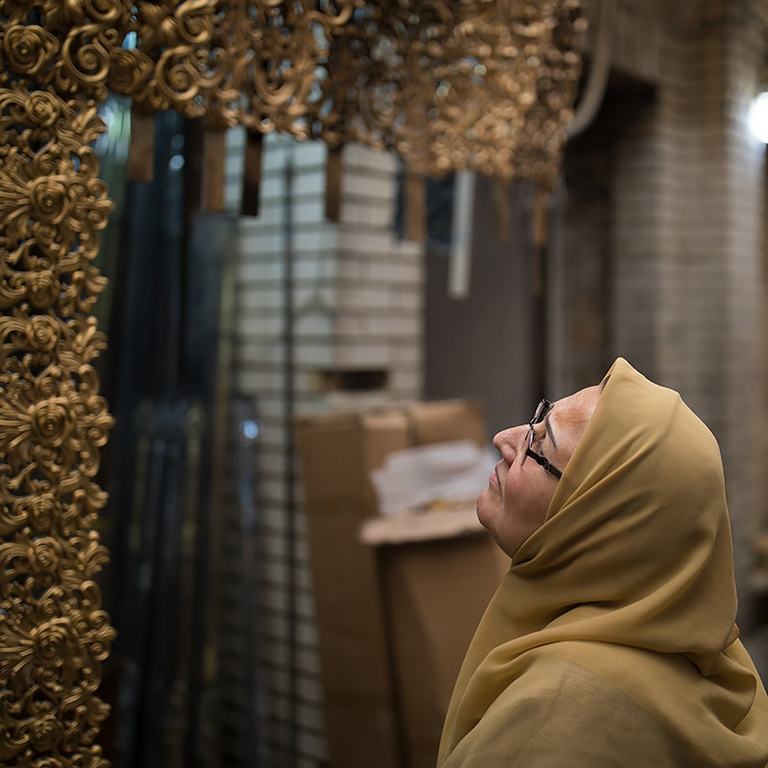 Although they do still occur, similar bombings in Baghdad are much less frequent now, with one typically on average per month. And a nice big Christmas tree in the hotel lobby! It was quite surprising to see so much festive decorations about. 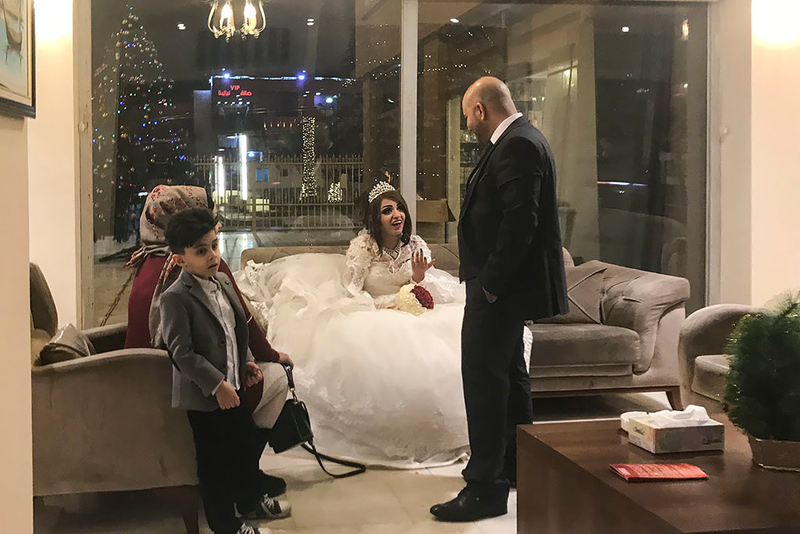 A newly wed bride and groom also in the lobby. Apparently it was wedding season with quite a few decorated SUV's out in the hotel carpark. And my room for the next three nights. 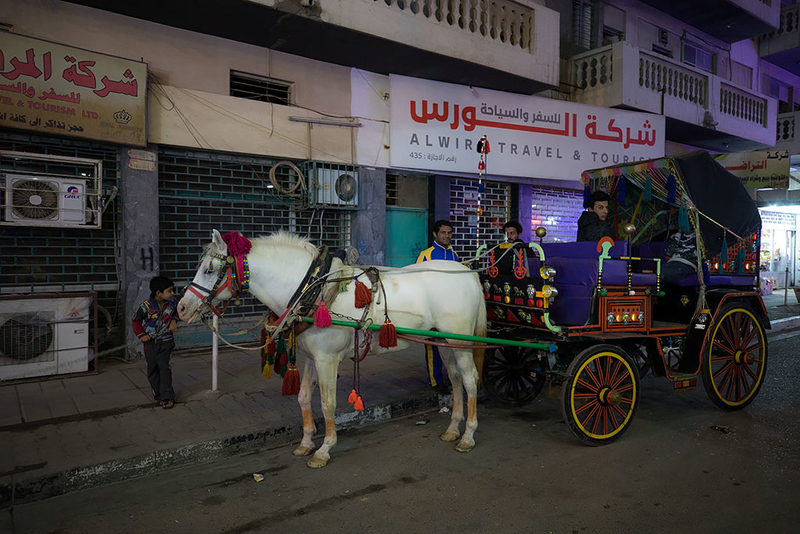 Horse and carriage. At about 7:30pm we headed out for a walk with Raad and Amad. 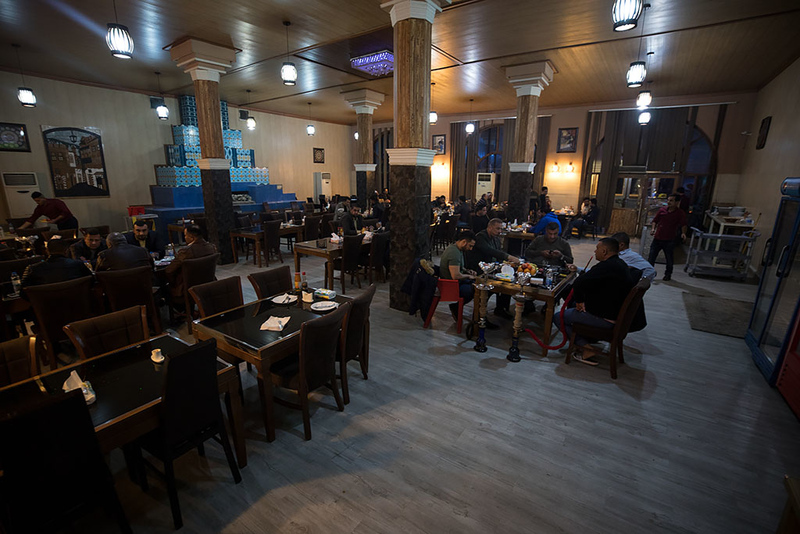 At a local restaurant by the Tigris river for dinner. 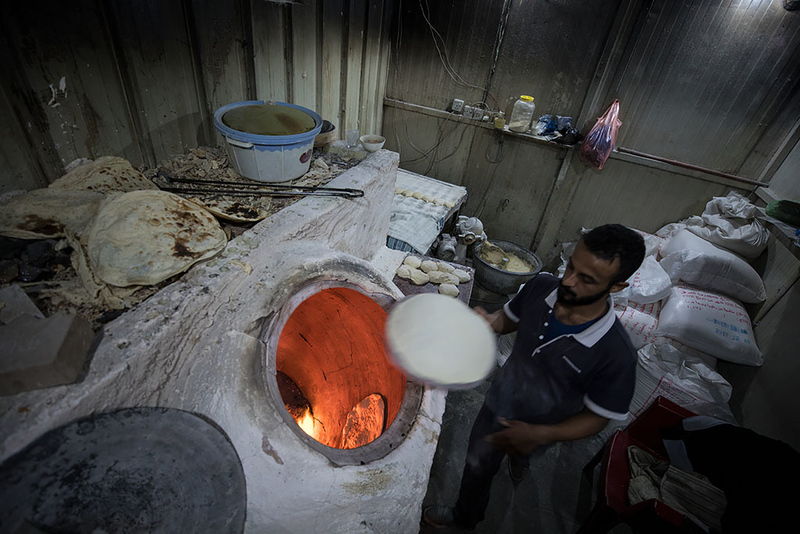 Checking out the baker baking fresh flatbread. 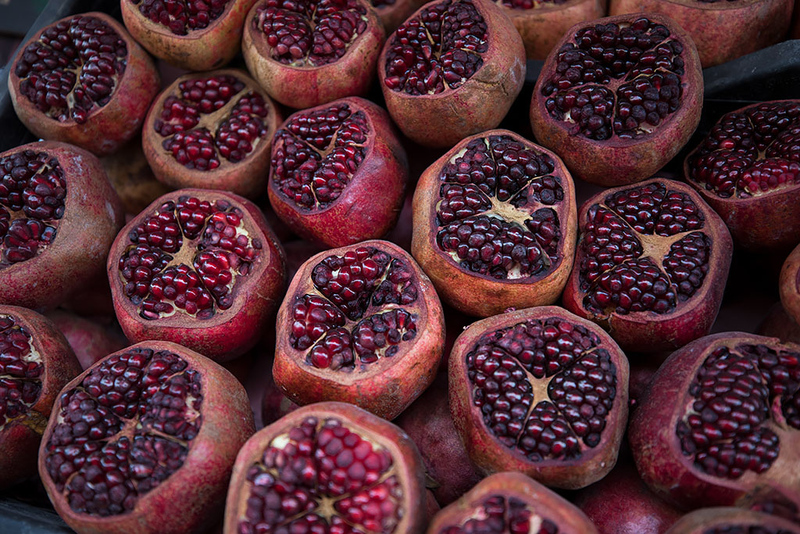 Some tasty mezze to start. 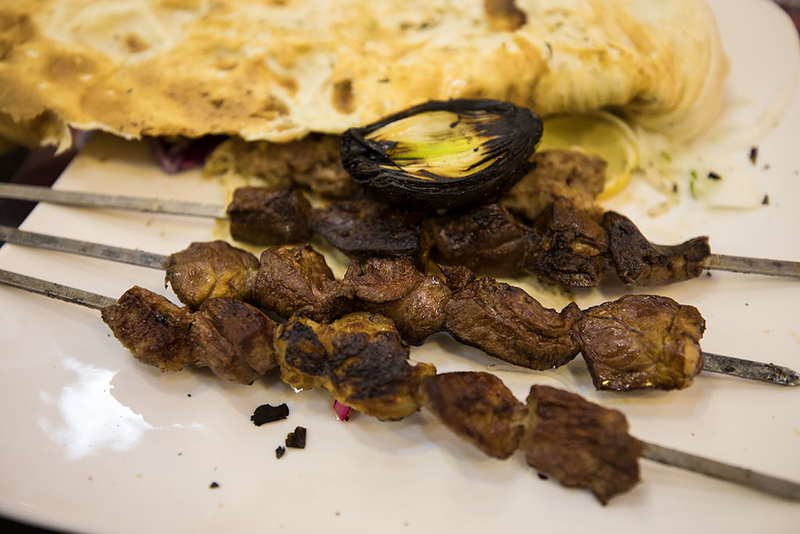 Followed by some tasty lamb kebab. 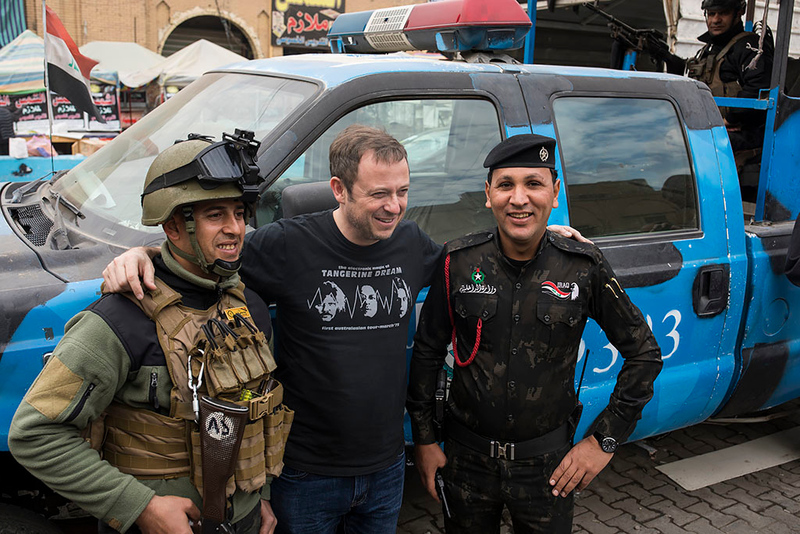 It was great to chat with everyone and how we all ended up in Baghdad a couple of days after Christmas. 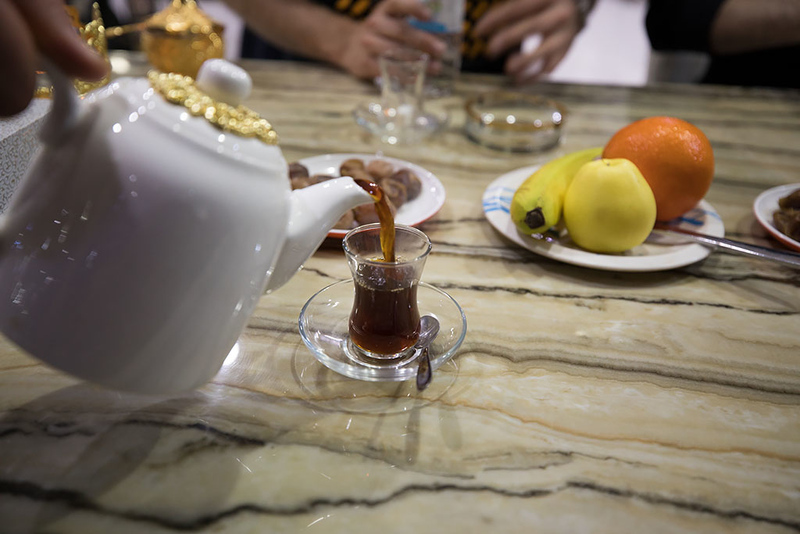 And some sugary tea and fruit to finish up our first day in Baghdad. While chatting with Julian about past travels, he whipped out his passport and showed me a treasured stamp he had gotten, from a visit to the South Pole! I had to admit I was ever so slightly jealous. 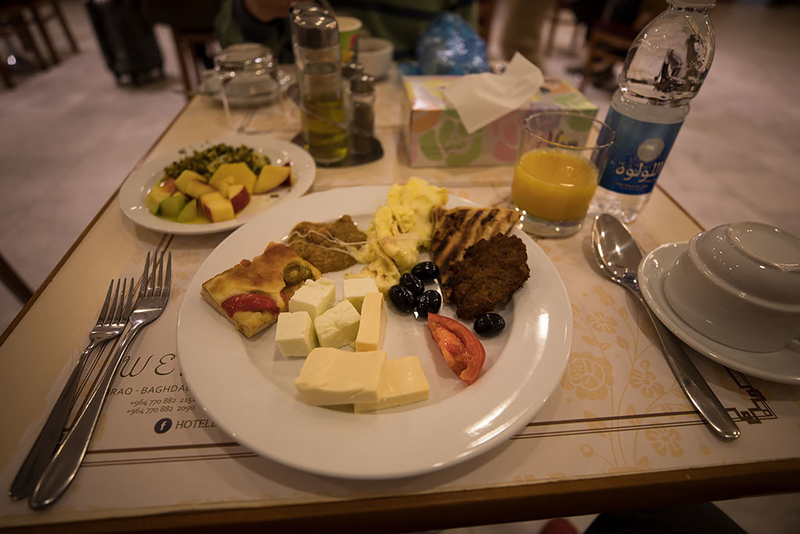 Breakfast at the hotel on the morning of day 2 where they had quite a comprehensive selection of food on offer. 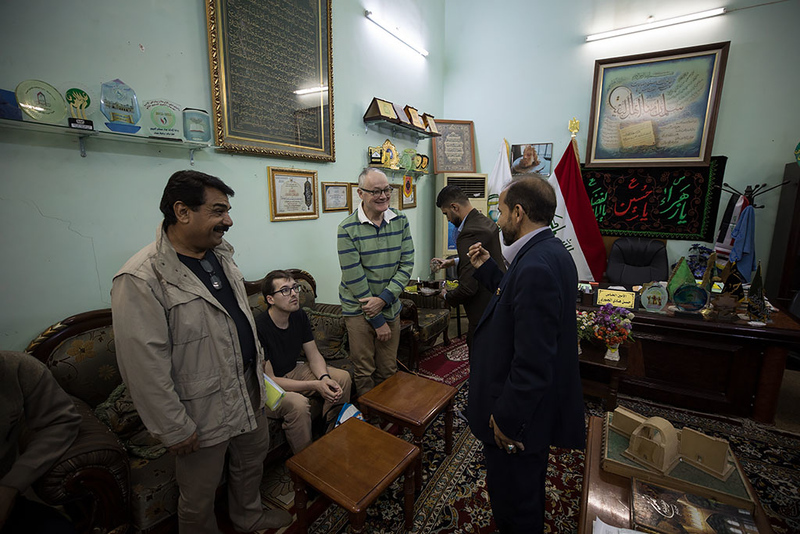 After meeting up in the lobby we then headed out to do some sightseeing around Baghdad. Passing by the famous Hotel Palestine. 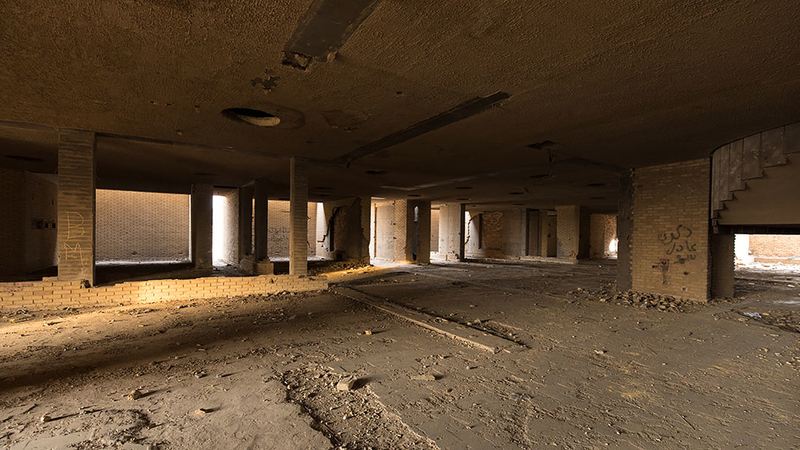 Built in 1982 and originally operated by the French hotelier Le Méridien as the Palestine Méridien Hotel until UN sanctions were imposed following the first Gulf War. 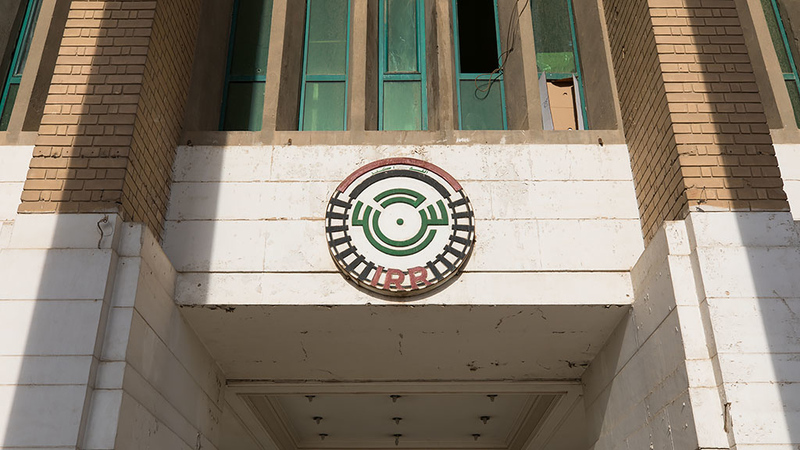 From the first Gulf War in 1991 through to the 2003 US-led invasion of Iraq, the hotel was also a popular base for foreign media. In April 2003 a controversial incident occurred when an American tank fired a shell on the hotel, killing two Spanish journalists and wounding three others. 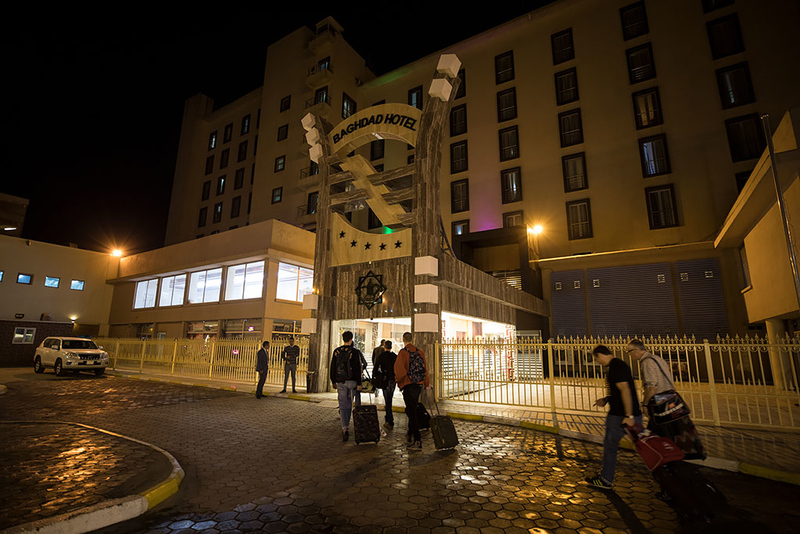 Being outside the fortified Green zone, the hotel also suffered frequent attacks during the turmoil of the US occupation, and multiple people were killed after a truck bomb destroyed the hotel lobby in October 2005. 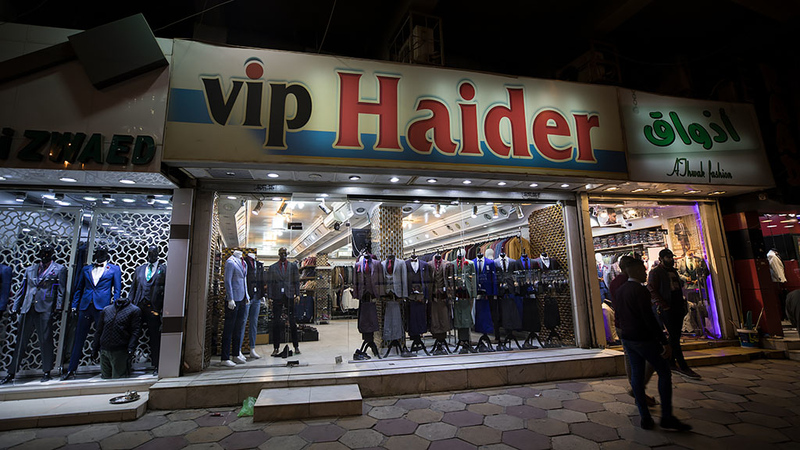 Passing by some shops as the working day begins. 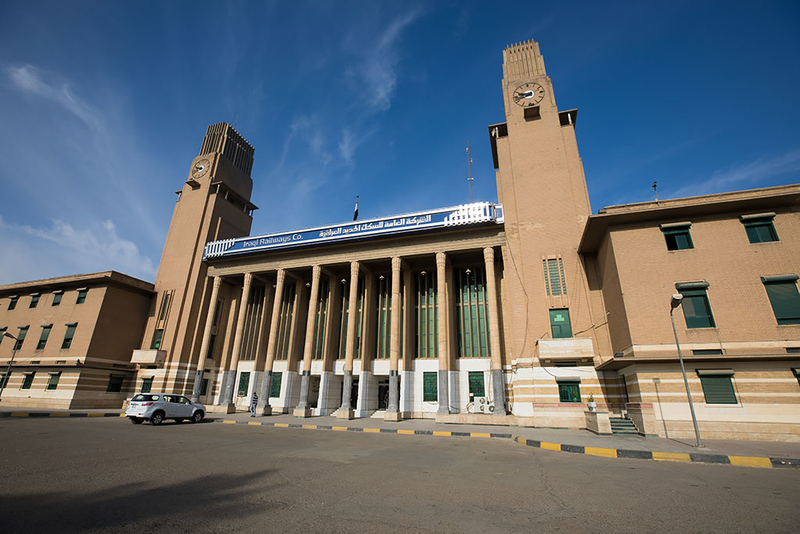 Outside Baghdad Central Station for our first stop of the day. 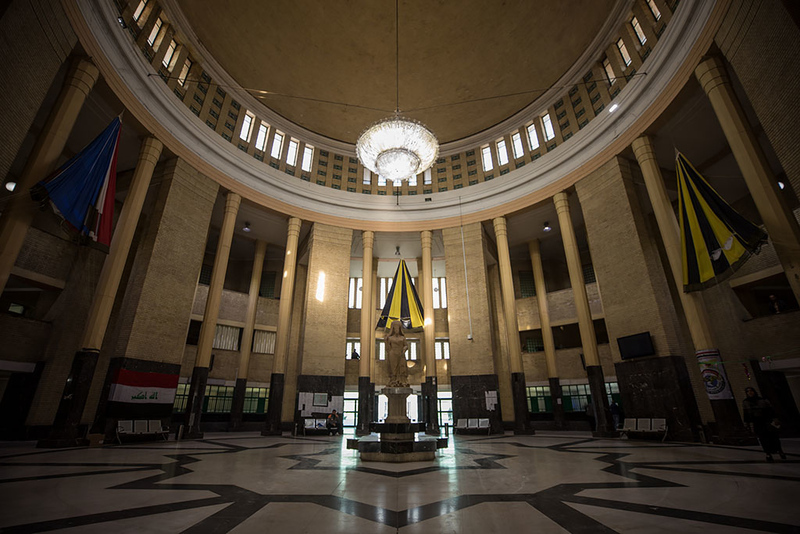 The station was designed and built by British architects and completed in 1953. 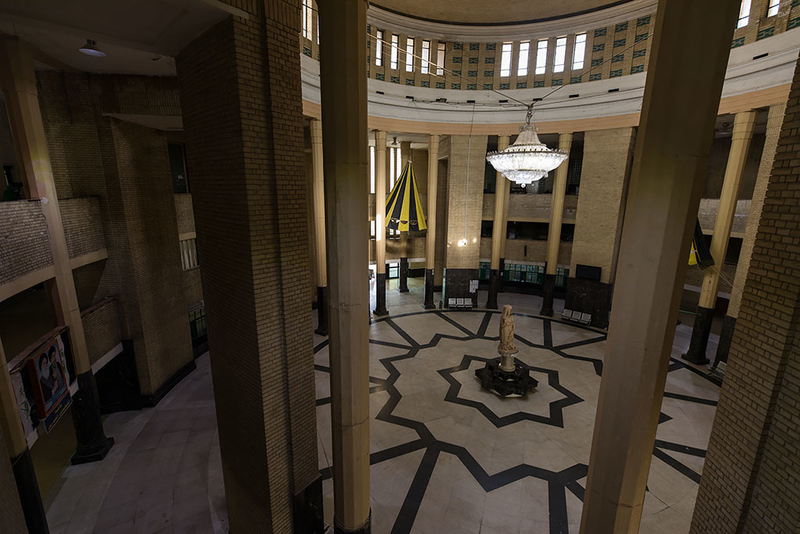 The very grand and impressive main hall. 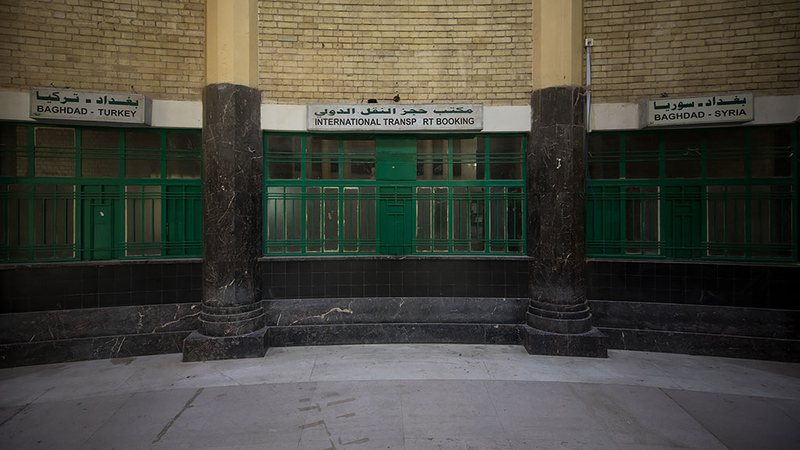 It was quite interesting to see signs above the ticket windows to the long ago discontinued destinations of Turkey and Syria. 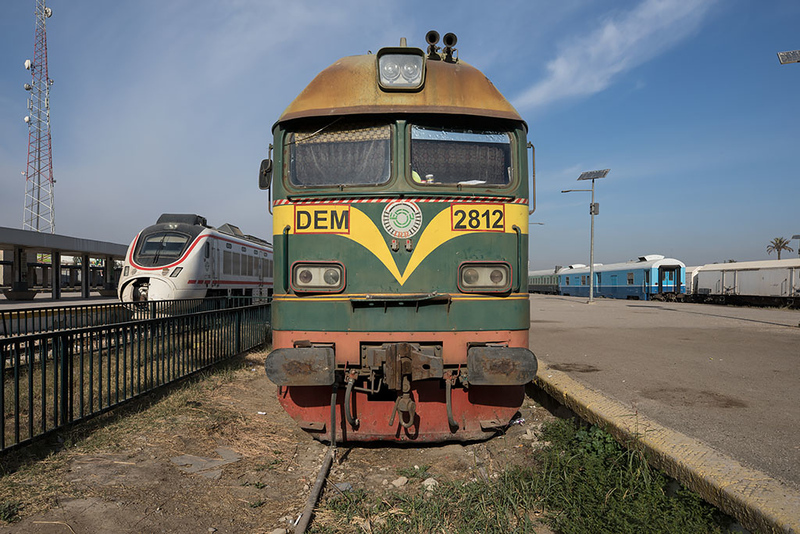 In its heyday services were also offered to Jerusalem and even as far west as London! Significant renovation of the station began in 2004 and was completed in June 2006. 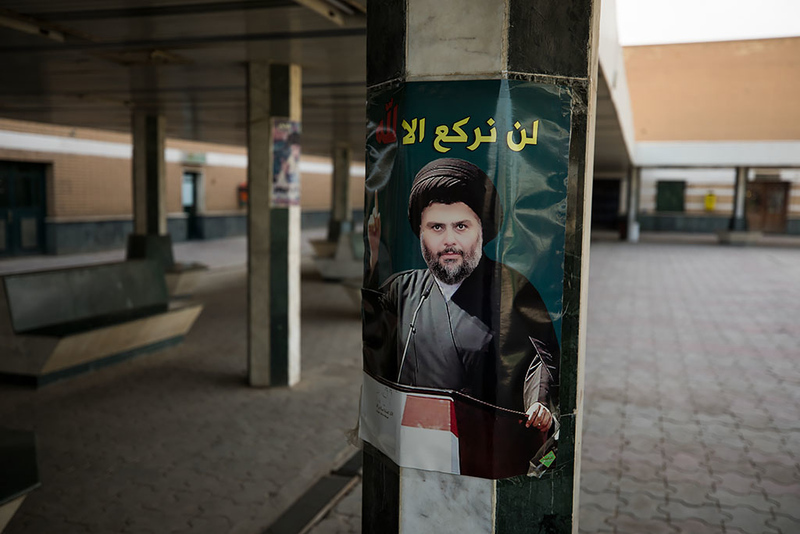 A poster outside of Iraqi Shia cleric, politician and militia leader, Muqtada al-Sadr. 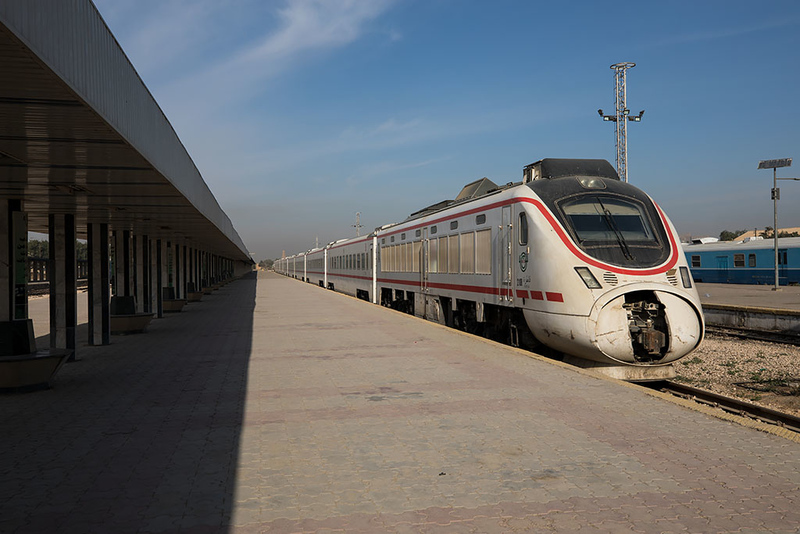 A Chinese CSR train that operates the countries only currently operational passenger route, from Baghdad to Basra. Chatting to some locals who were very surprised to see a group of western tourists wandering about the station. A Ukrainian engine sitting idle. 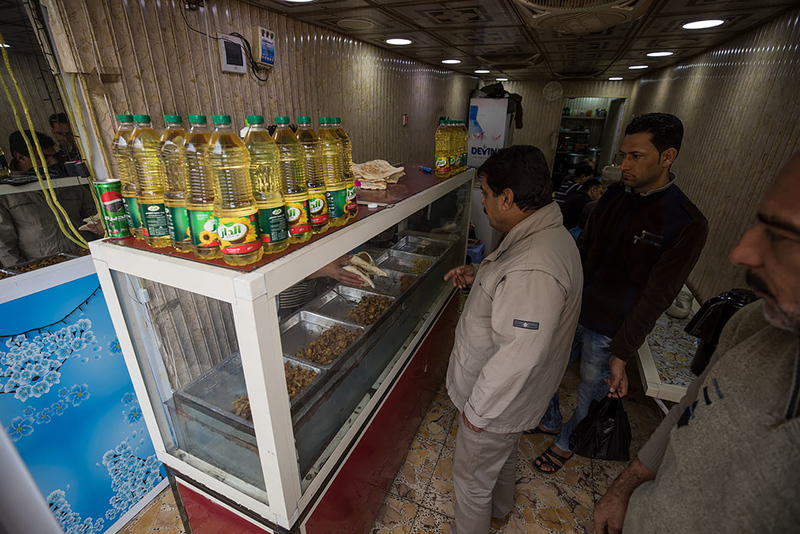 Getting some snacks at the station shop. The shopkeeper was very welcoming and even tried to insist we not pay! 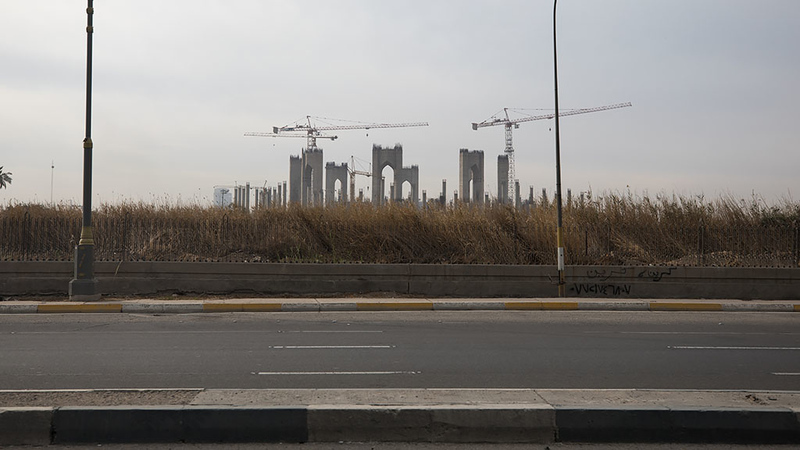 Passing by the abandoned construction site of the Grand National Mosque. 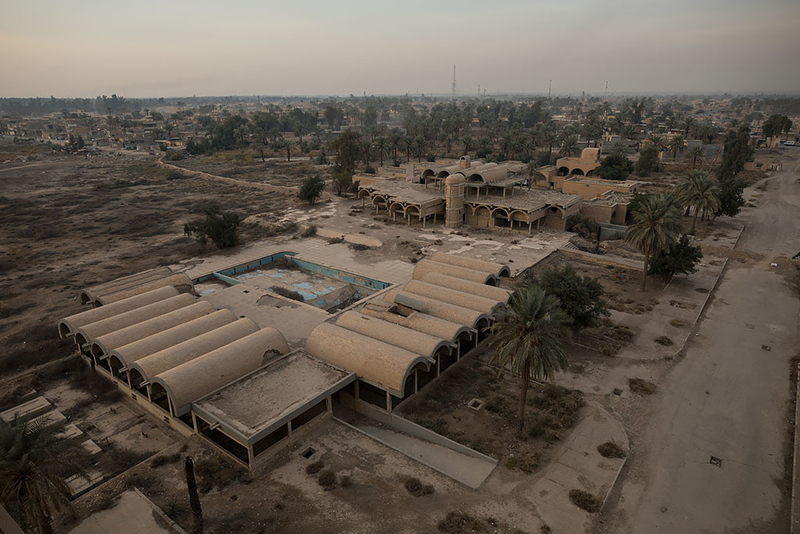 It was to be the largest mosque in the world but the 2003 US-led invasion halted its progress. 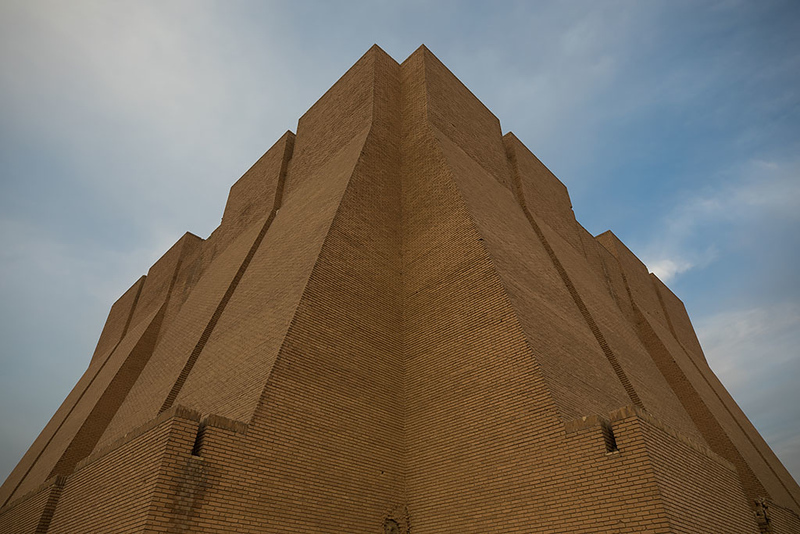 At our next stop, the National Museum of Iraq. 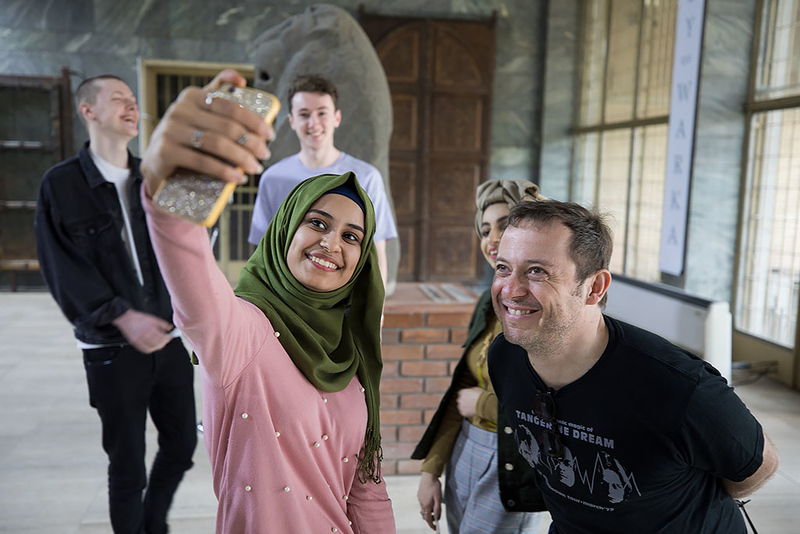 Charlie posing for a selfie with some visiting high school students. 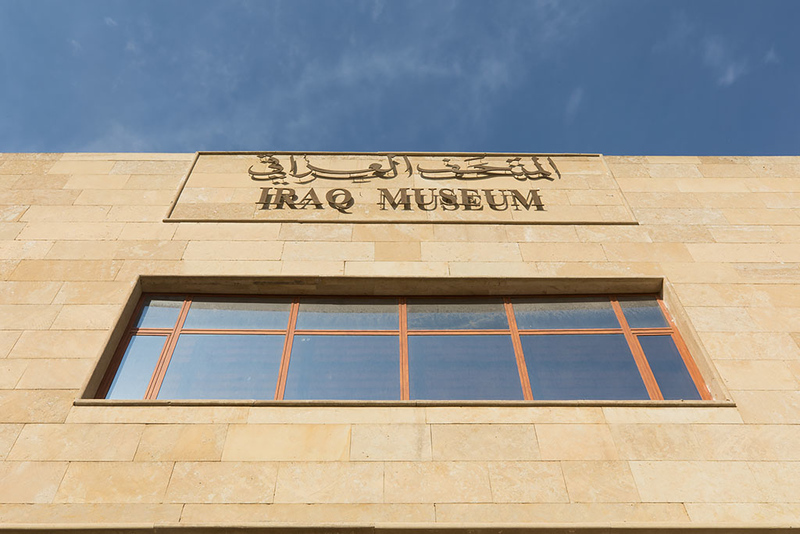 The museum had been extensively looted in the turmoil following the US-led invasion in 2003. 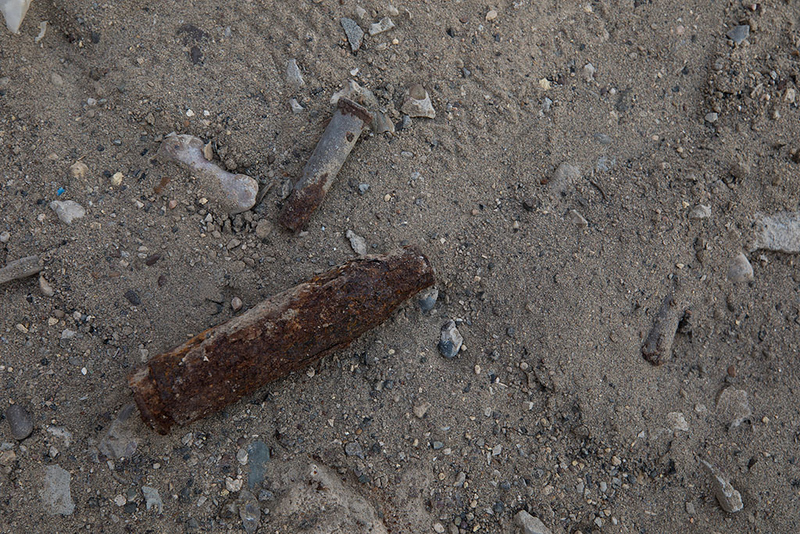 Fortunately many artifacts were saved however by secretly storing them in preparation for the war. A mother goddess statue made from white marble from ~6000 BC. 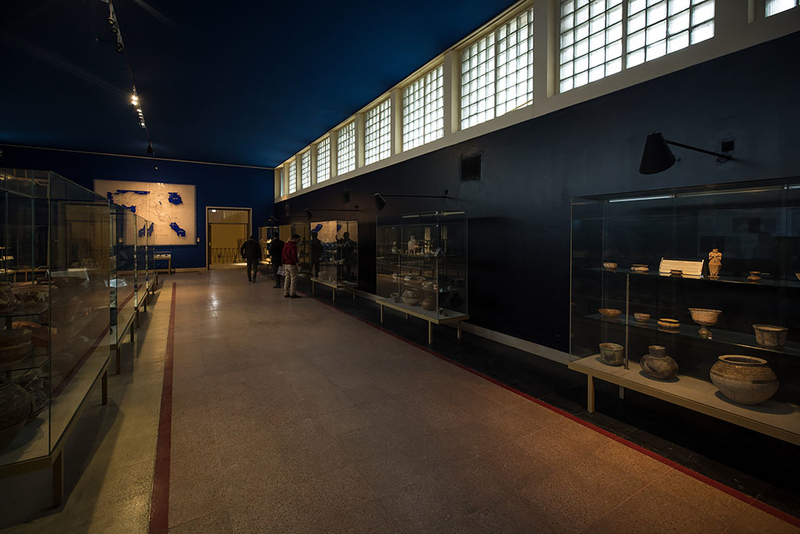 Following significant efforts to recover looted items and restore the museum after assistance from the US and Italian governments, the museum was officially reopened by Iraqi Prime Minister Haider al-Abadi in February 2015. 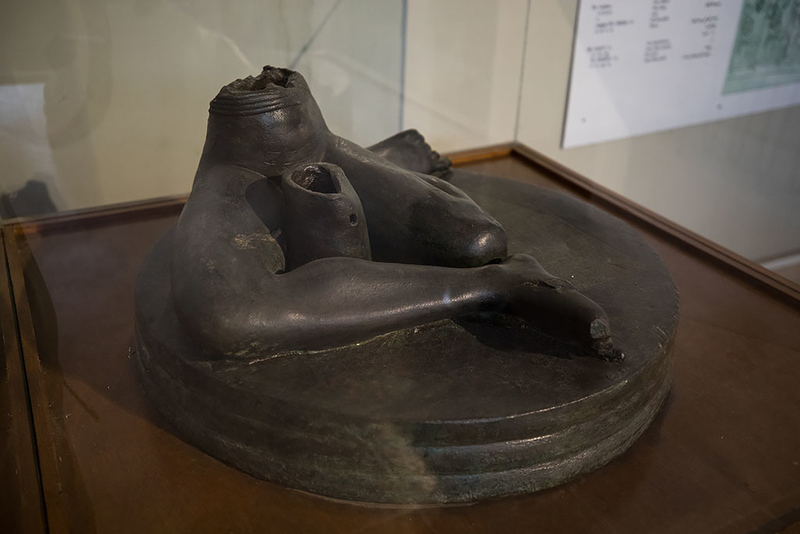 The Bassetki Statue, a monument from the Akkadian period (2350–2100 BCE) in Mesopotamia that was cast from pure copper and weighs 150 kilograms although only the lower part of the figure remains. 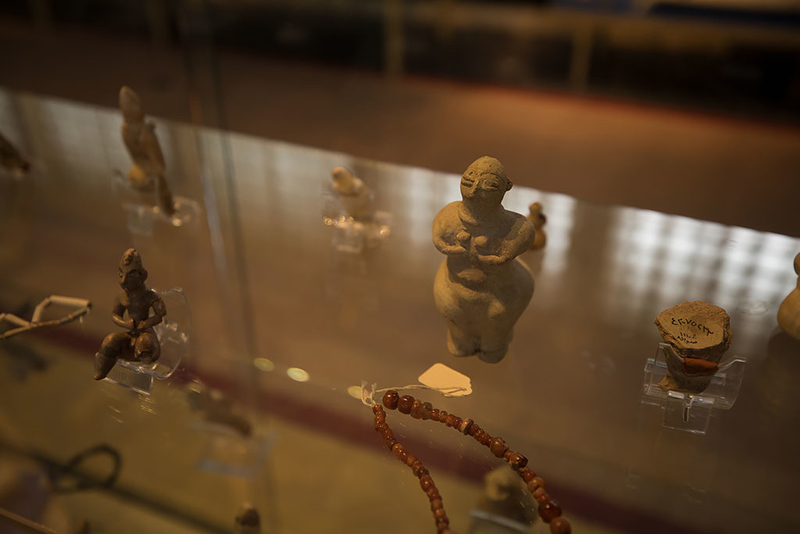 It was looted from the museum during the 2003 invasion of Iraq but was recovered by American Military Police and found covered in axle grease and at the bottom of a cesspit after a tip-off. 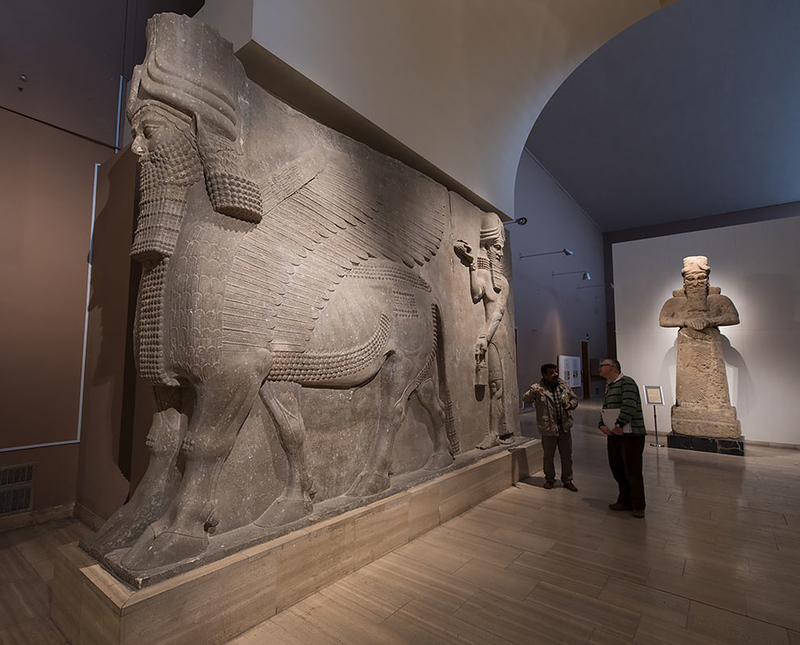 Raad and Julian in front of a very large and imposing Lamassu, an Assyrian protective deity having a human's head, a body of a bull and the wings of a bird. 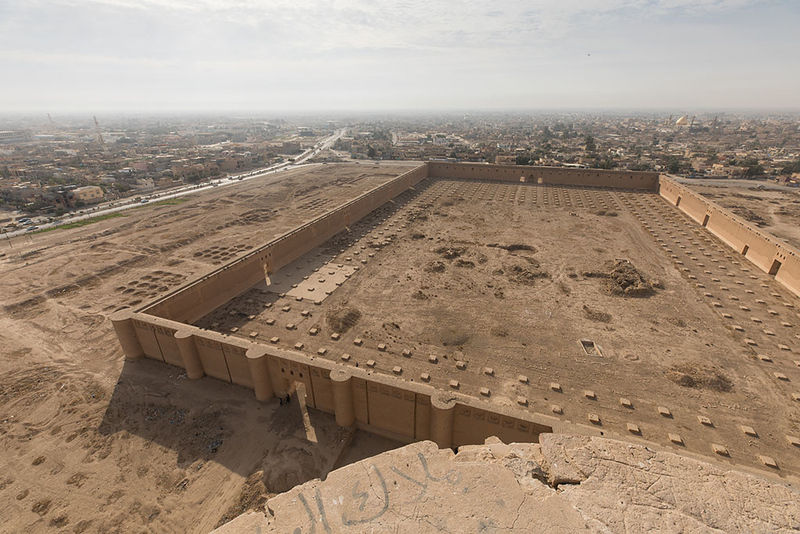 It was excavated from Dur-Sharrukin ("Fortress of Sargon"), 15 km northeast of Mosul. 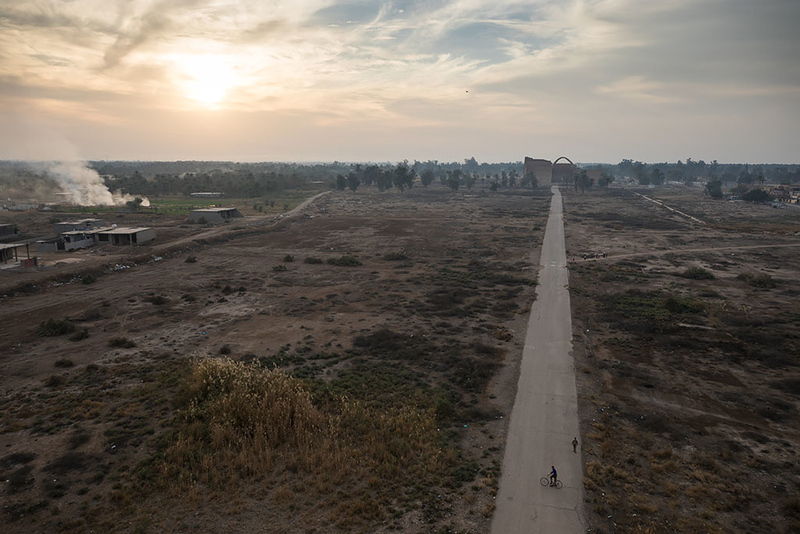 A picture of the Ishtar Gate, the eighth gate to the inner city of Babylon that was constructed in ~575 BC by order of King Nebuchadnezzar II. 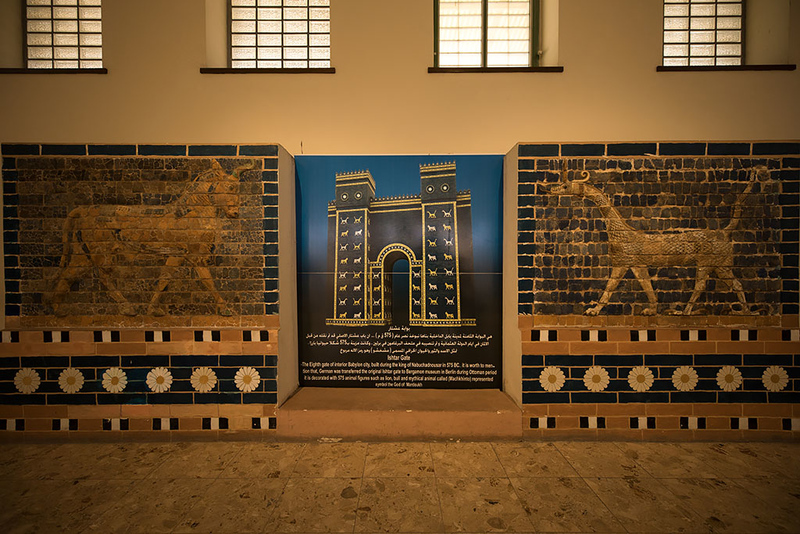 After excavation from 1902 to 1914 by the German Archaeologist, Robert Koldewey", the Ishtar Gate was rebuilt at the Pergamon Museum in Berlin in the 1930's. 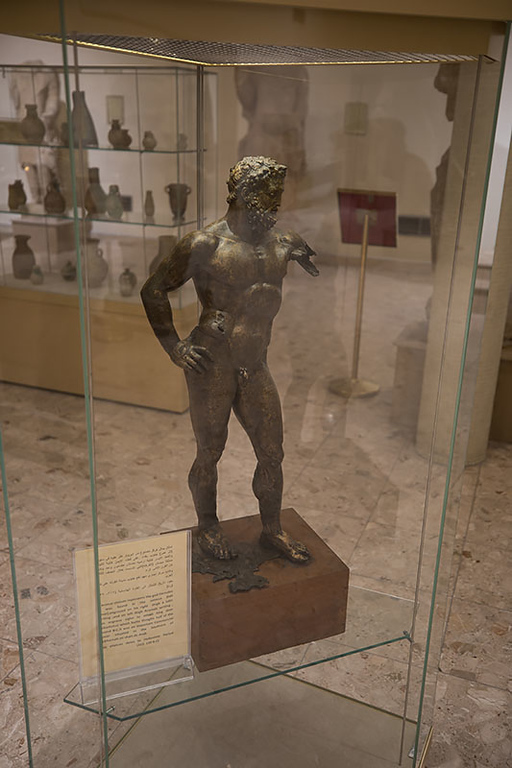 A bronze statue of the god Hercules dating from the Hellenistic period (312-139 BC). 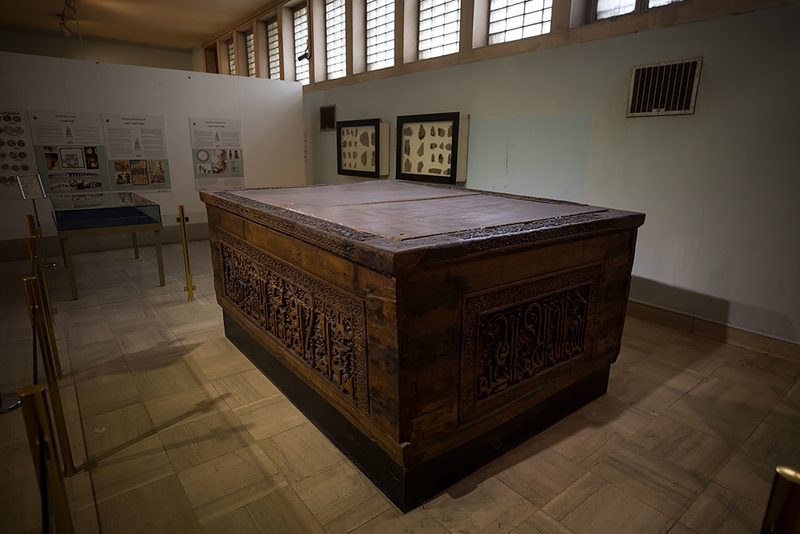 In the final section of the museum, the Islamic period, with the wooden box of the seventh imam, Al-Imam Musa al-Kadhim bin Jaa'far Al-Sadiq bin Mohammed al-Baqir bin Ali Zine Al-Abidin bin Al-Hussein bin Ali bin Abi Talib (peace be upon them). 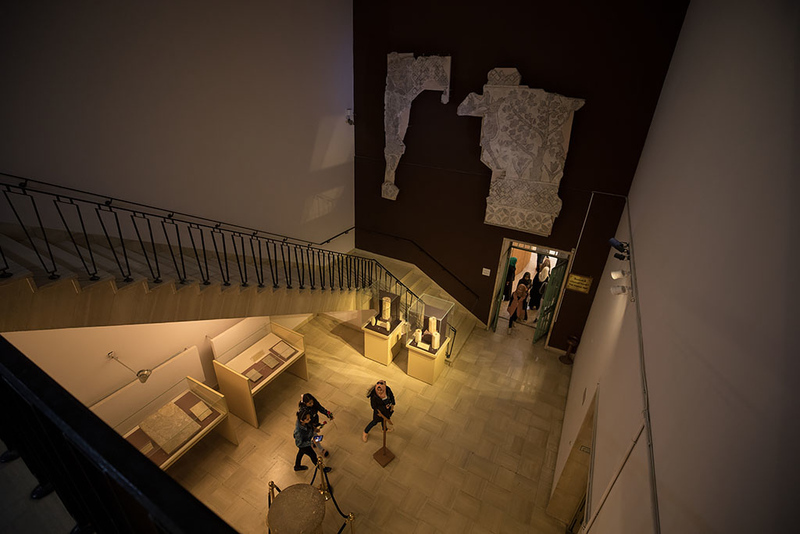 The museum was amazingly comprehensive and despite the looting in 2003, it was still rich with art and artifacts from the ancient Sumerian, Babylonian, Akkadian and Assyrian civilizations. 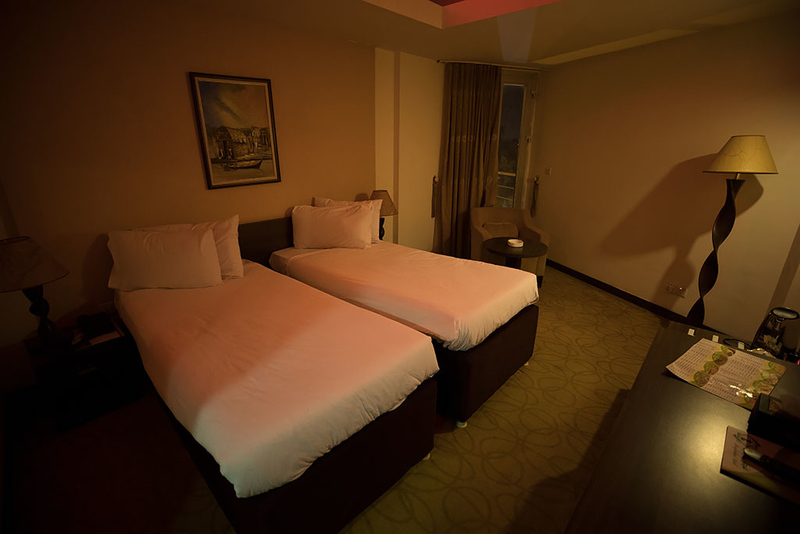 It was quite a delight to explore in our few hours there and really exceeded my expectations. 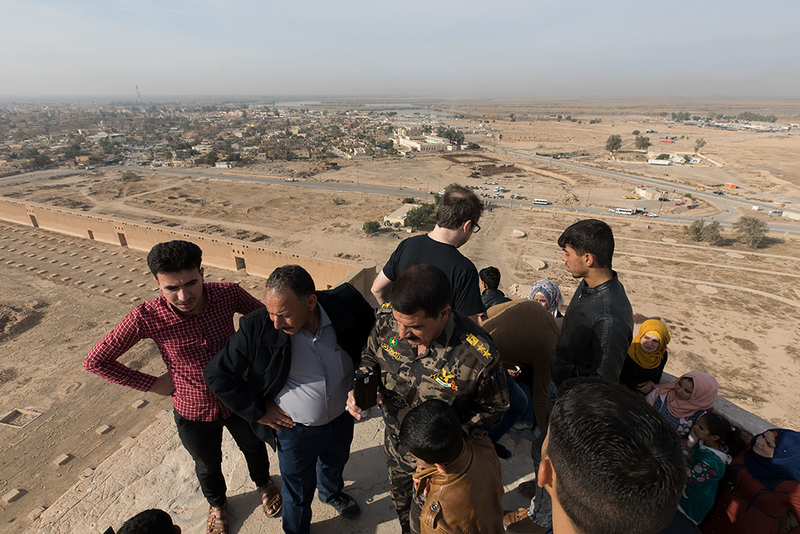 After our dose of ancient history at the museum, we then headed out to see some more of Baghdad. 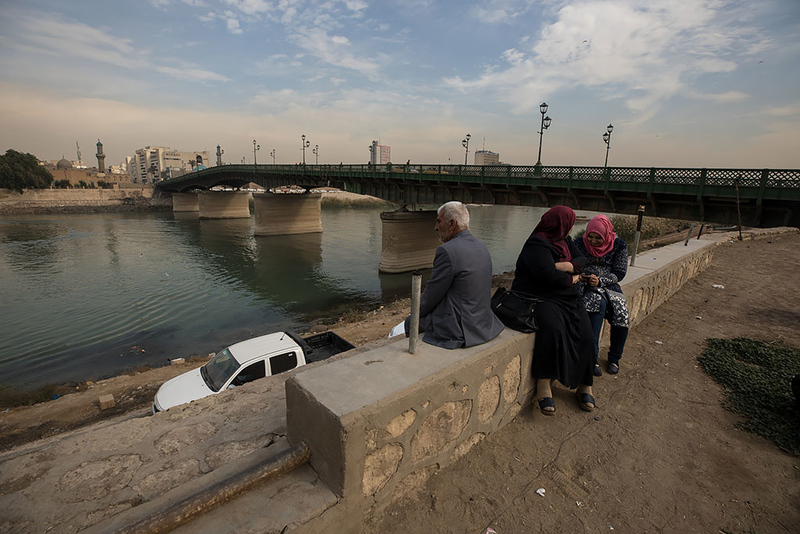 Locals enjoying a break beside the Tigris. 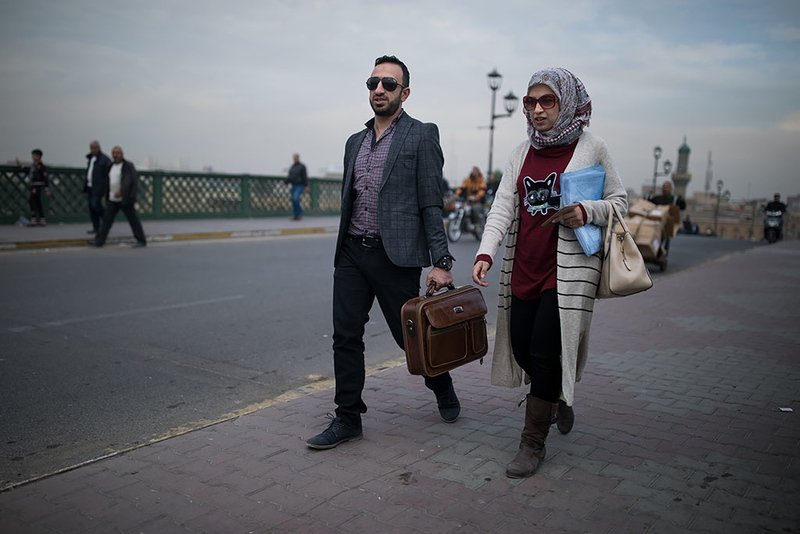 We then walked over the bridge to cross the Tigris. We were stopped briefly by the Police to check our paperwork but they were very friendly and welcoming. And happy to pose for a photo. 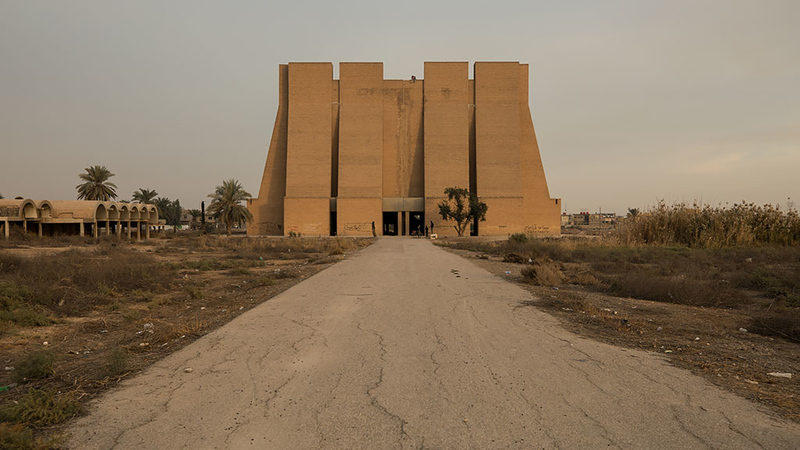 Mustansiriya Madrasah on the banks of the Tigris. 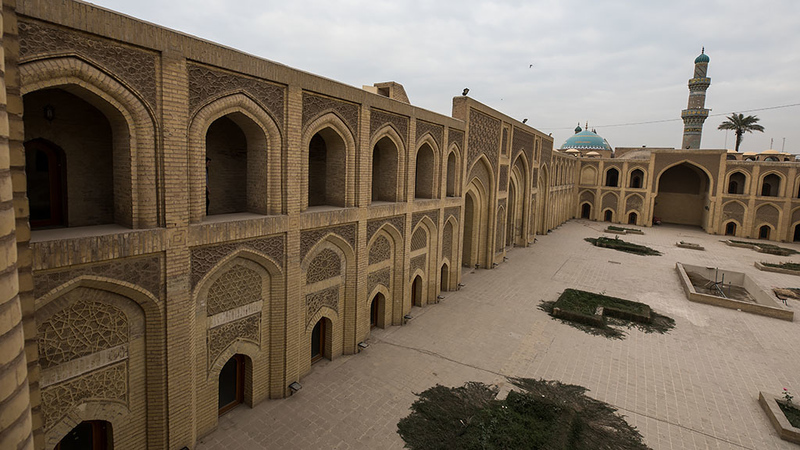 Established in 1227 it is one of the oldest madrasahs in the world. 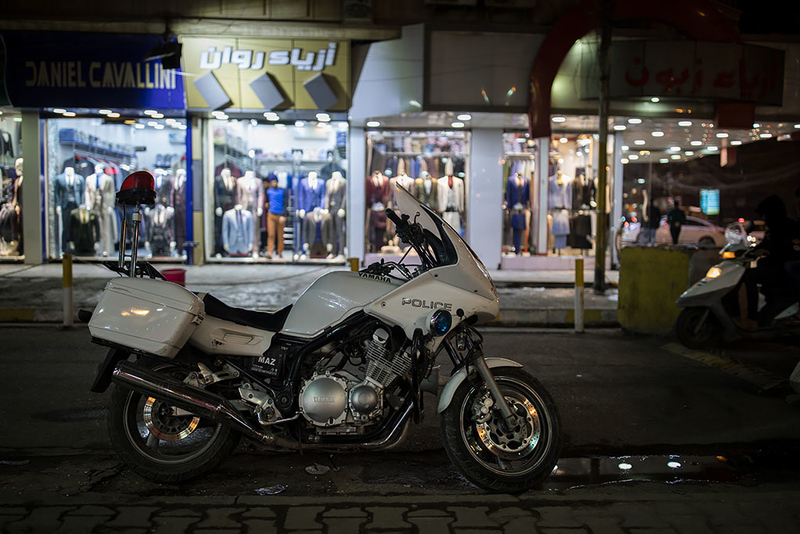 We then went to explore the nearby Souk al-Safafeer. 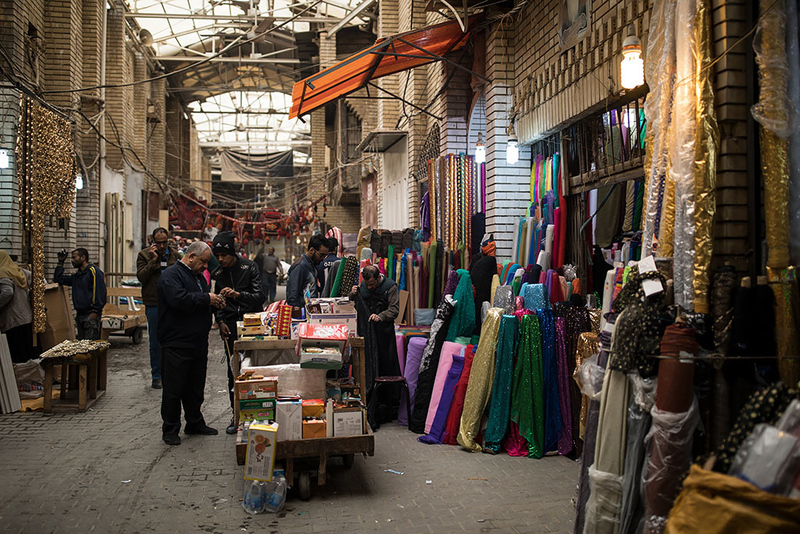 Originally a copper market but some of the shops have now been displaced by fabric shops. 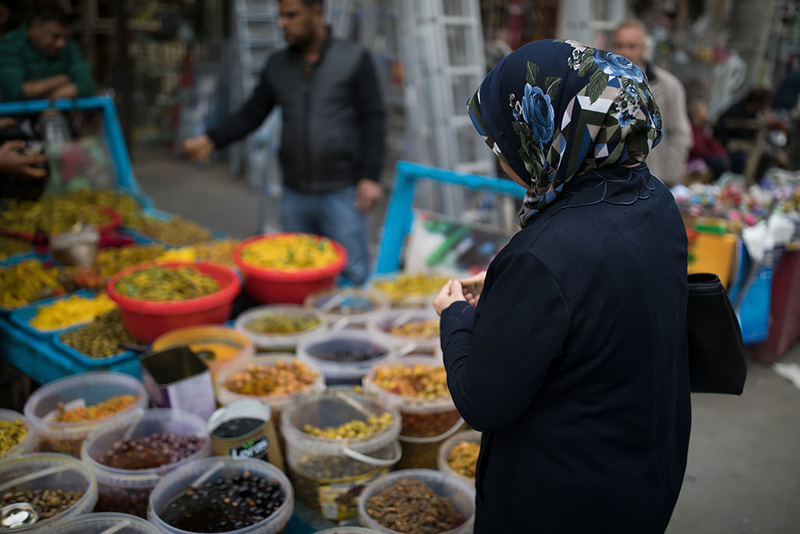 The souk is named after the arabic word for copper, "safra". 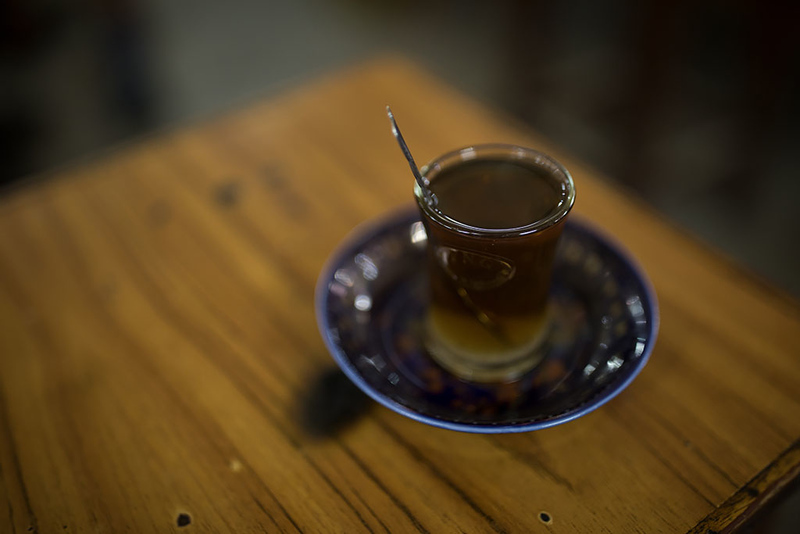 A great place to chat and interact with the locals. 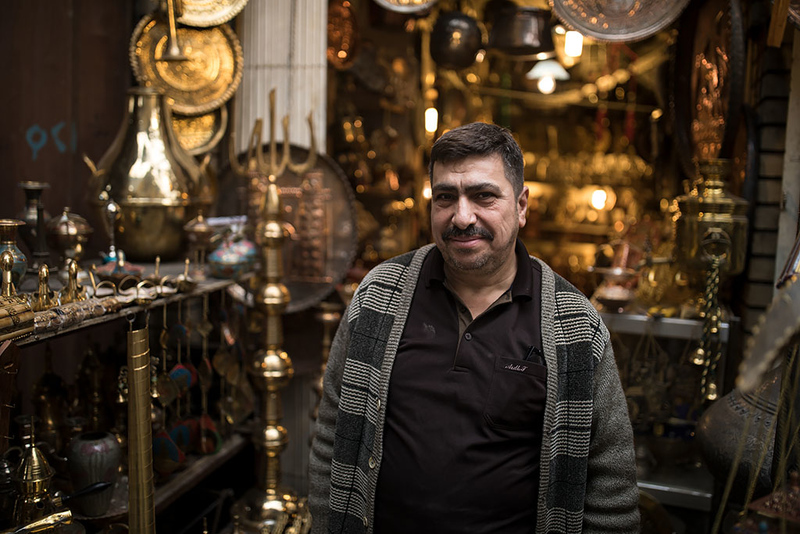 Shopkeeper. 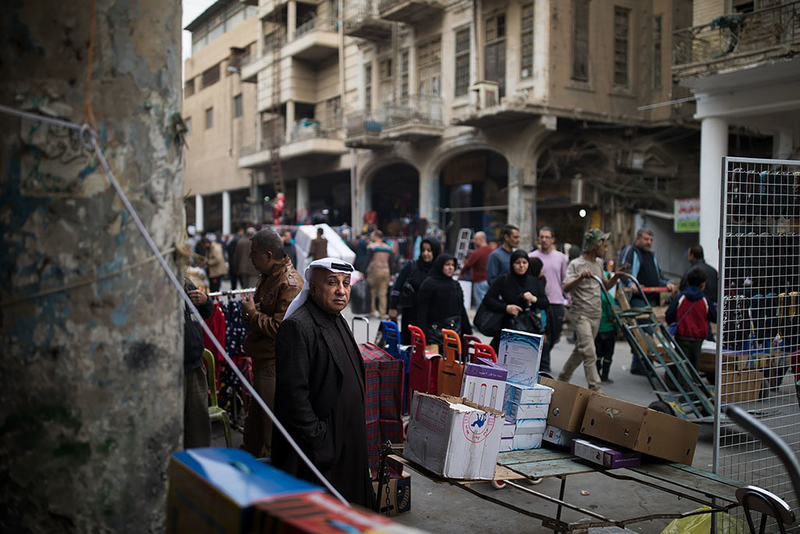 In 2003, before the US invasion, the souk was visited by French President Jacques Chirac. 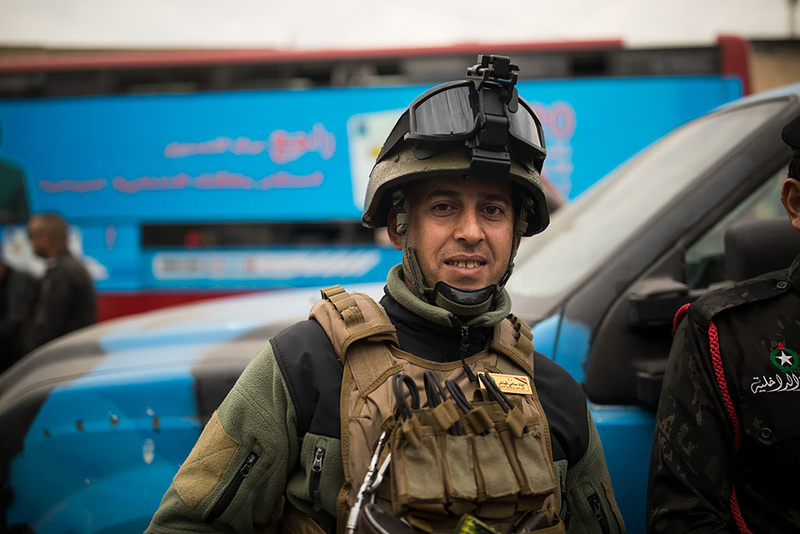 A man wearing a red and white checkboard keffiyeh. 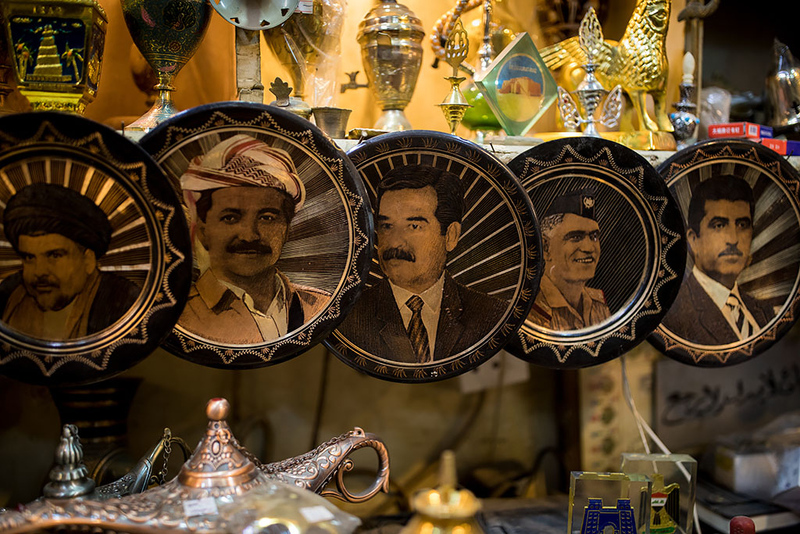 From left is Muqtada al-Sadr (the Iraqi Shia cleric), Masoud Barzani (former President of Iraqi Kurdistan), Saddam Hussein (no introduction needed), Abd al-Karim Qasim (an Iraqi Army brigadier who seized power in the 14 July Revolution in 1958 after the overthrow of the monarchy) and Mustafa Barzani (Kurdish nationalist leader). 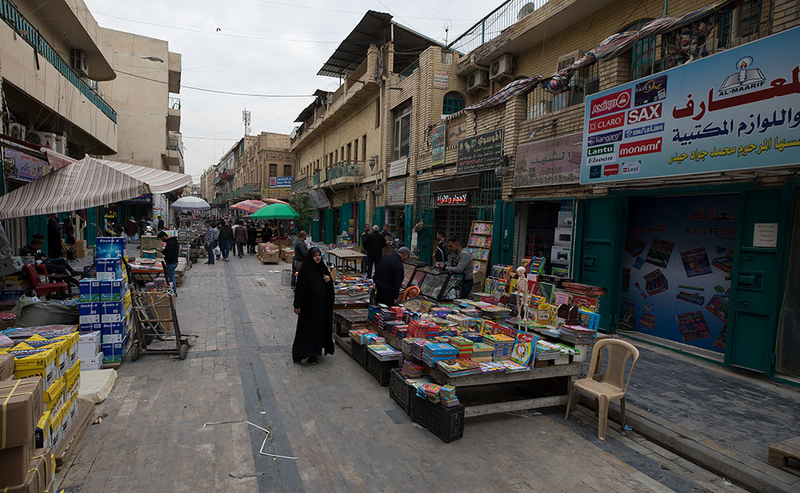 We then wandered out into the busy Al Rasheed Street, one of the main streets in downtown Baghdad. Another great place to mingle with the locals. Stopping to pick up a few souvenirs. 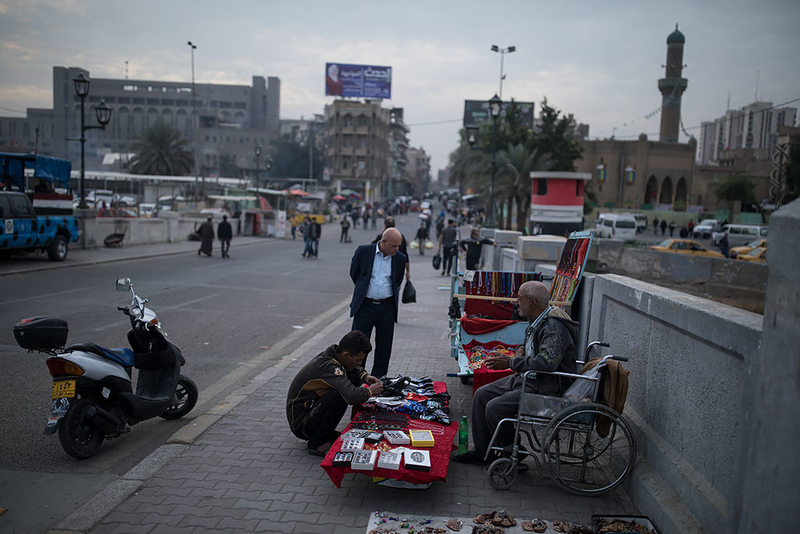 Walking along Mutanabbi Street, a street filled with bookstores and outdoor book stalls and named after the 10th-century classical Iraqi poet Al-Mutanabbi. 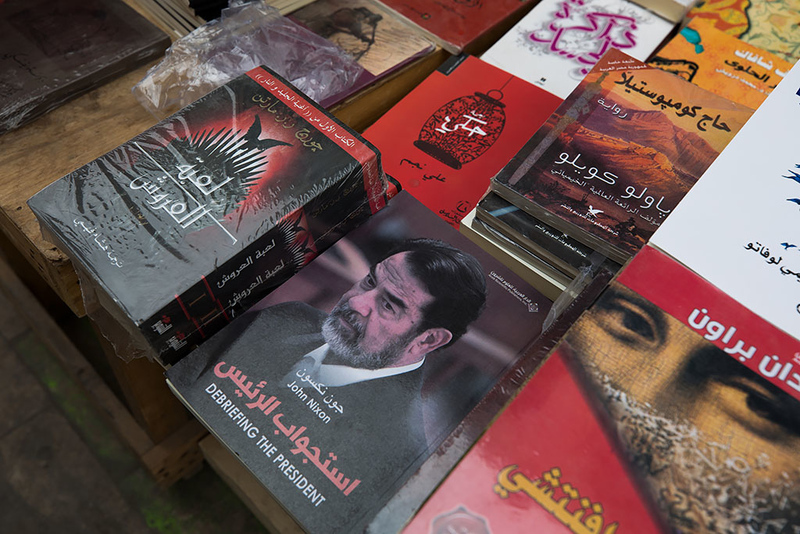 An Arabic translation of the book "Debriefing The President" by John Nixon for sale. 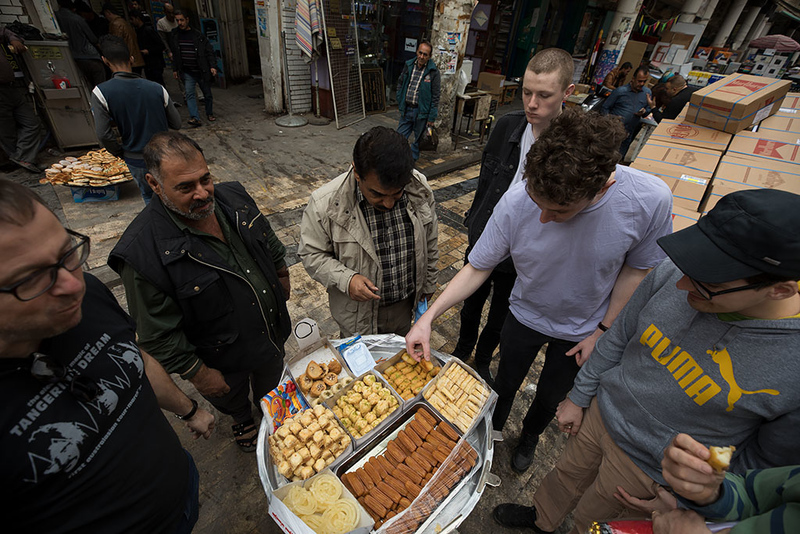 As it was Thursday afternoon (and the last day of the week), the cafés and kebab shops had closed early, so we stopped to feast at a local baklava stall instead for a sweet midday snack. 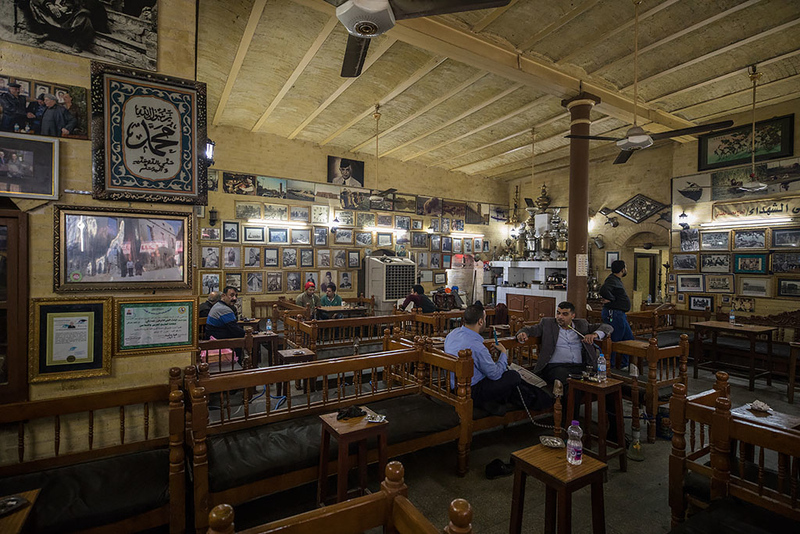 We then retreated to the nearby Shabandar Café, one of the most famous cafes in Baghdad. 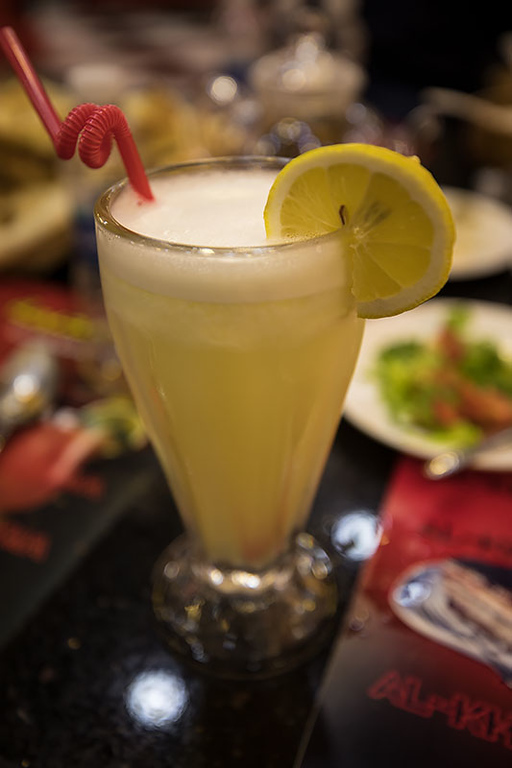 The café was founded in 1917 in the building of a former printing press. 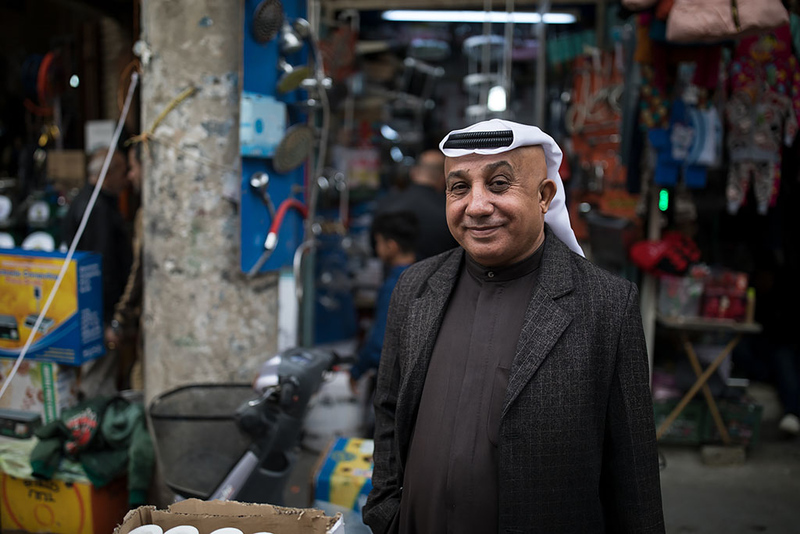 The current owner of the café shop since 1963 is Haj Mohammed Al-Khashali and there were numerous photo's of him on the wall from over the years. Enjoying some super sugary tea. 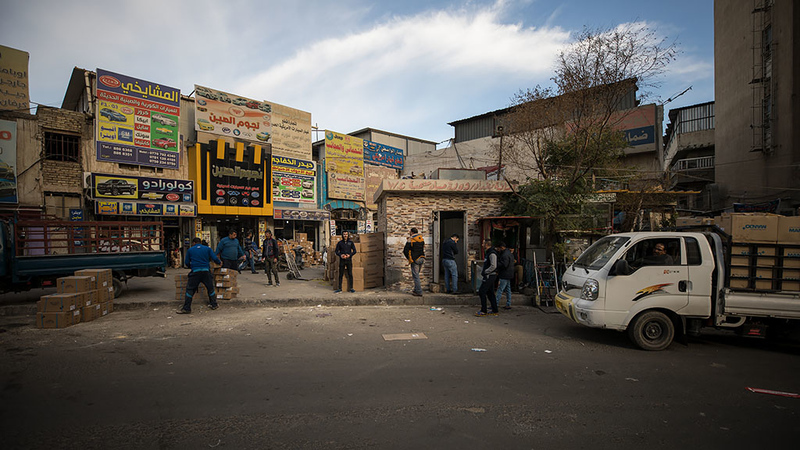 In 2007, March 5th, the café was attacked by a car bomb, killing more than 100 people including five sons of the owner Haj Mohammed Al-Khashali. It was eventually rebuilt and reopened in 2014. 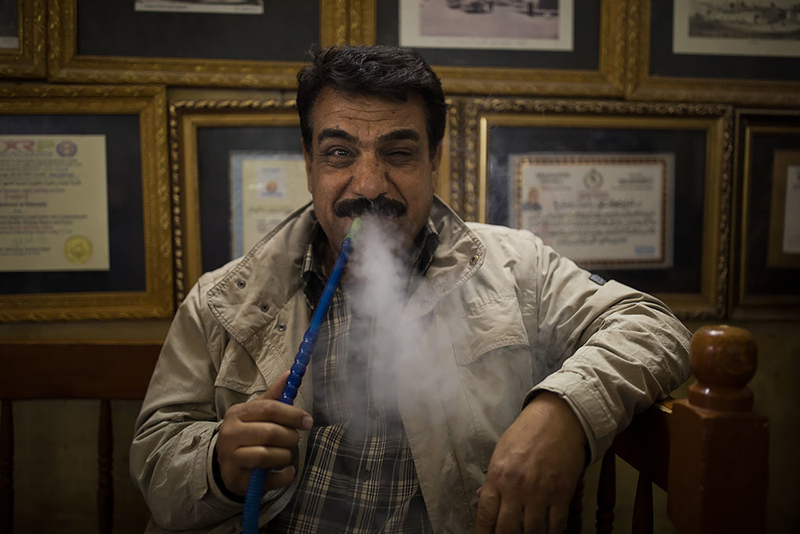 Raad relaxing and enjoying some Sheeshah. 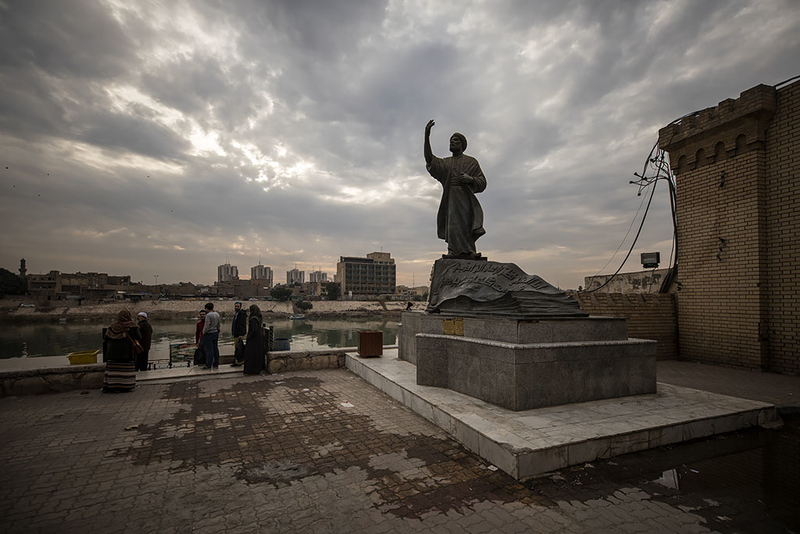 We then wandered to the end of Mutanabbi Street to the banks of the Tigris where there was a statue of Iraqi poet Al-Mutanabbi. Instead of crossing the bridge we opted for a short boat ride on the Tigris river instead. 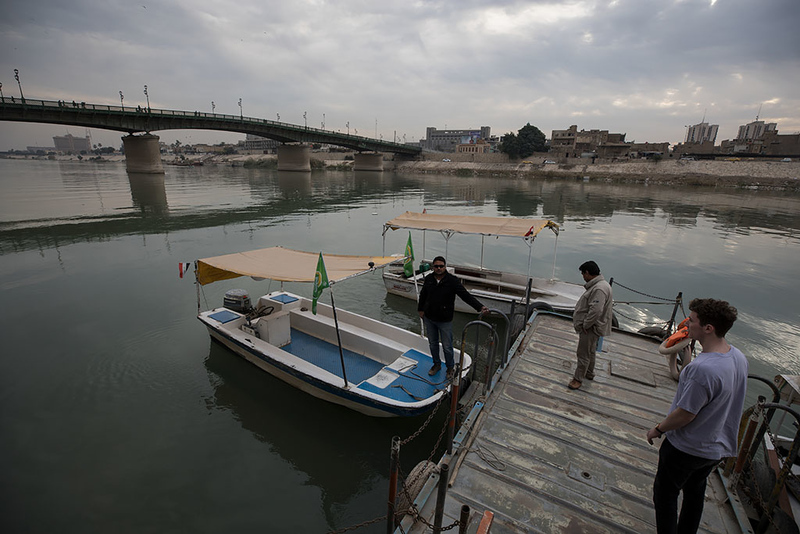 I had also taken a boat over the Tigris to cross into Syria from Iraq back in 2016 so it was great to cross again this time in the centre of Baghdad. 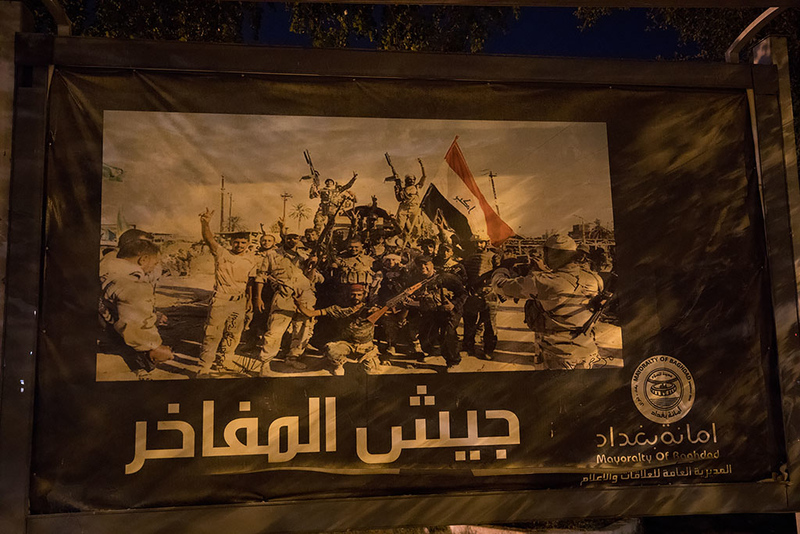 At Tahrir (Liberation) Square, which commemorates the 1958 establishment of the Republic of Iraq and features a monument depicting the struggle of the Iraqi people to achieve liberty. 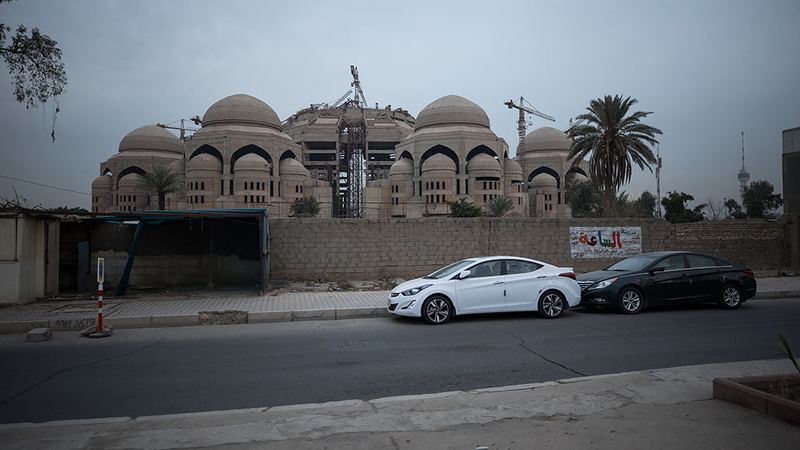 We then drove out to Baghdad's Mansour neighbourhood to check out the unfinished Al-Rahman mosque, another that was halted after the 2003 invasion. We were quickly spotted and yelled out by some militiamen for taking photographs so unfortunately couldn't get any closer. 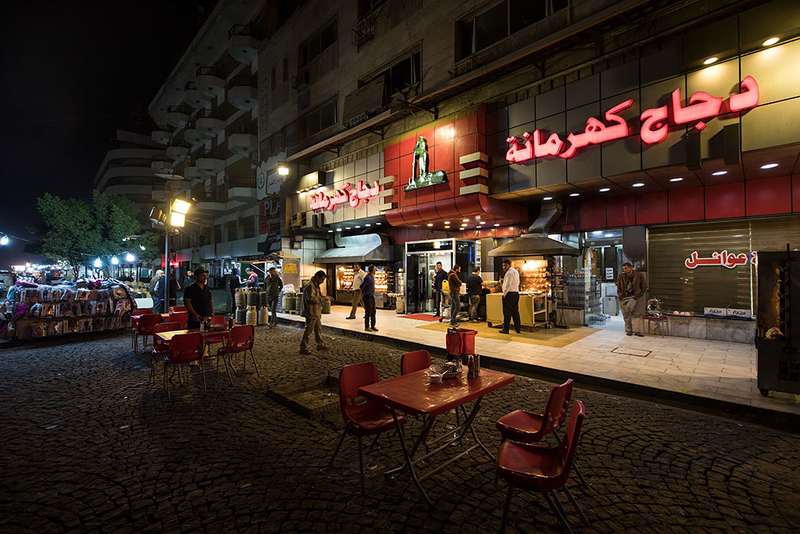 Back in Central Baghdad we headed to Dijaj Kahramana Restaurant for dinner. 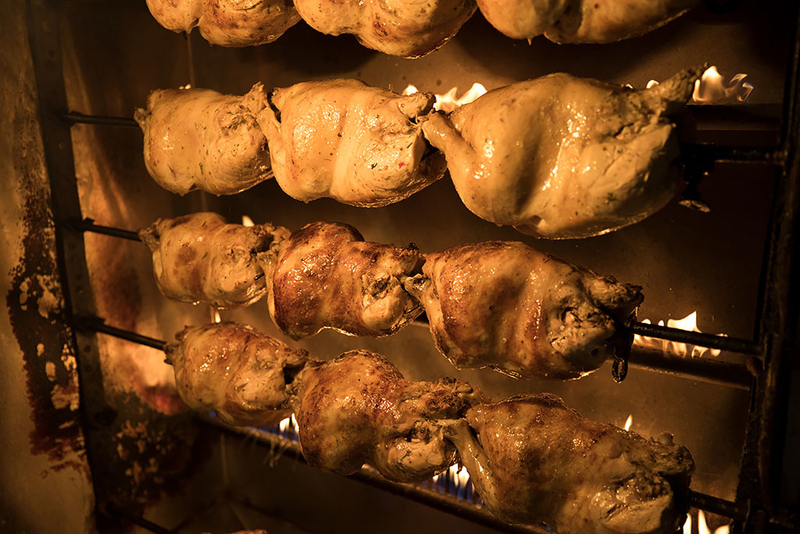 Plenty of chickens roasting on the rotisserie. 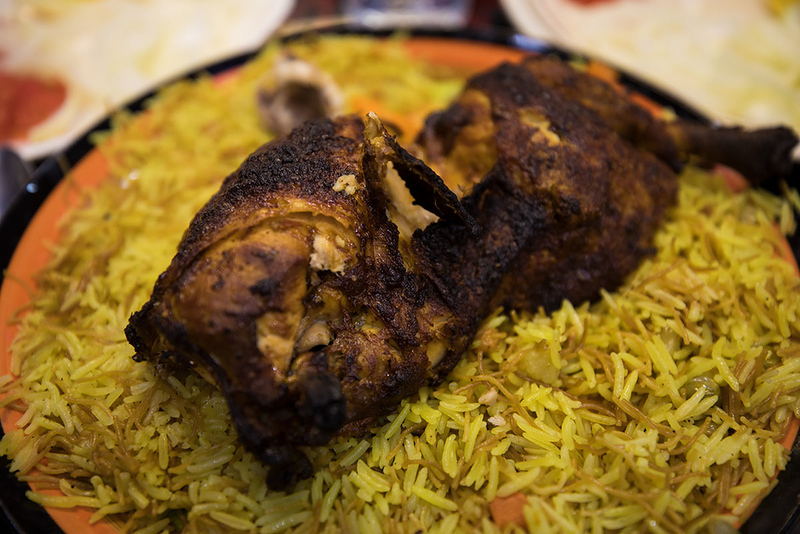 And a sizable portion of chicken and rice for a very tasty and filling dinner. 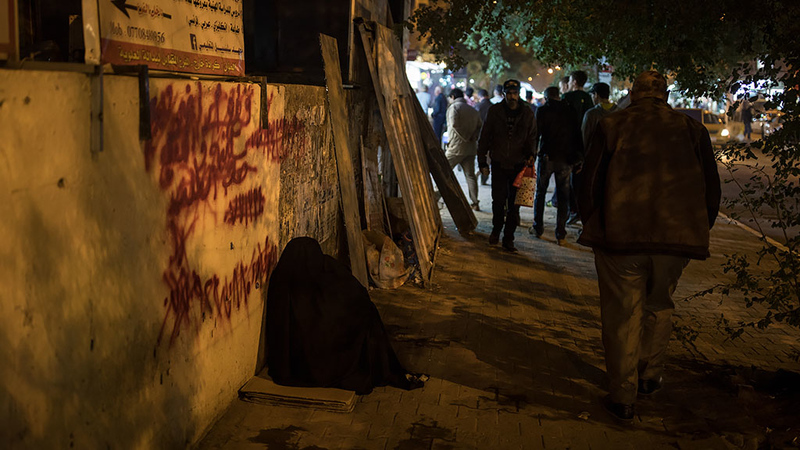 We then headed out for a evening walk along the streets. 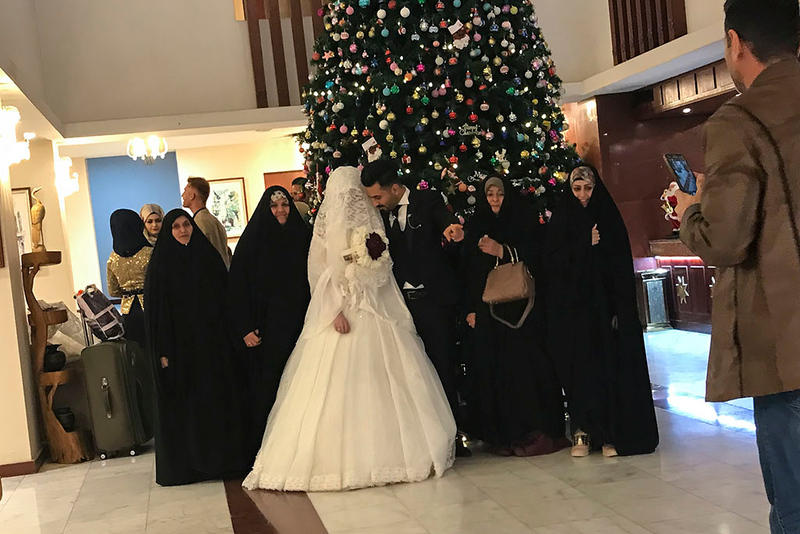 And back at the Baghdad Hotel with another newly wedded bride and groom at the end of a great day exploring Baghdad. Enjoying another tasty breakfast before another busy day of sightseeing. 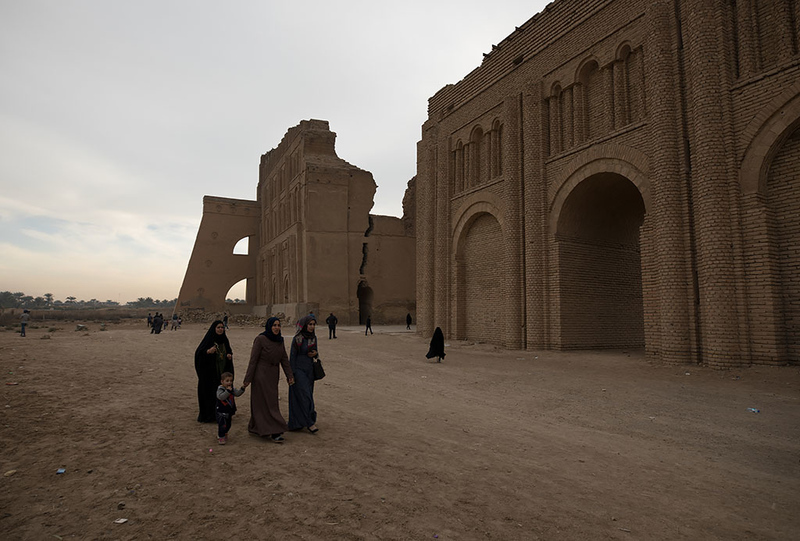 Today's plan was to head north of Baghdad to the Great Mosque of Samarra and then head back to Baghdad and then continue south to Salman Pak to visit the Archway of Ctesiphon. 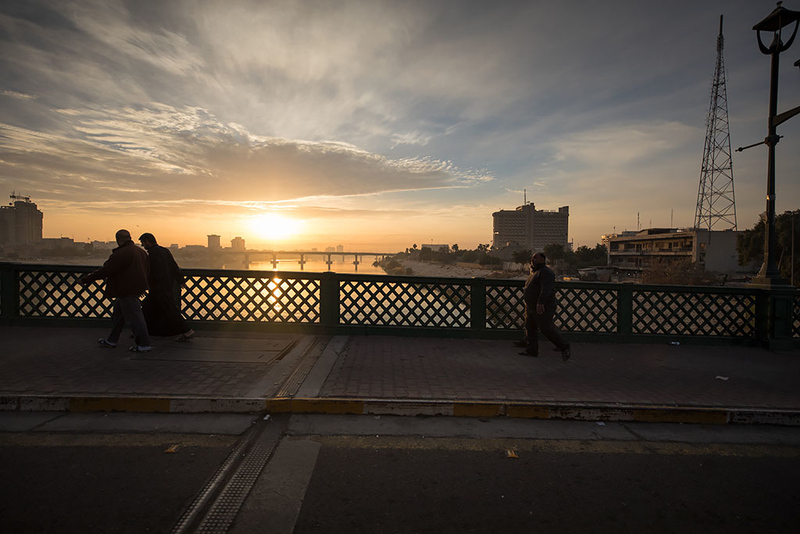 The sun rising in the east as we cross a bridge over the Tigris. 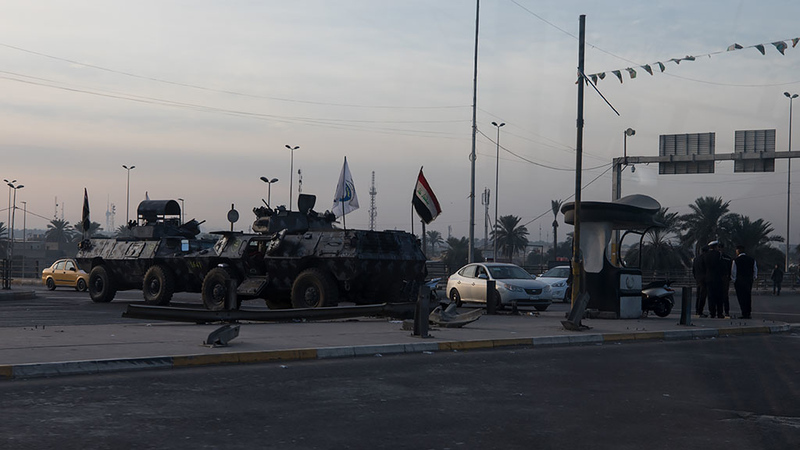 Armoured personnel carriers blocking the road. 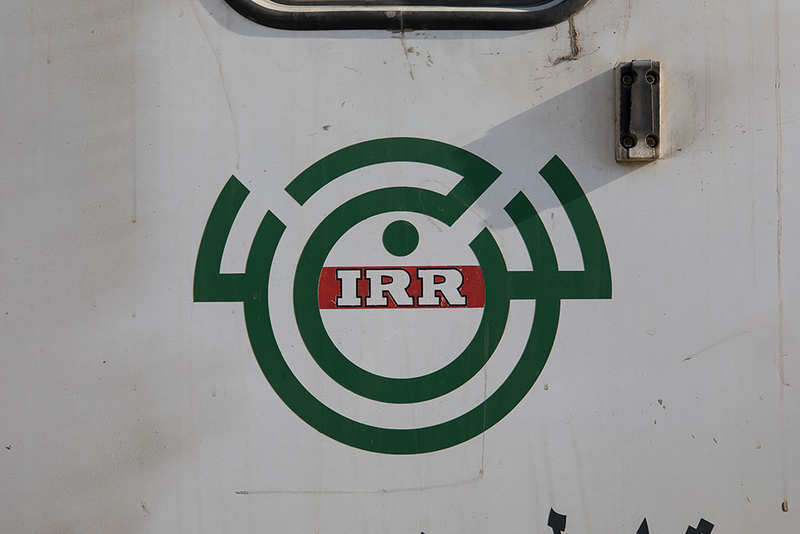 Raad said that there were frequent government protests on Friday morning after prayers so the Police close some of the roads to traffic to allow the people to march unimpeded. 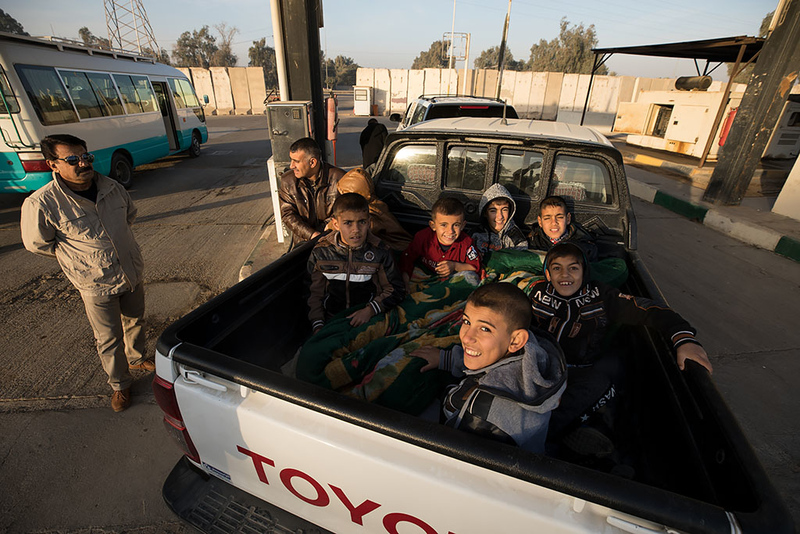 A pickup filled with kids as we stop to refuel just outside of Baghdad. 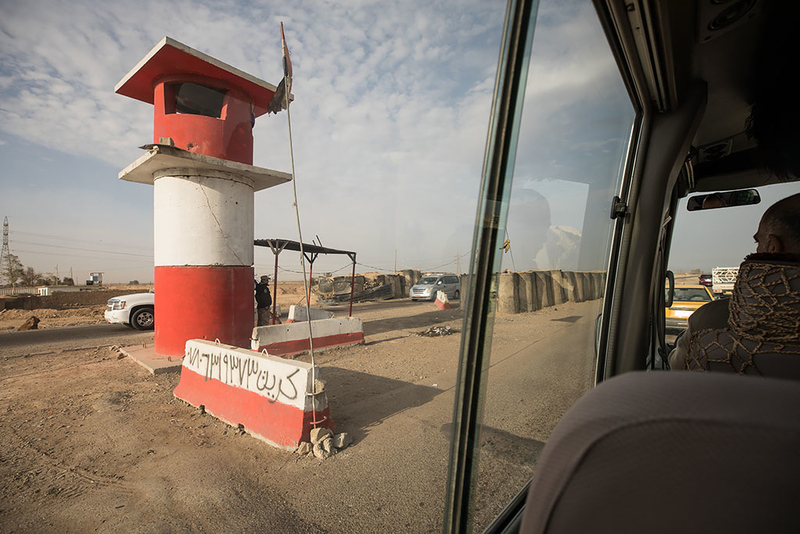 One of the many checkpoints we had to stop at as we headed north. 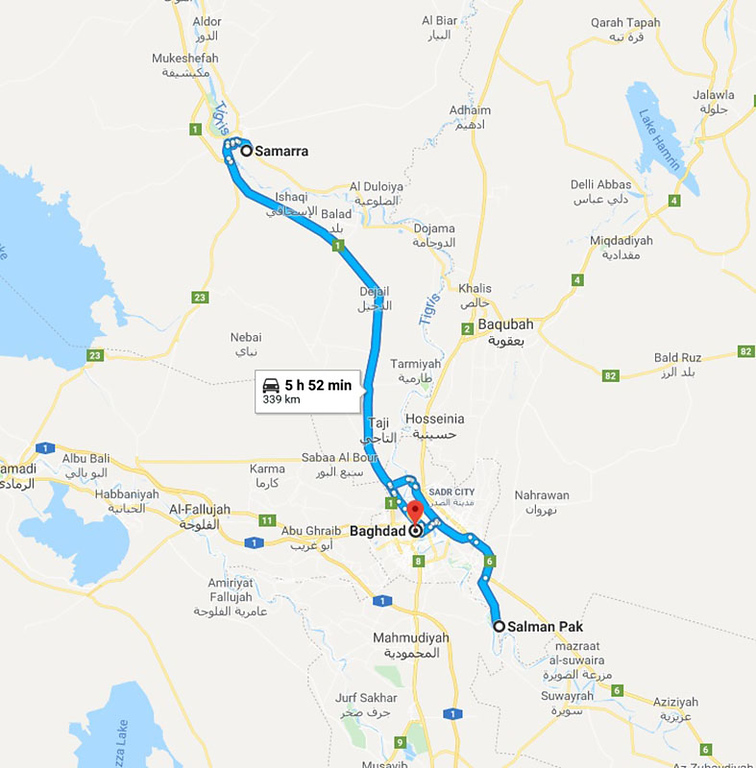 Although the checkpoints just outside of Baghdad were manned by the Iraqi Police, as we got further north they were under the control of the Shi'ite Militia, Sarāyā al-Salām, a reincarnation of the Mahdi Army (JAM; جيش المهدي Jaish al-Mahdī), and are led by Muqtada al-Sadr. 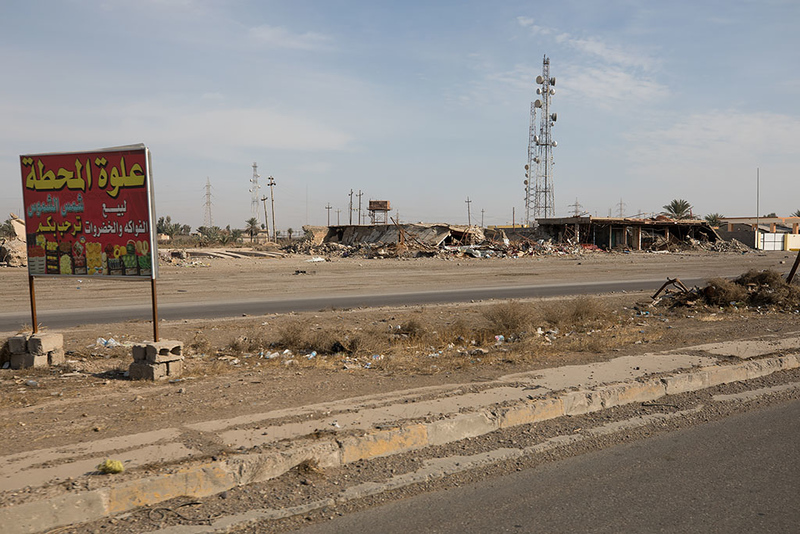 Unlike the other parts of Iraq we would be visiting on our trip, the official UK Foreign Office Travel advisory classified the area north of Baghdad around Samarra as a red zone, or "Advise against all travel". With the frequent militia checkpoints and occasional bombed and destroyed buildings about there was definitely a change in atmosphere. 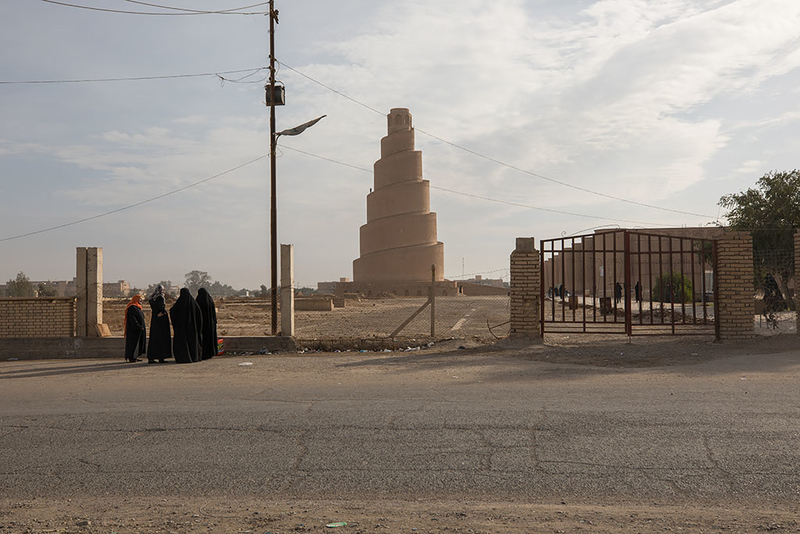 After ~2 hours we arrived on the outskirts of Samarra. 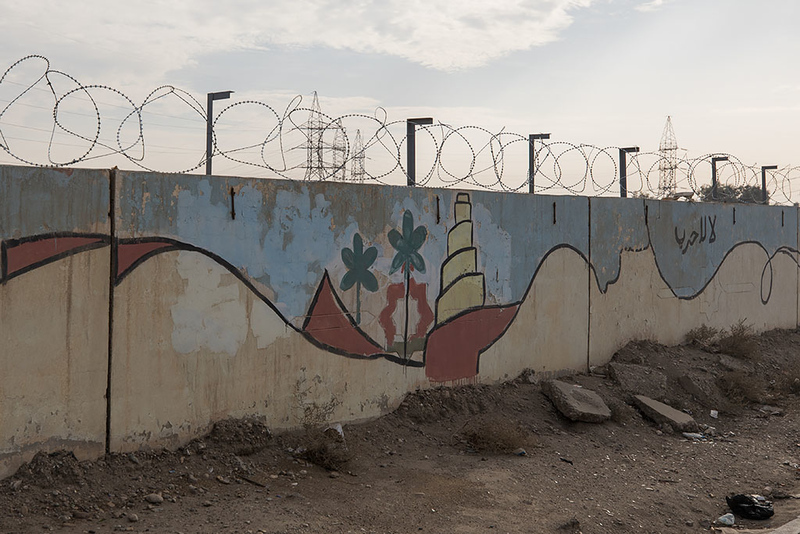 A mural with the Malwiya Minaret which we would be visiting shortly. As we got closer to our destination, there was a large milita checkpoint checking all the vehicles. While previously Raad had simply shown our paperwork from the Ministry of Tourism, this time they wanted to see our passports. 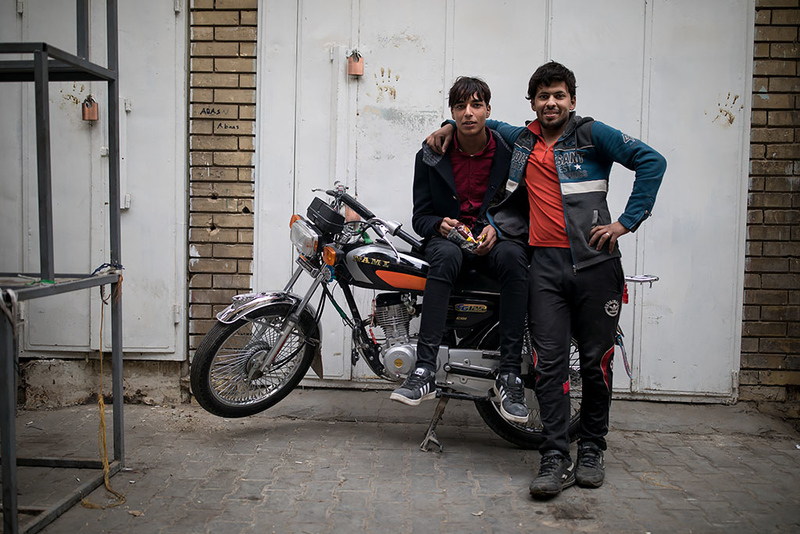 Harry and Alastair had left theirs back in Baghdad but Raad managed to use his charm and 15 minutes later we were on our way again. 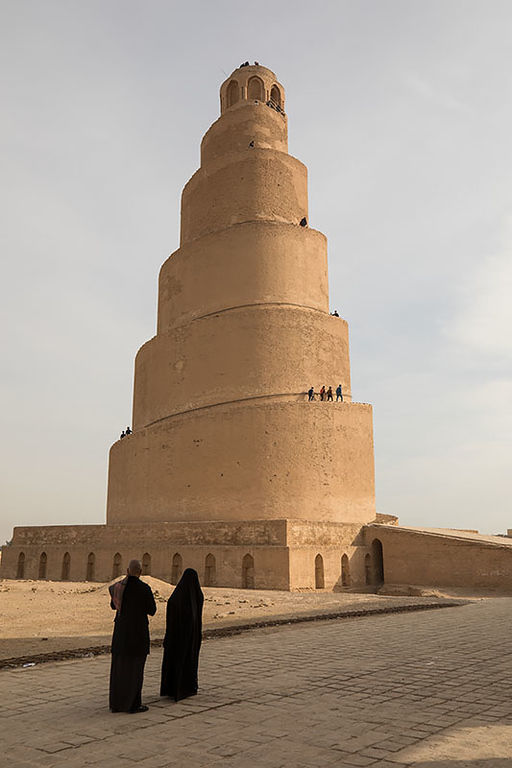 Looking across to the Malwiya Minaret at the Great Mosque of Samarra. The site administrator was very friendly and warmly welcomed us into his office. Raad then took us to visit the Minaret and the remains of the Great Mosque. 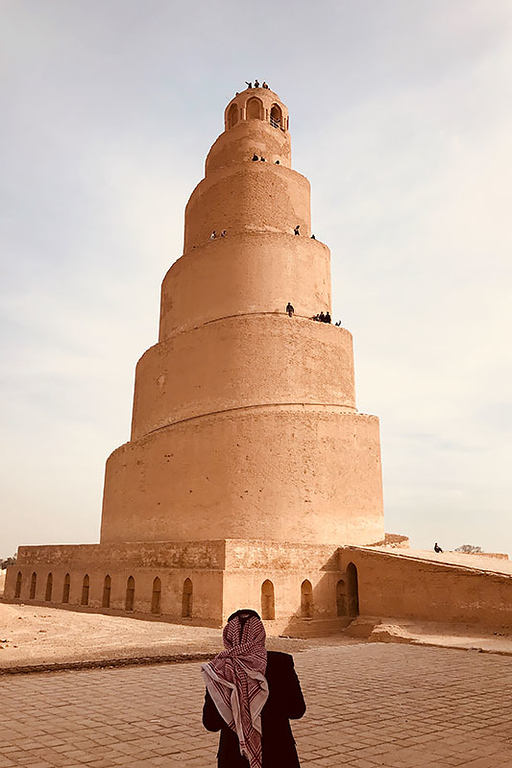 The Malwiya Minaret was built in 848–852 from sandstone and was originally connected to the mosque by a bridge. 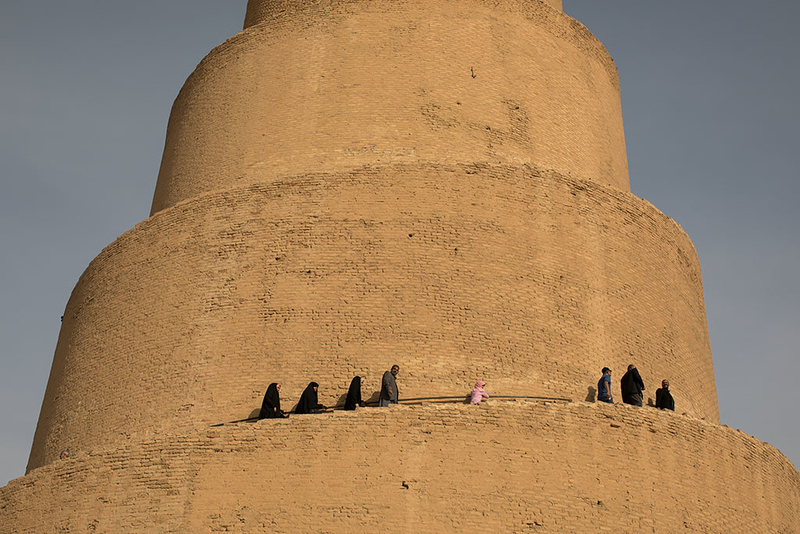 During the US occupation the minaret was also used by US soldiers as a lookout position. Walking over to the remains of the Great Mosque. 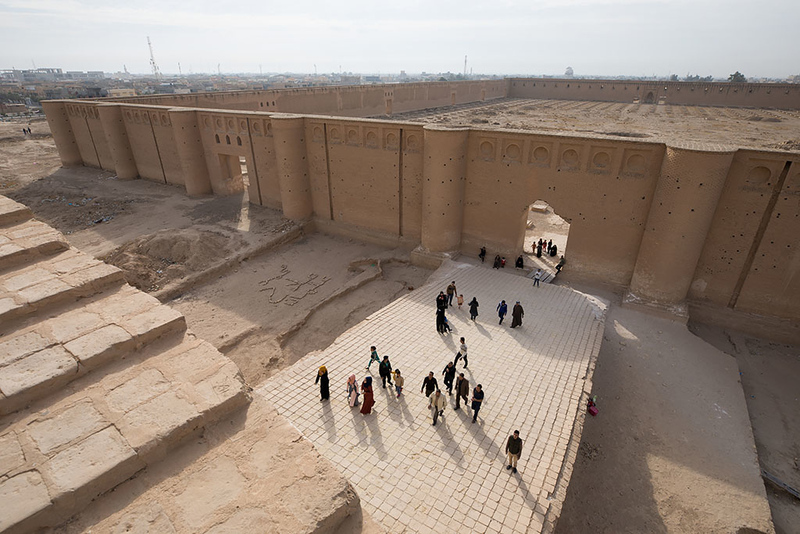 Since 2007 Samarra has been one of the five UNESCO World Heritage sites in Iraq. 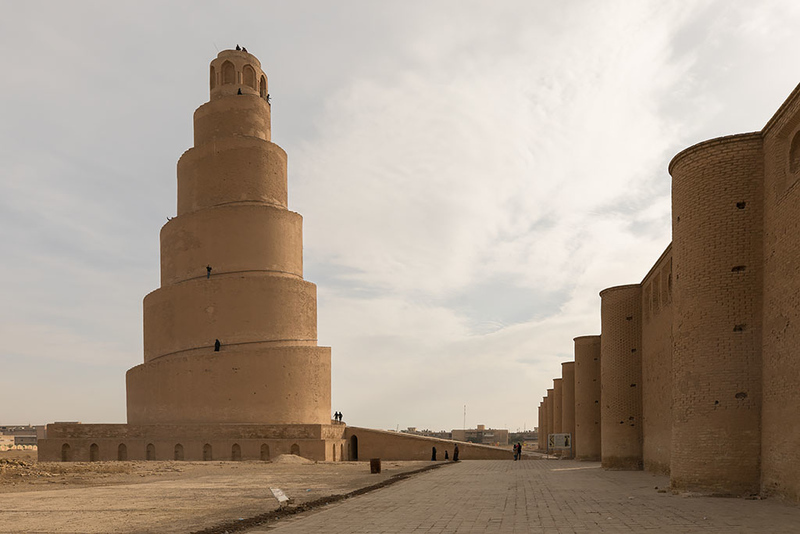 The Great Mosque of Samarra was at its time the largest mosque in the world. 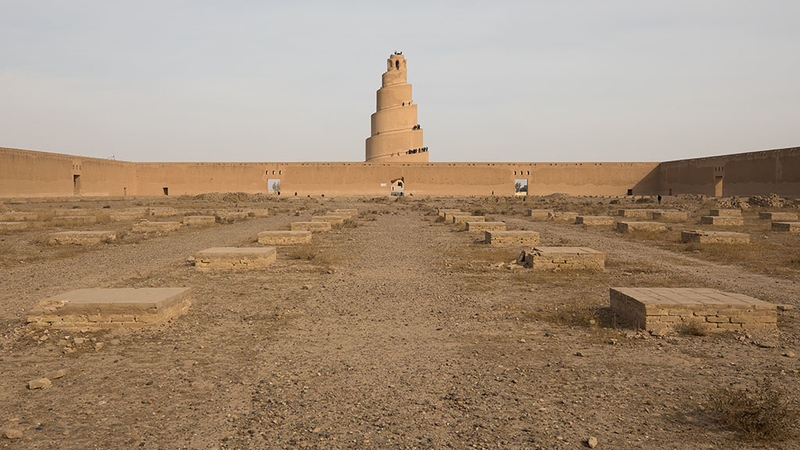 Only the outer wall and its minaret remain however after it was destroyed in 1278 after the Mongolian invasion of Iraq. Looking up at the minaret. There was no outer guard rails so I was a little nervous about the walk up! A local lady with a cellphone in hand who wanted to take a selfie with me. 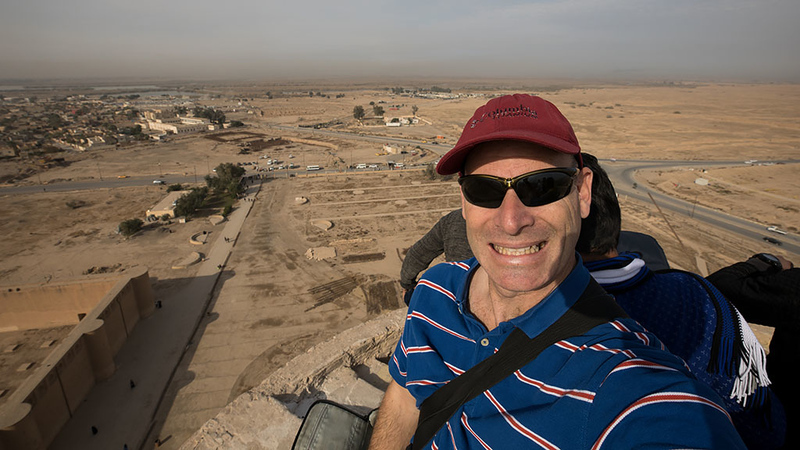 Gingerly joining the small crowd on top of the 52 metre tall minaret. 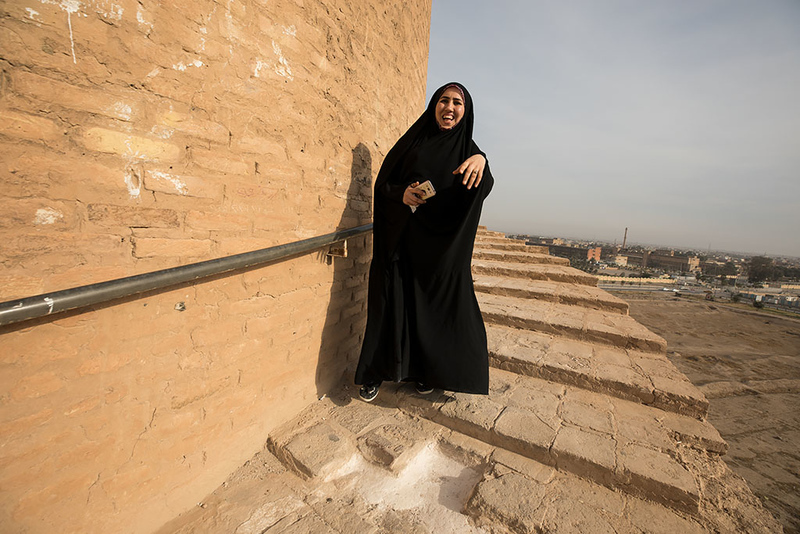 Taking in the view of the Great Mosque remains below. And a great place for a selfie! Taking in the view while safely back at the bottom again. Stopping for a coffee break before starting the journey back south. 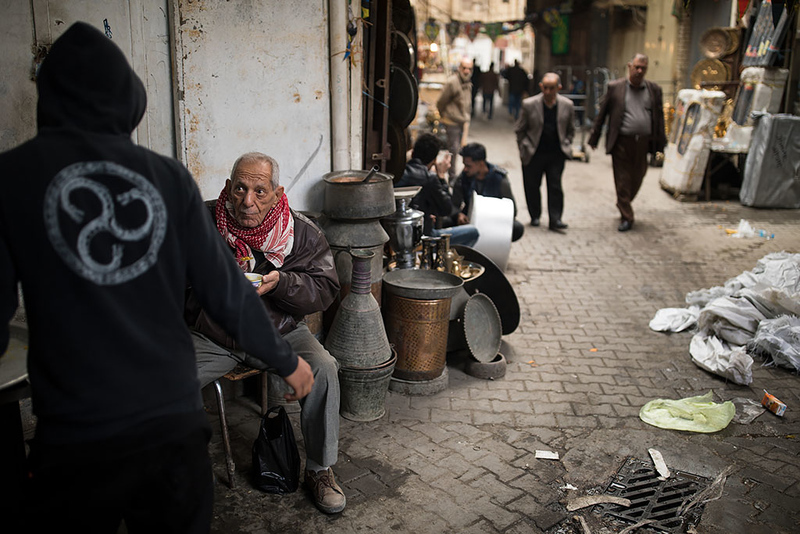 And the coffee vendor kindly posing for a photo. 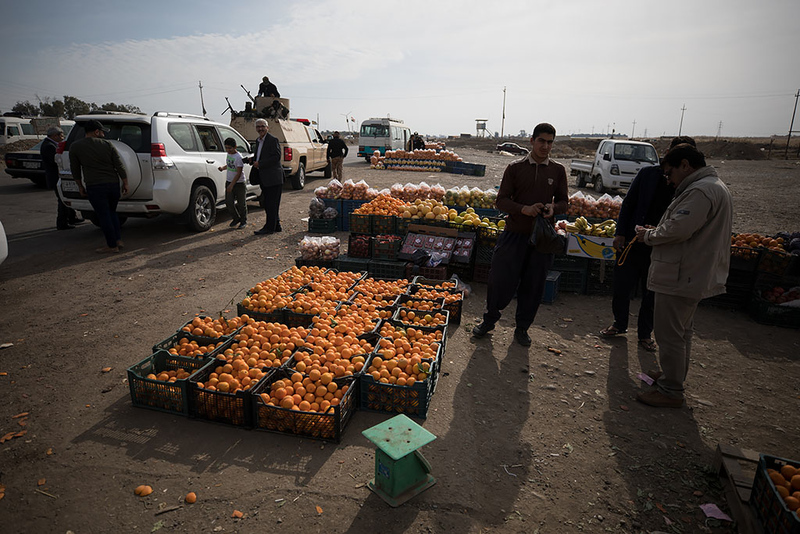 On the way back to Baghdad we stopped to buy some fruit. 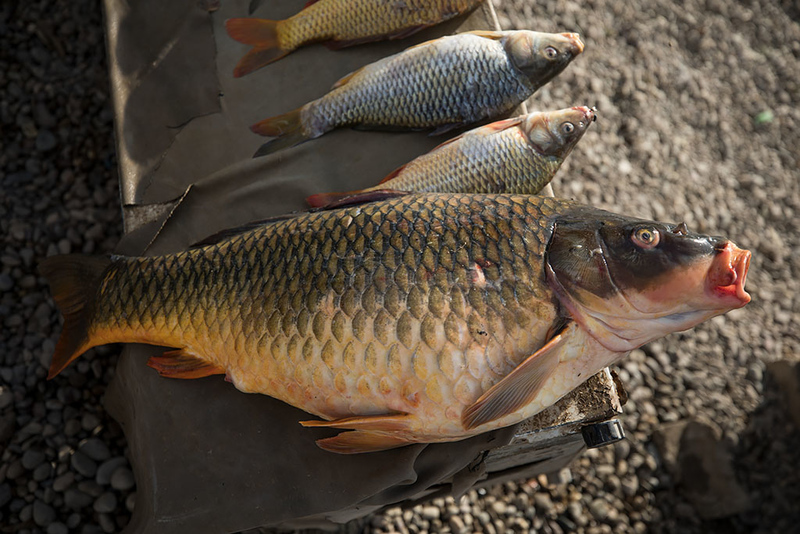 Some fresh fish from the nearby Lake Tharthar also for sale. 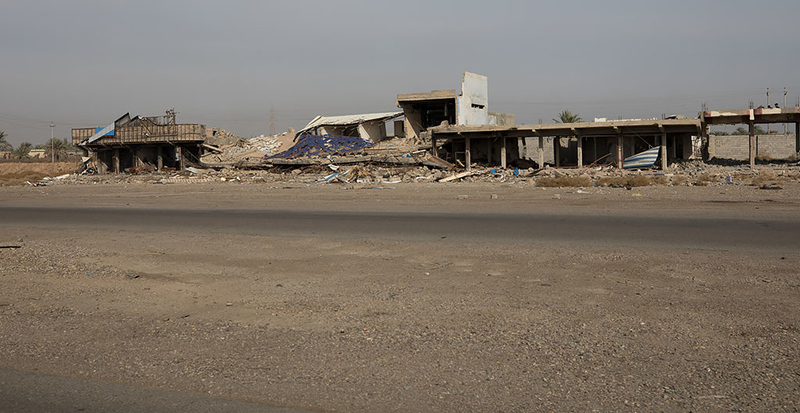 On the road back to Baghdad we saw plenty of ruined buildings. 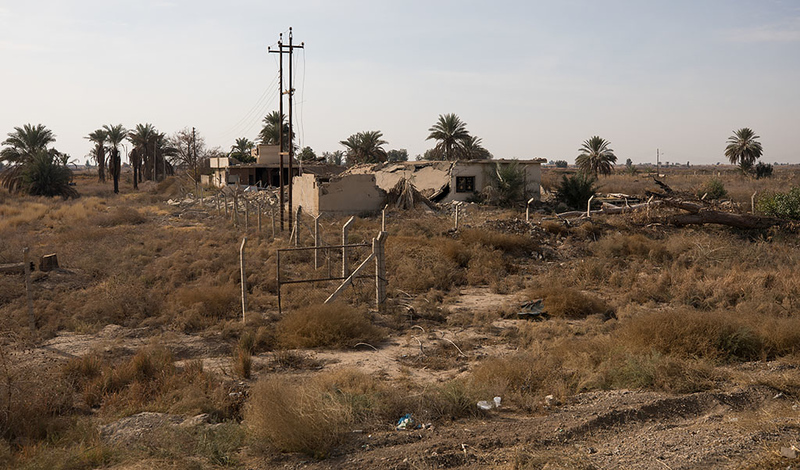 Raad said that they had been destroyed during the fight against ISIS. 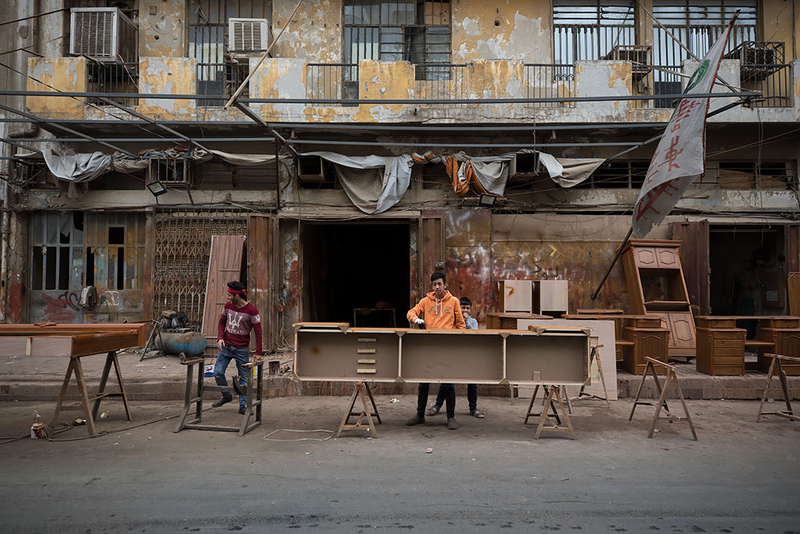 He also said that many had been demolished as part of Shia retribution against Sunni owned businesses. 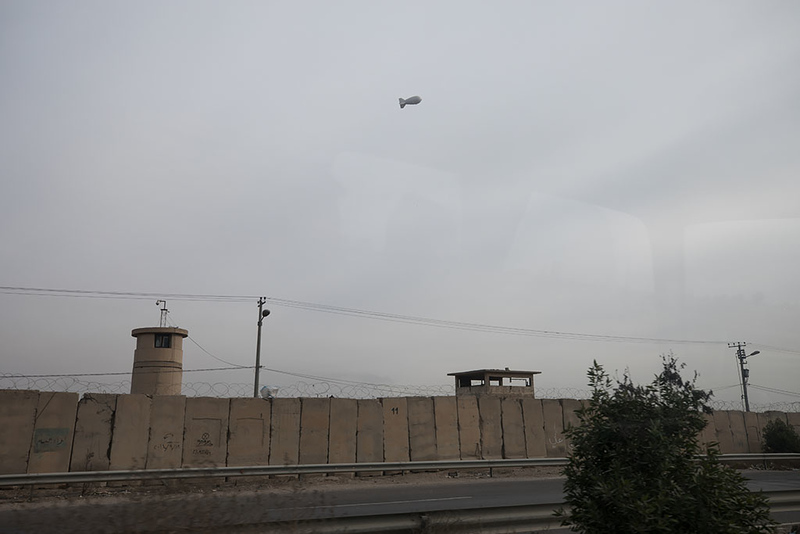 A spy surveillance balloon tethered above a military base. 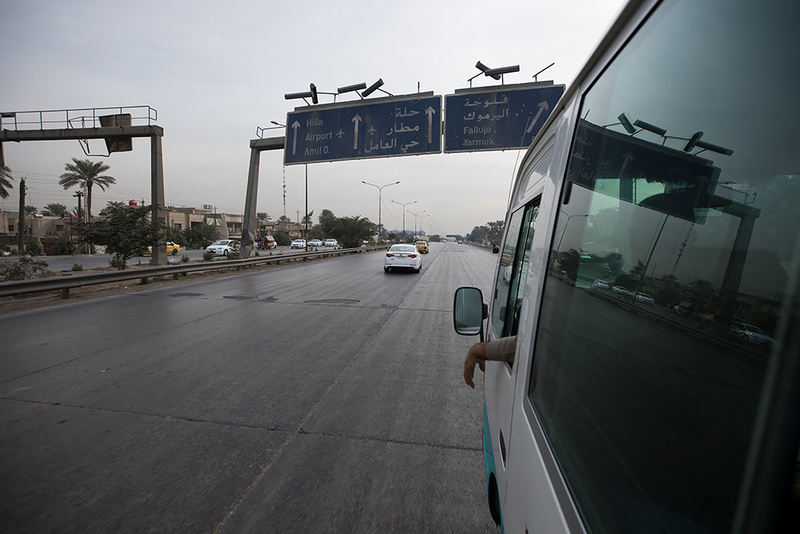 Back in Baghdad where we continued our journey south to Salman Pak. After arriving in Salman Pak just after 2:30pm we stopped for a late lunch. 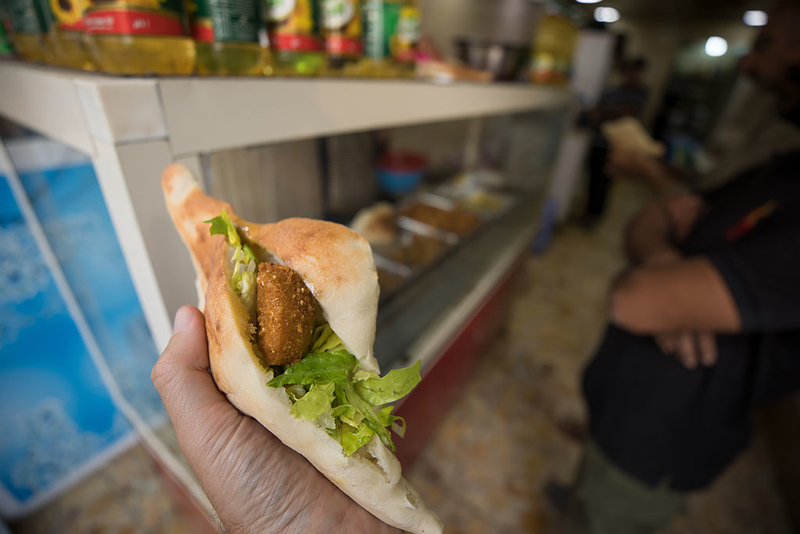 With some tasty falafel to fill the gap until dinner. Some of the other diners were asking for a photograph so I gladly obliged. 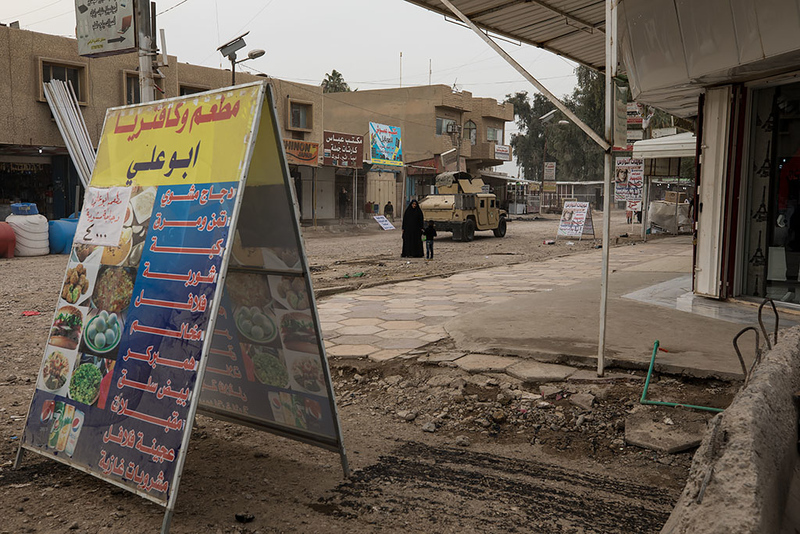 A passing Iraqi Army Humvee out on patrol on the main street. 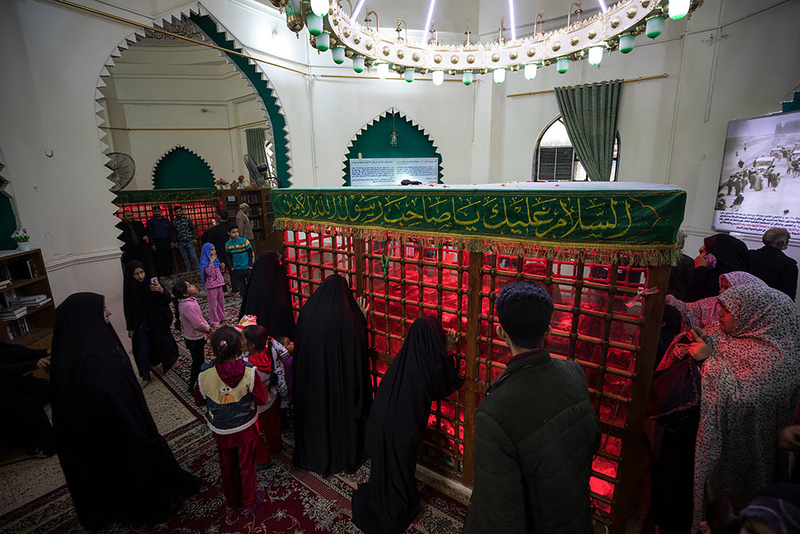 After our fix of falafel we headed to the nearby Al Sahaabi Salman Al Farsi Shrine. 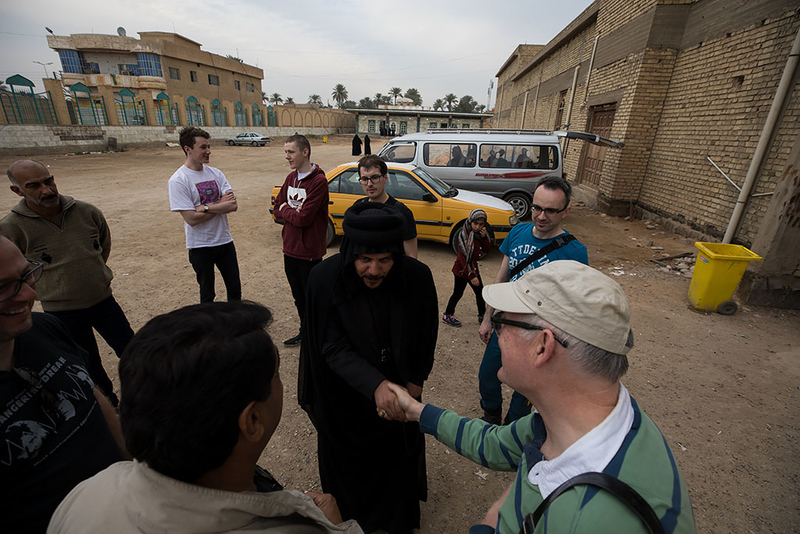 Outside we were warmly greeted by the head cleric of the shrine. After taking off our shoes we joined the pilgirms and headed inside. 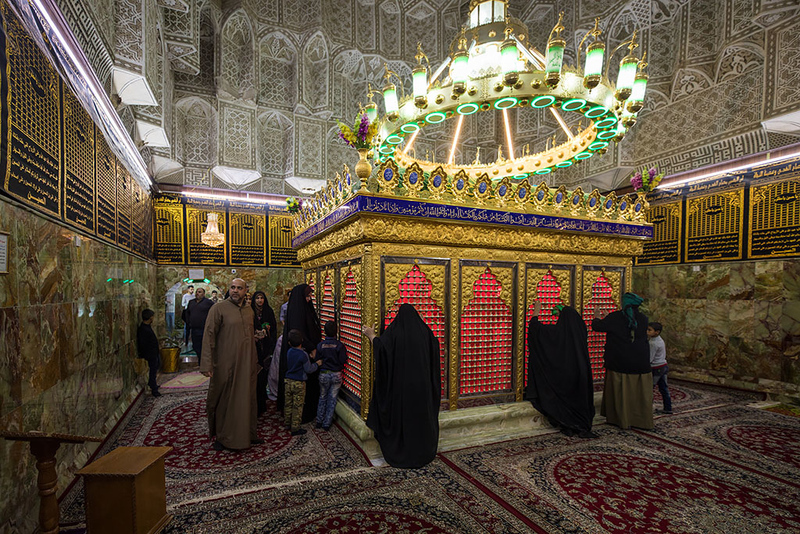 Salman al-Farsi was a companion of the Islamic prophet Muhammad and the first Persian who converted to Islam. 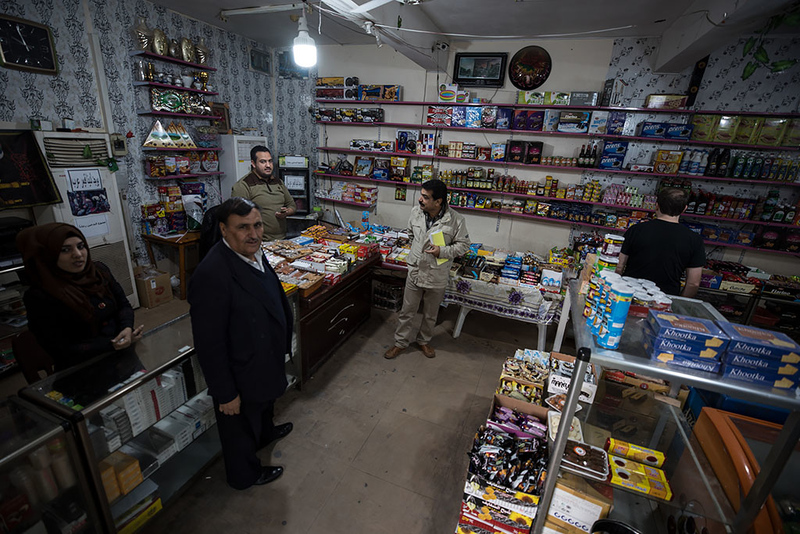 Offerings of Iraqi dinar notes. 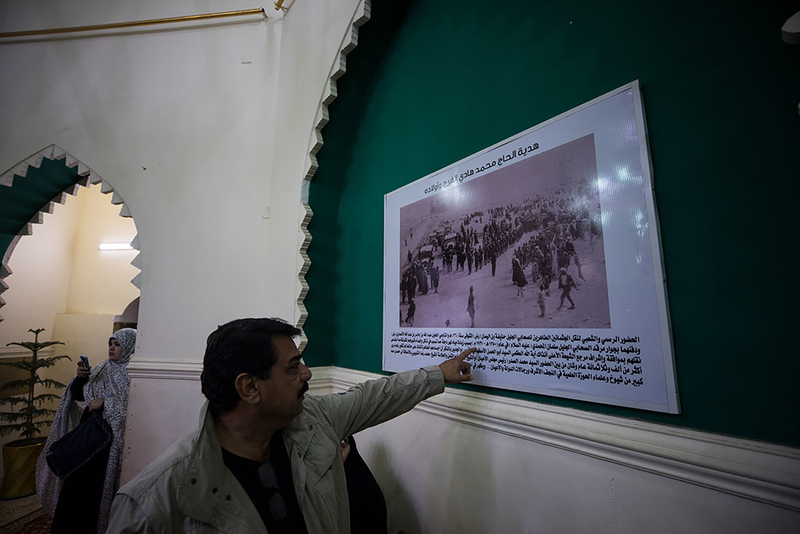 Raad explaining how the shrine was moved after it was flooded when the Tigris river changed course. 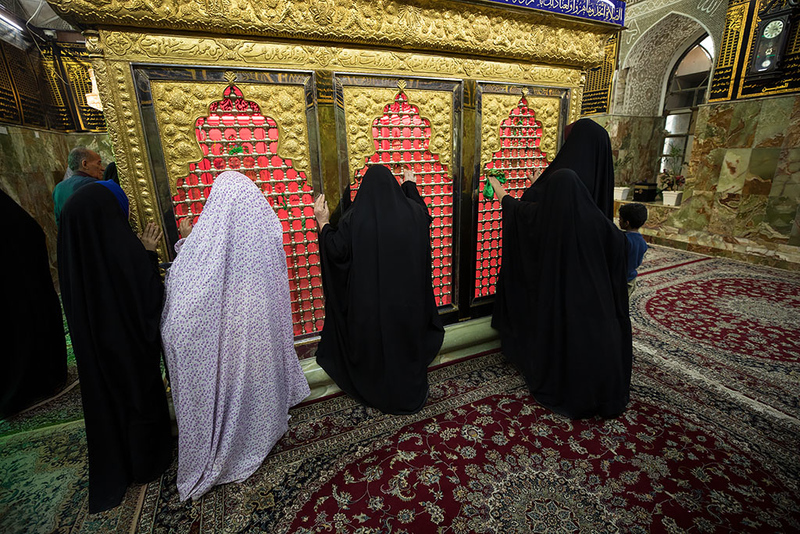 It was quite an experience to freely mingle with the worshippers paying their respects. We were then we invited to the office of the main administrator at the shrine for a meet, greet and tea. 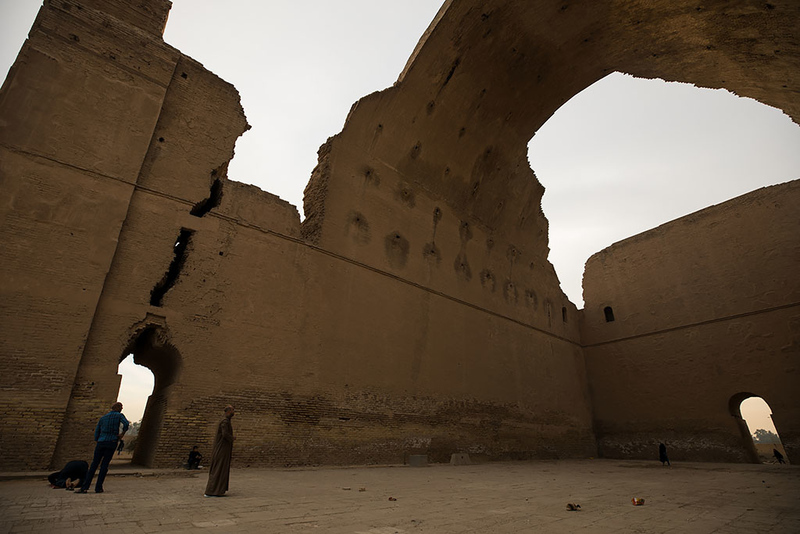 A short walk away from the shrine was the impressive ruins of Taq Kasra, or also often referred to as the Archway of Ctesiphon. Ctesiphon was an ancient city located on the eastern bank of Tigris. 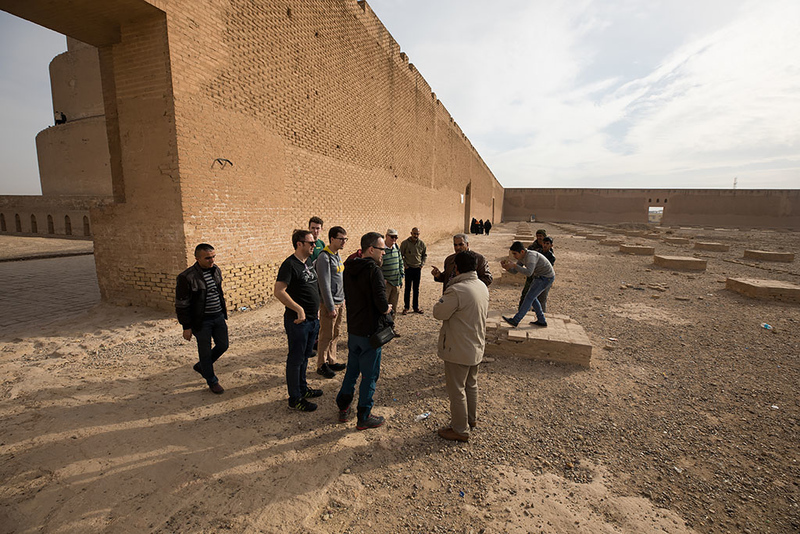 The archway is the last remaining structure and was once a part of the royal palace in Ctesiphon and is estimated to date between the 3rd and 6th centuries AD. The arch was in remarkably good condition considering its age. 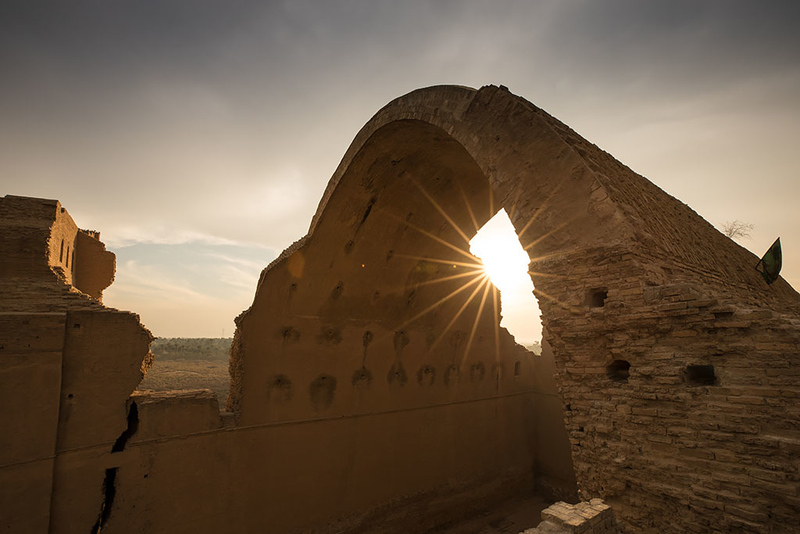 The structure was captured by the Arabs during the conquest of Persia in 637AD and then used for a while as a mosque before being gradually abandoned. 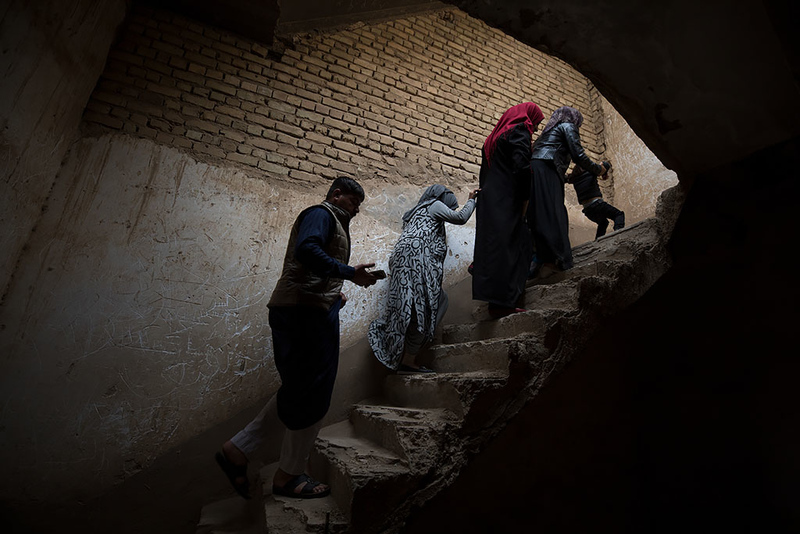 Climbing the stairs of the northern wing which was partially rebuilt by the Saddam Hussein government in the 1980's. The late afternoon sun shining through the arch, which is also the largest single-span vault of unreinforced brickwork in the world. 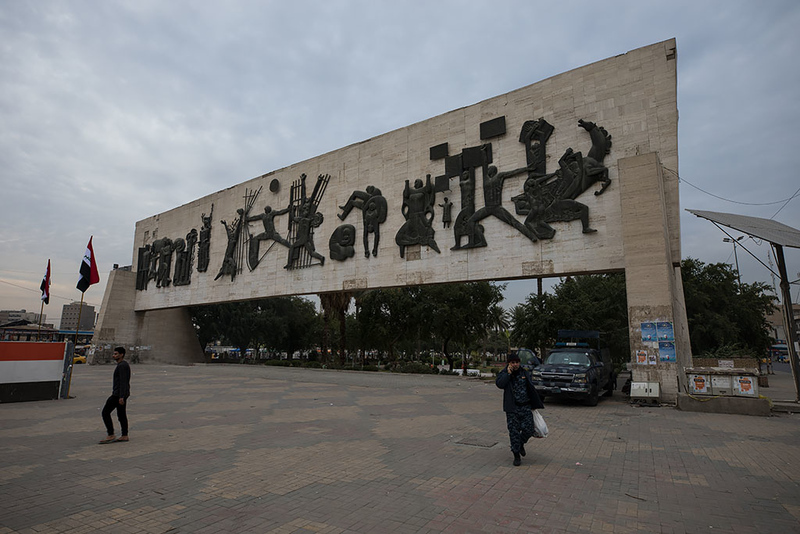 A short walk from the arch was an old Baathist Party Monument. It was quite a striking, monolithic building with no windows and almost resembled a fortress or military bunker. Inside the ruined structure there was little left apart from concrete and brick walls. 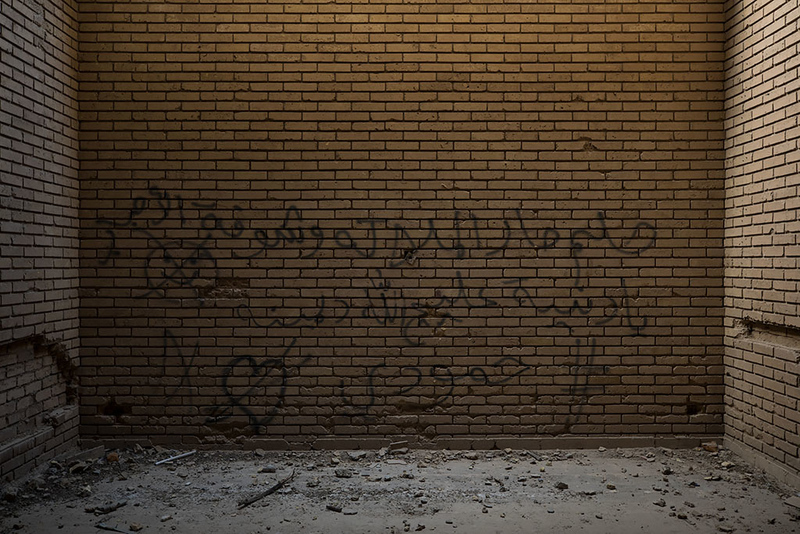 Arabic graffiti covering one of the walls. We climbed up the dark stairs to the roof of the building. Looking down on a swimming pool and relaxation area for Baathist Party members. The structure was also used as a lookout point by the Americans during the US occupation. 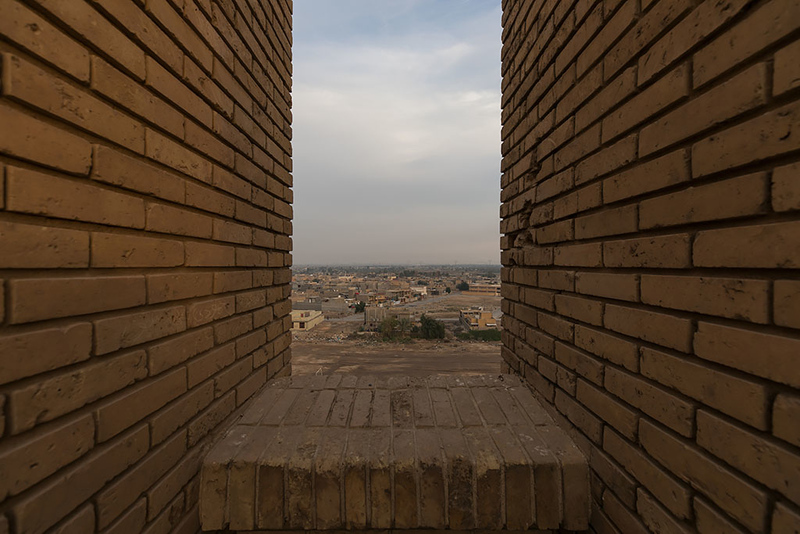 Looking west to the Archway of Ctesiphon as the sun begins to set on the horizon. 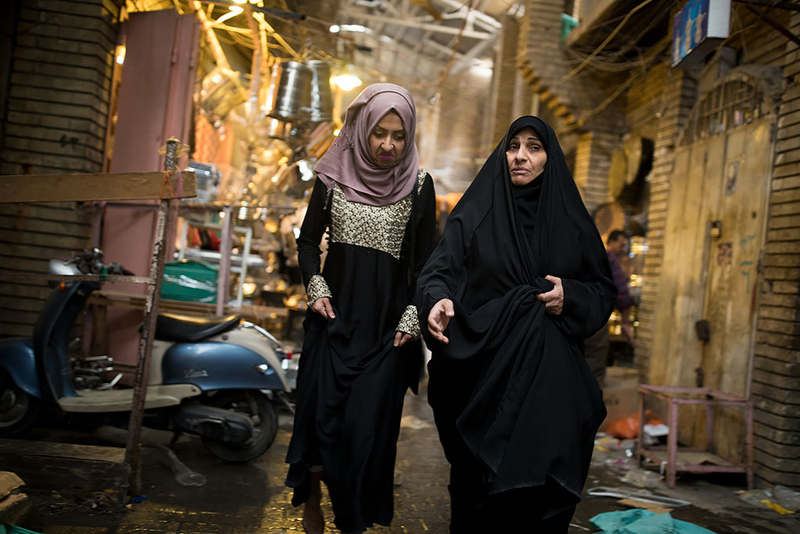 We then walked back through the streets of Salman Pak. 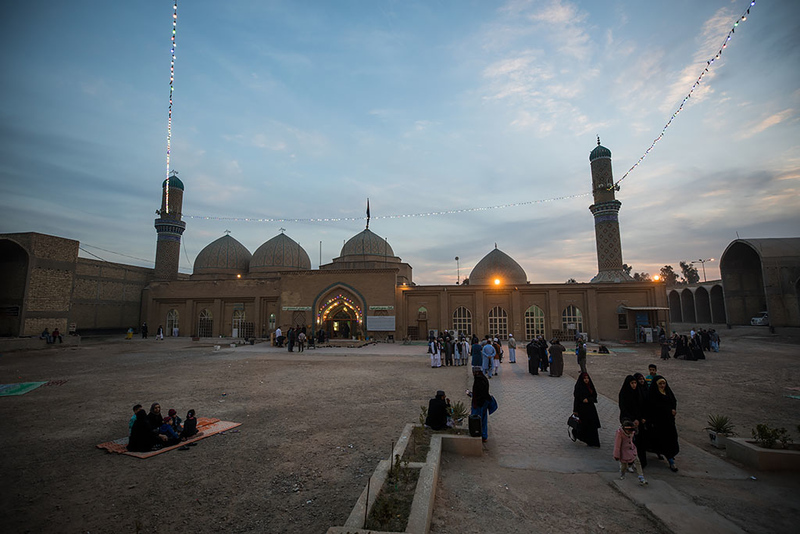 And outside Al Sahaabi Salman Al Farsi Shrine again at dusk. 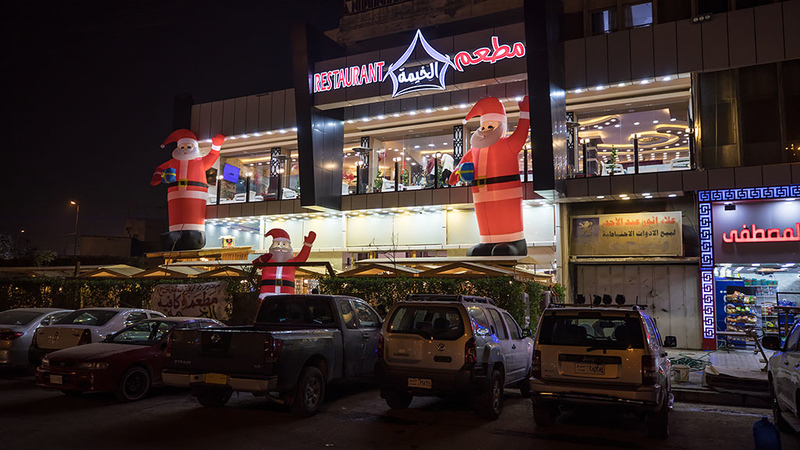 Back in Baghdad we headed to a Mateam Restaurant for dinner. Complete with the skyline of Dubai inside. 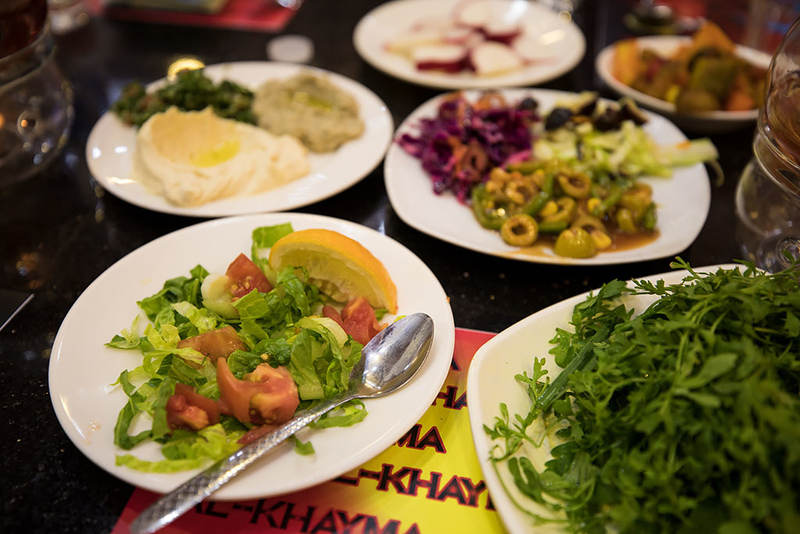 Salad and mezze to start. 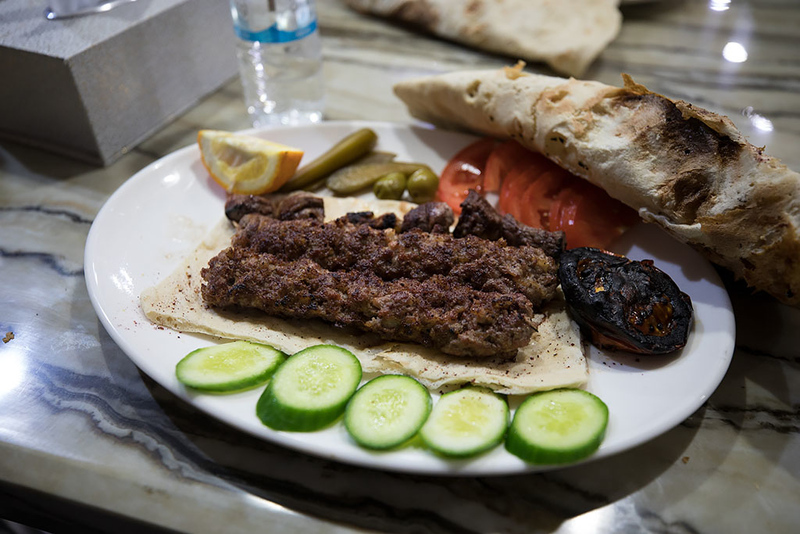 And some tasty mixed kebab at the end of another very interesting day in Iraq.